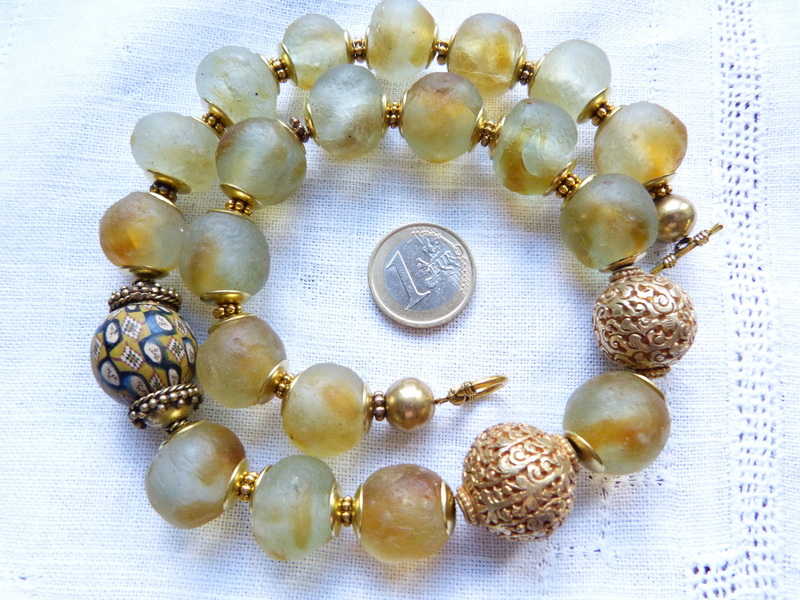 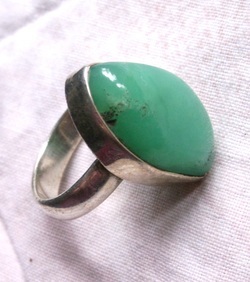 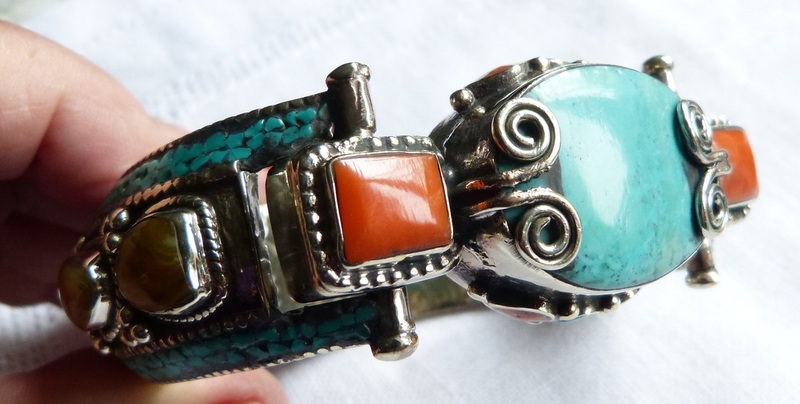 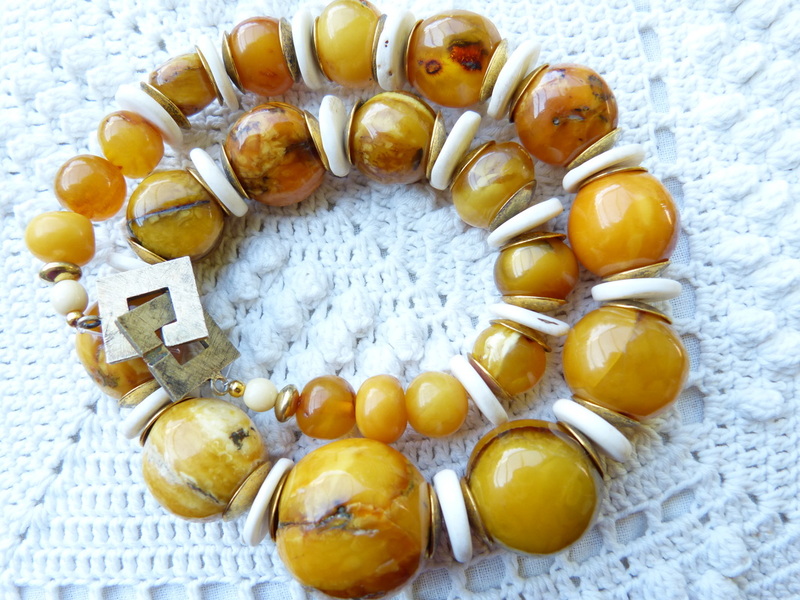 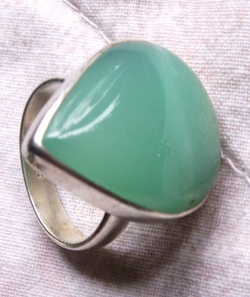 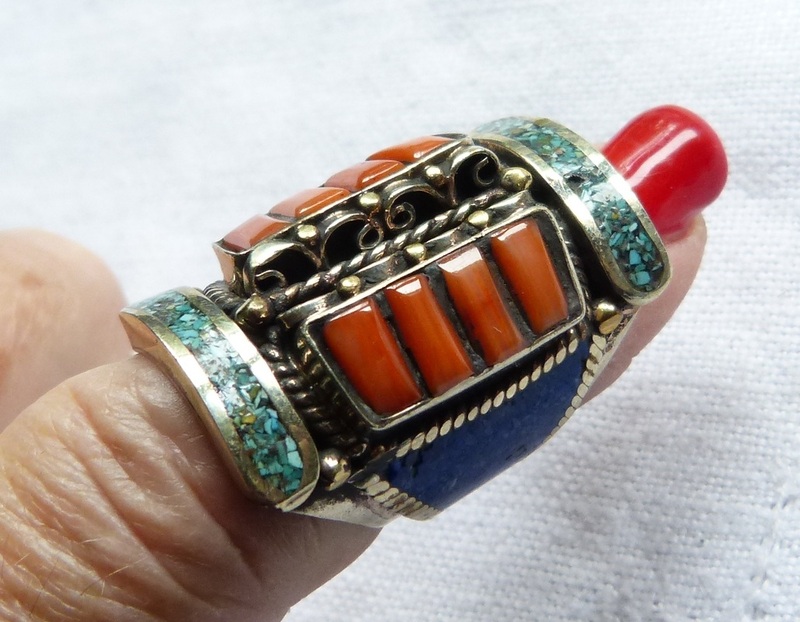 Absolutely exceptional combination of antique repaired/decorated amber beads and old large amazonite from Mauretania. 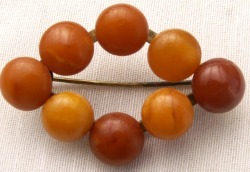 Maure and Berber women decorated their amber hairbeads with little copper decorations, or used the decoration to reassemble broken beads. 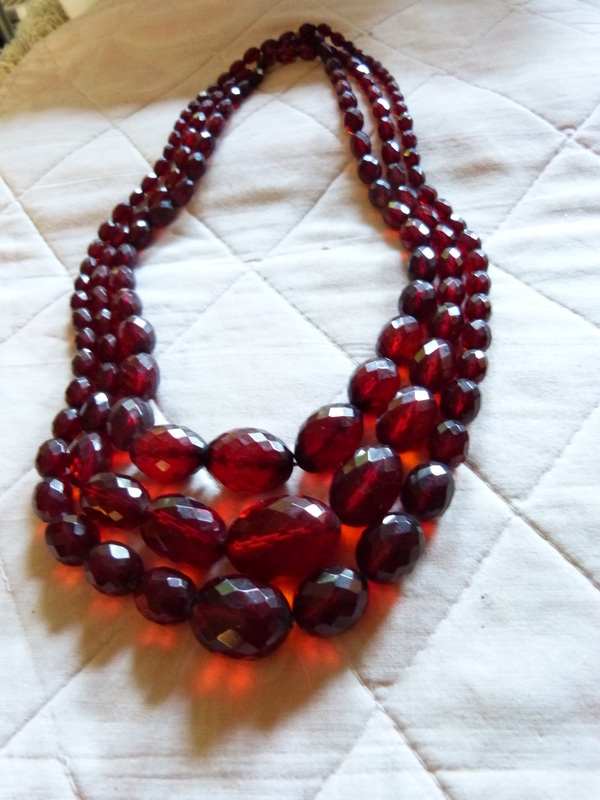 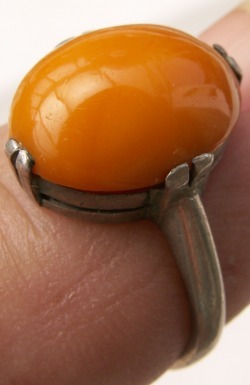 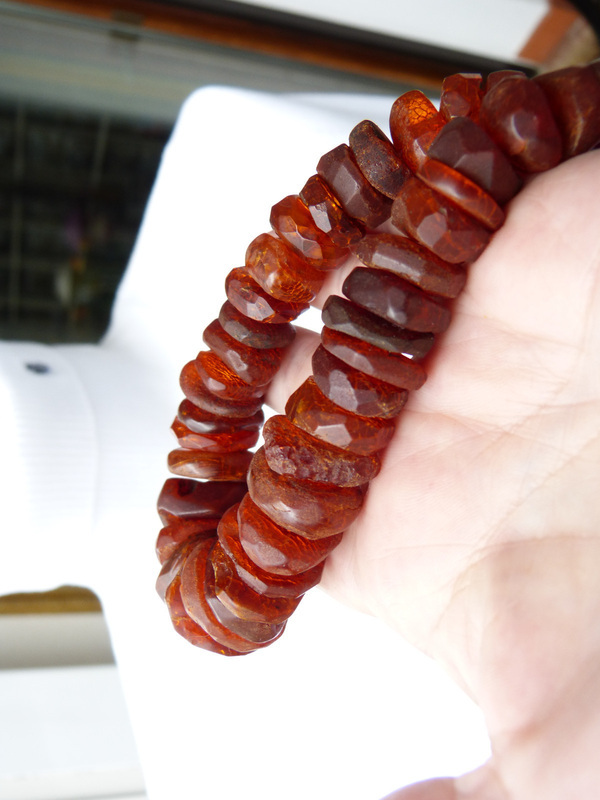 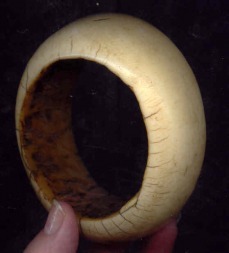 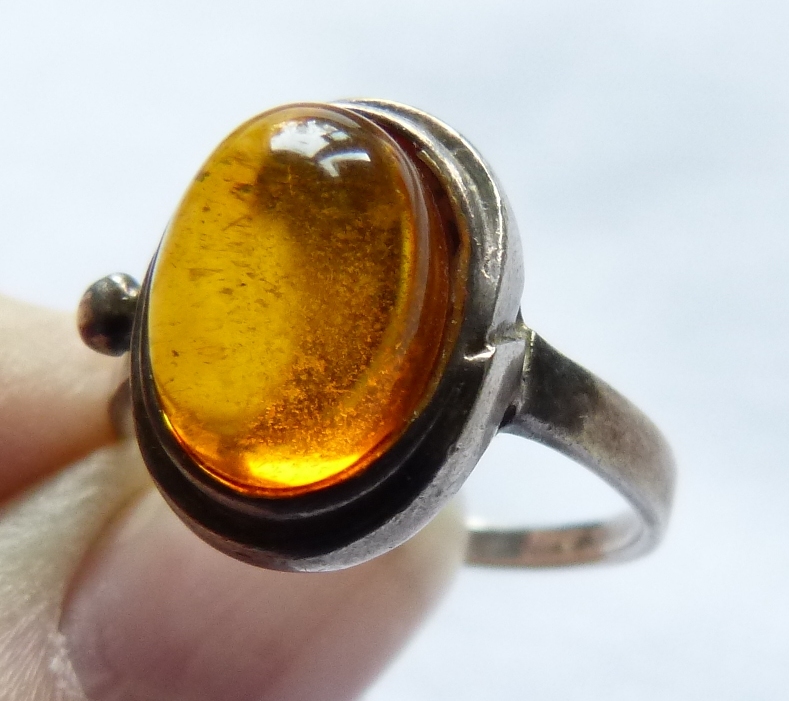 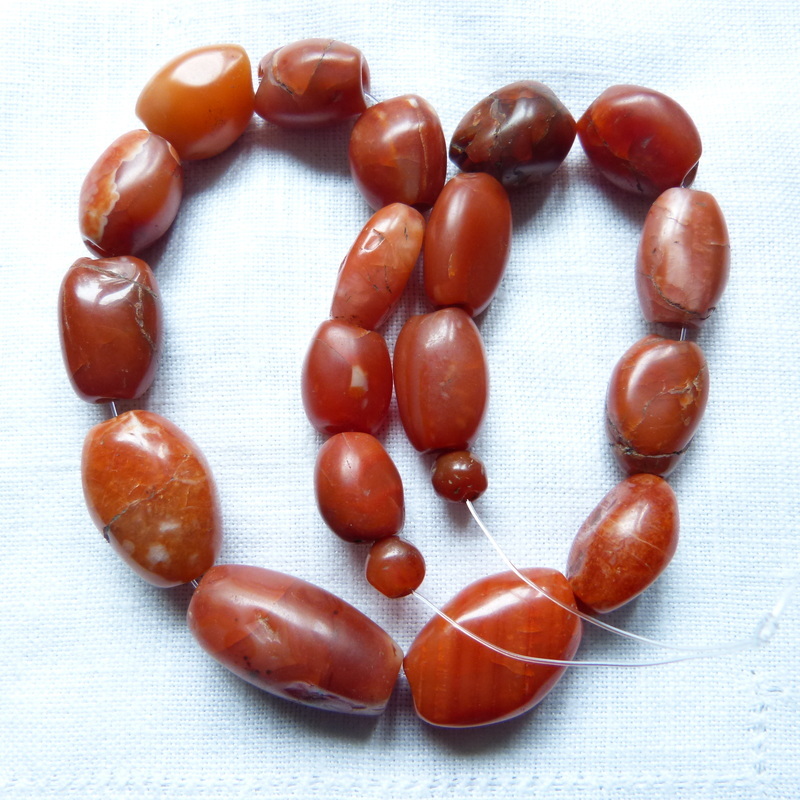 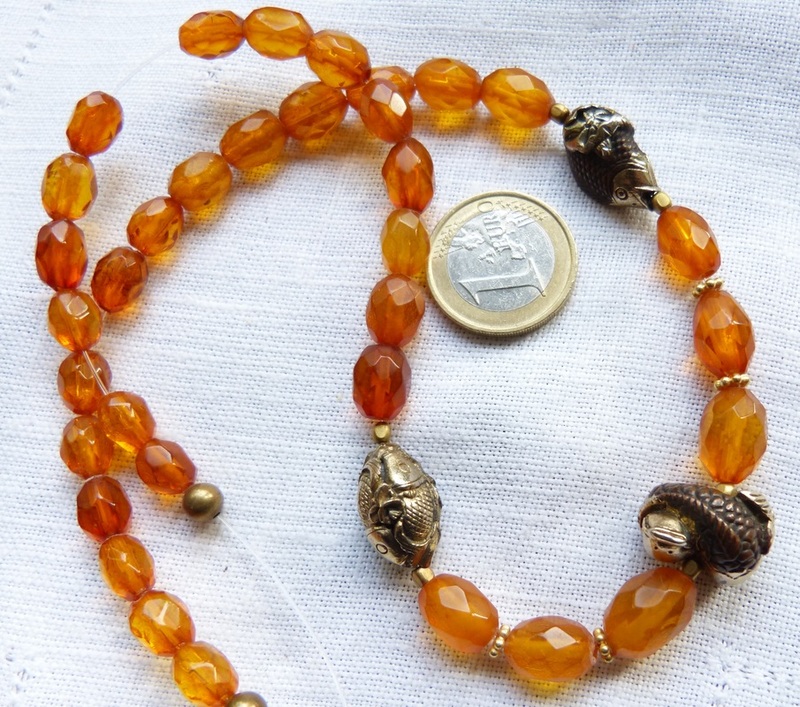 These are the most sought after amber beads today - very very rare! 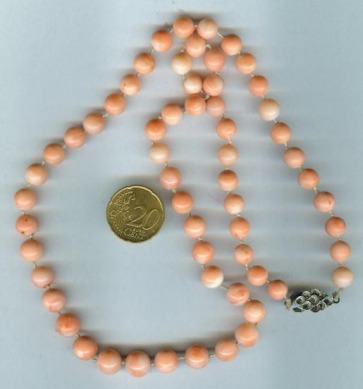 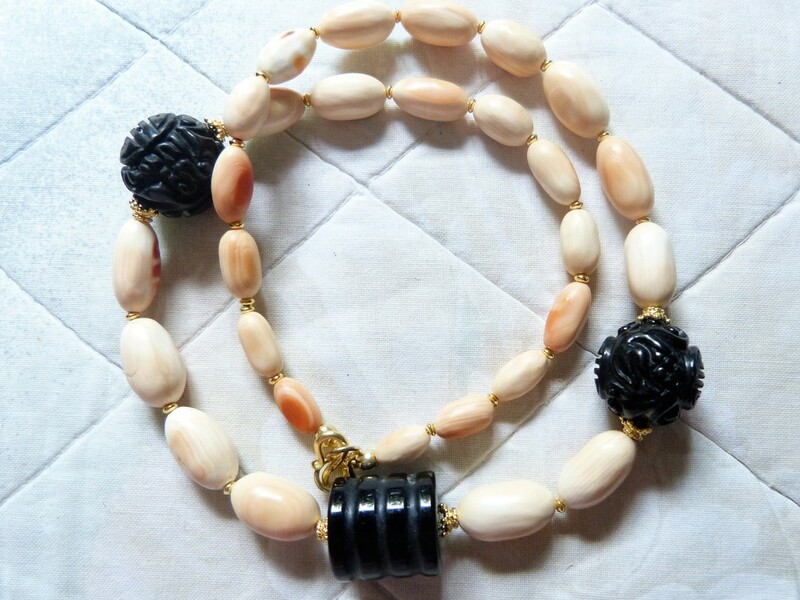 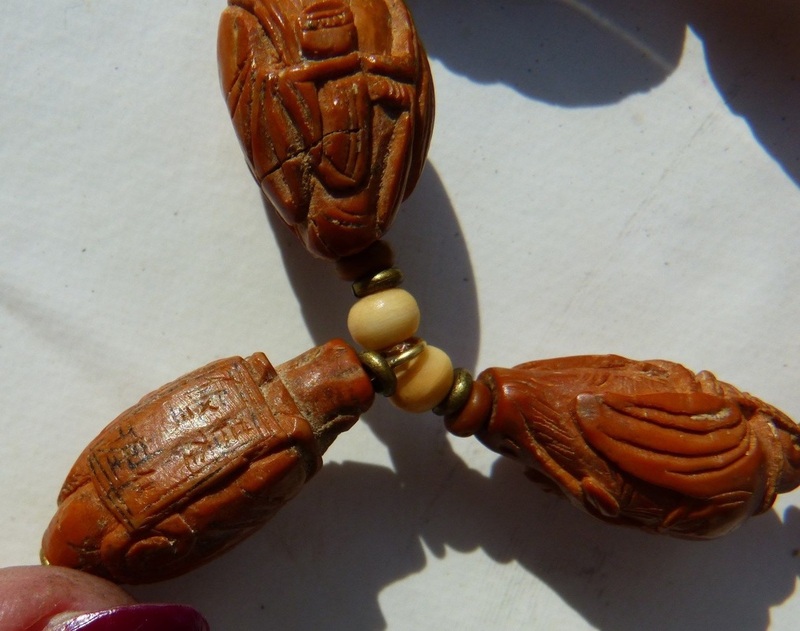 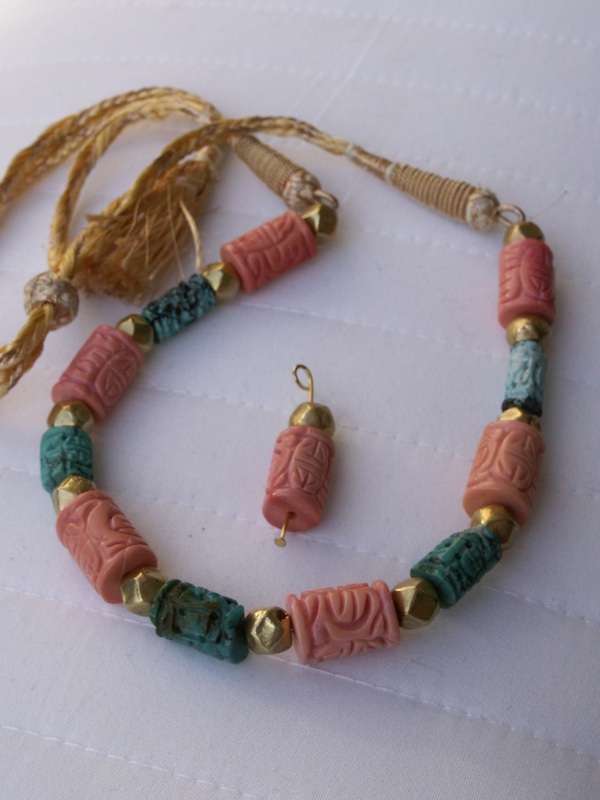 Gorgeous vintage Chinese carved pink coral Shou beads, pink three strand coral necklace with 14 K gold accent beads .Chinese Shou beads (longevity beads) are old but unused beads. 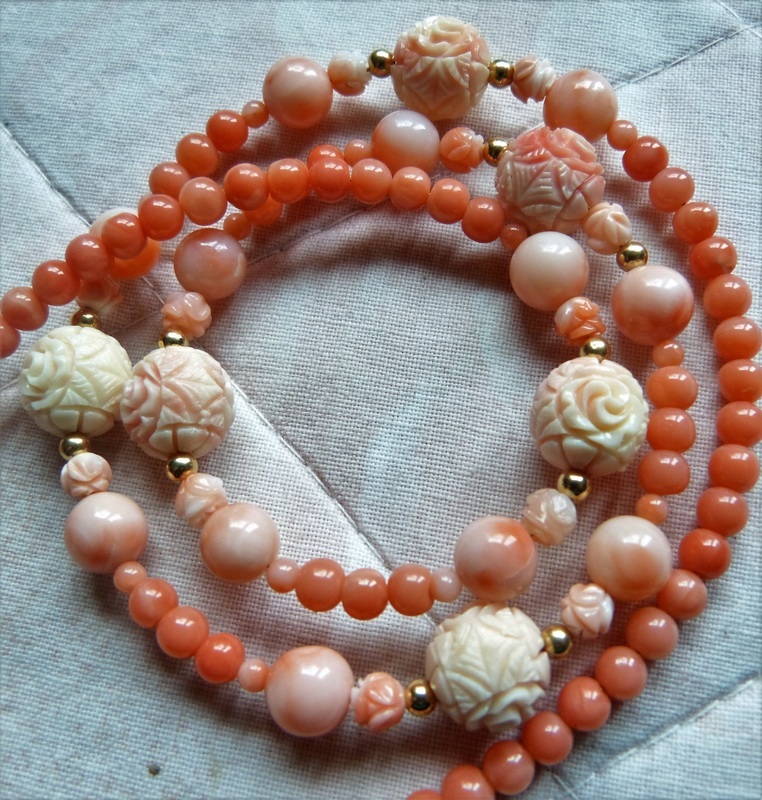 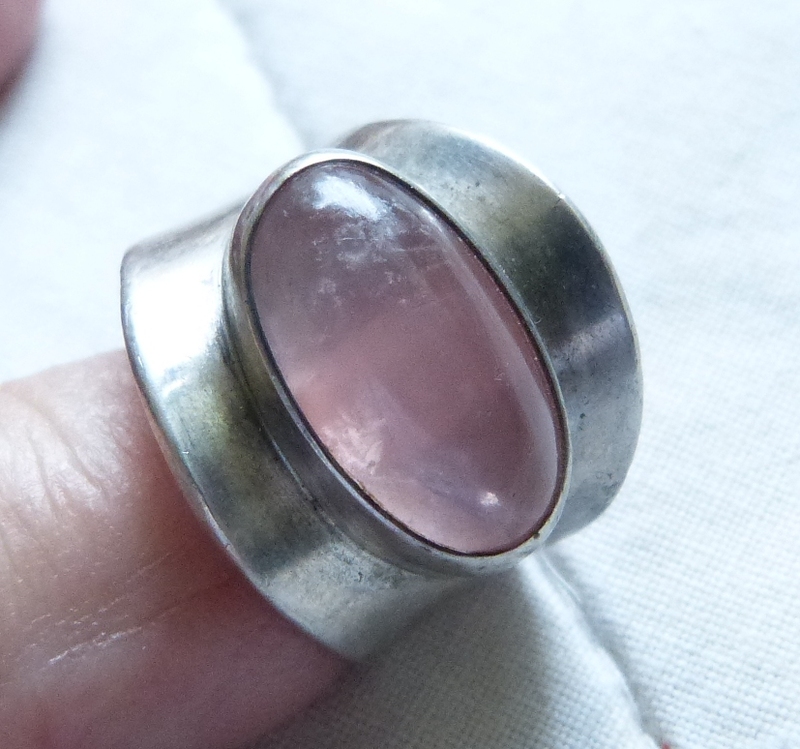 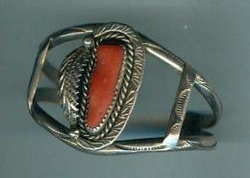 Natural coral, color enhanced in shades of light pink. 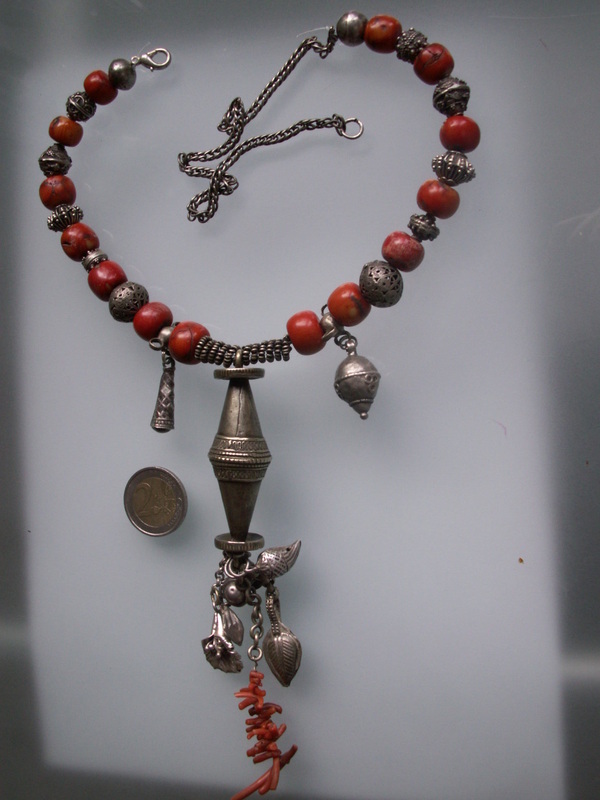 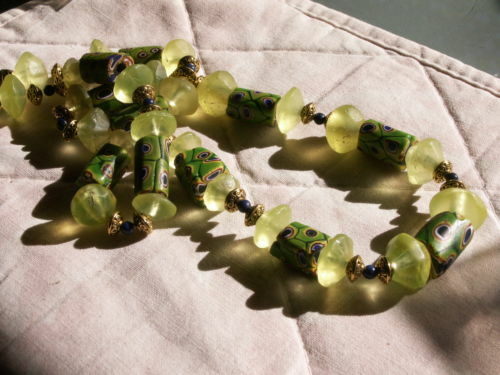 Senegal "or du pays" and transparent Dutch glass beads from the mid 1700s. 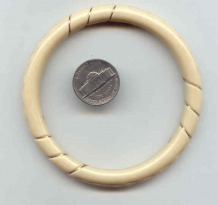 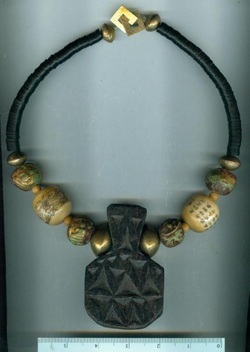 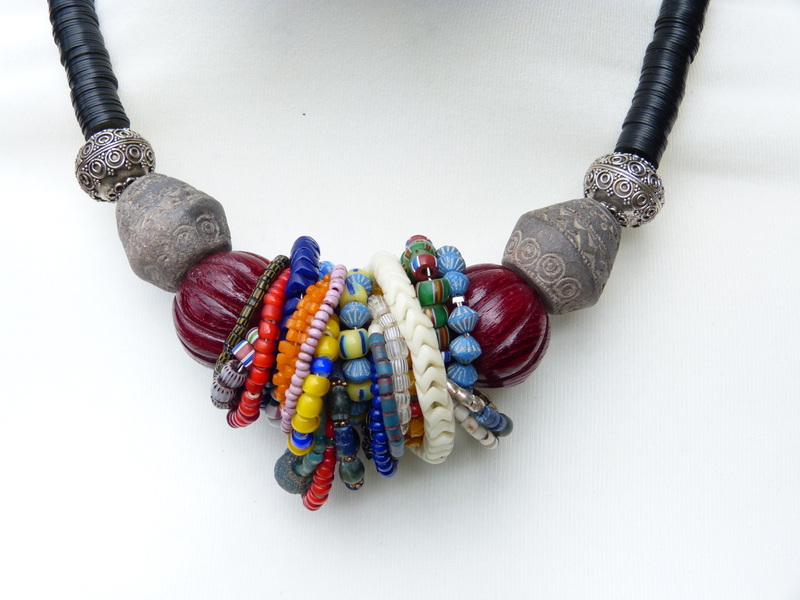 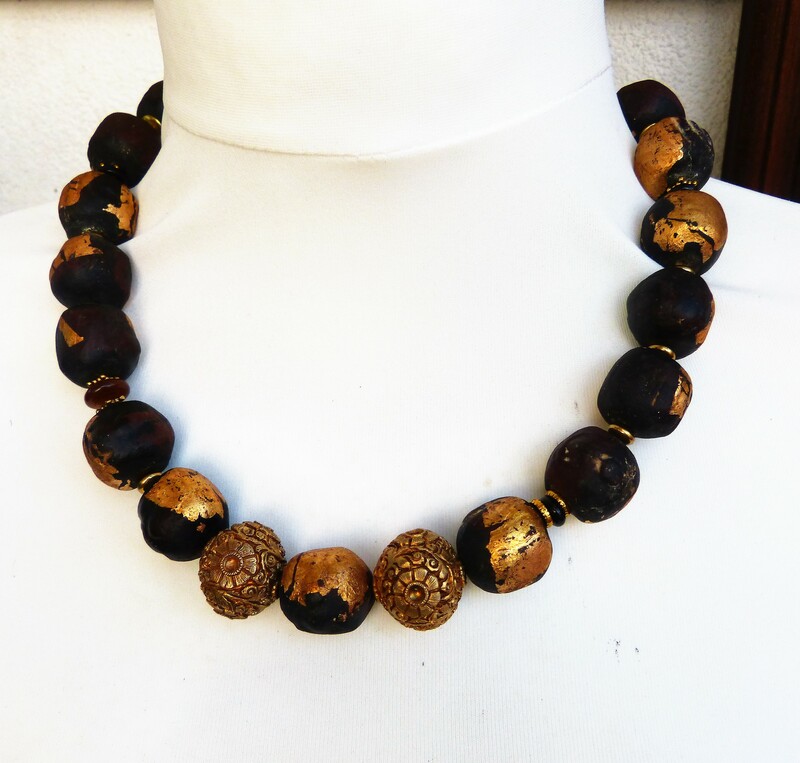 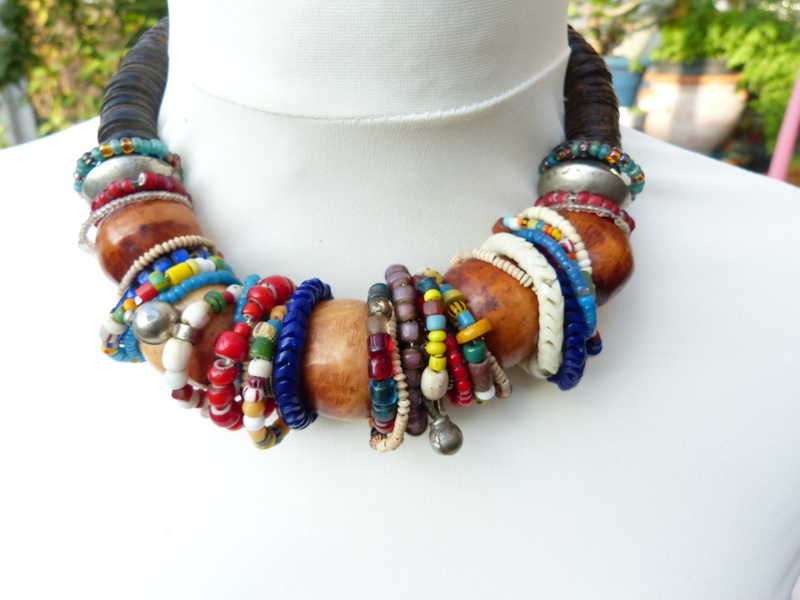 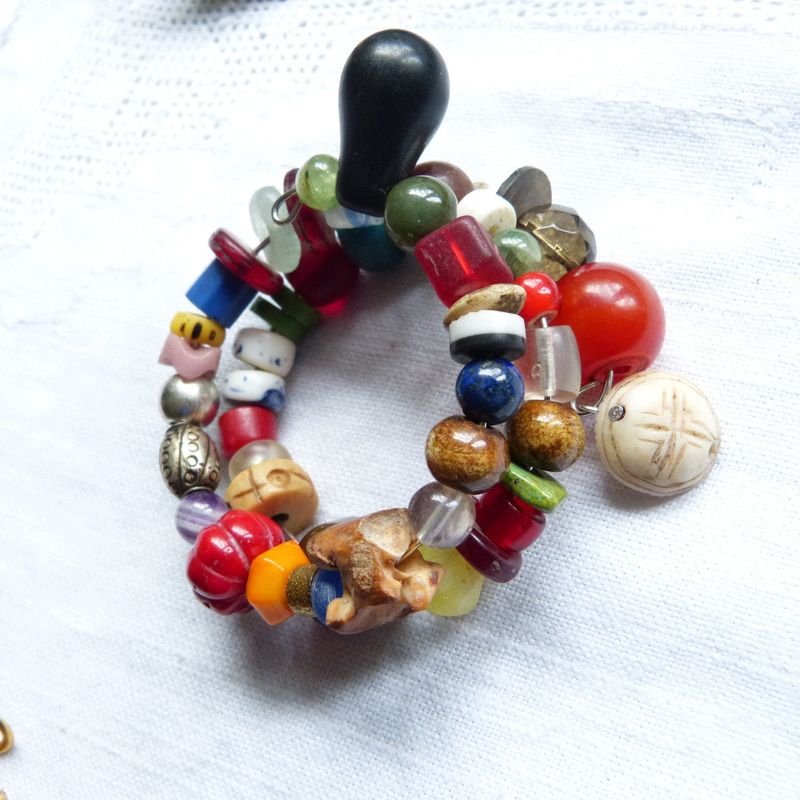 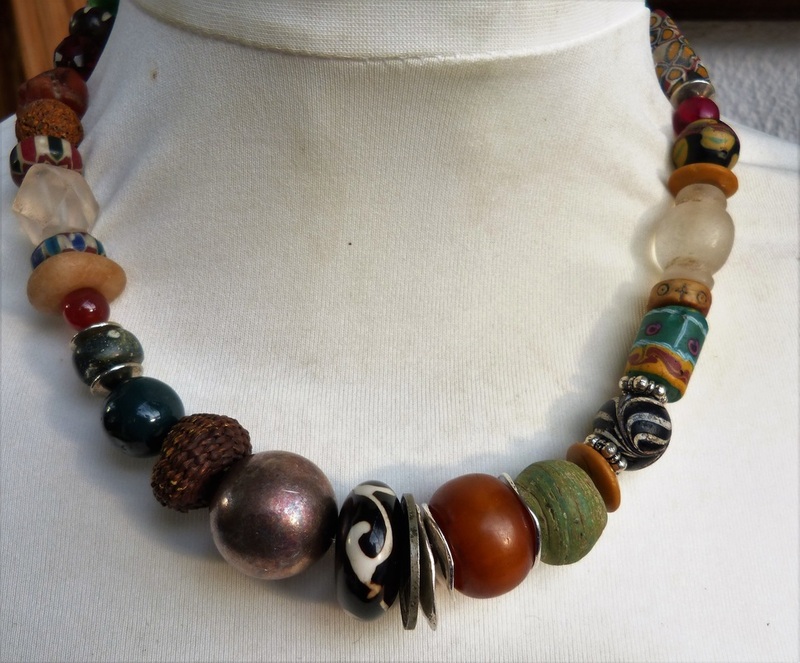 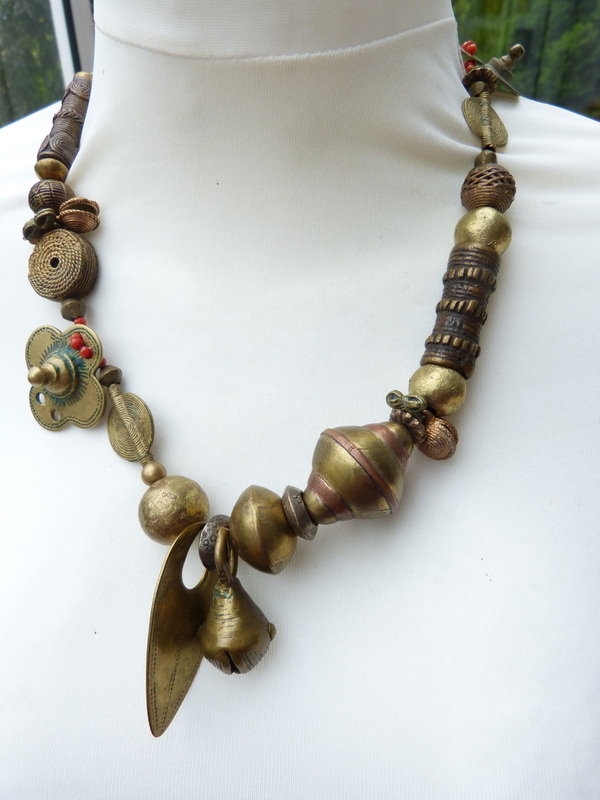 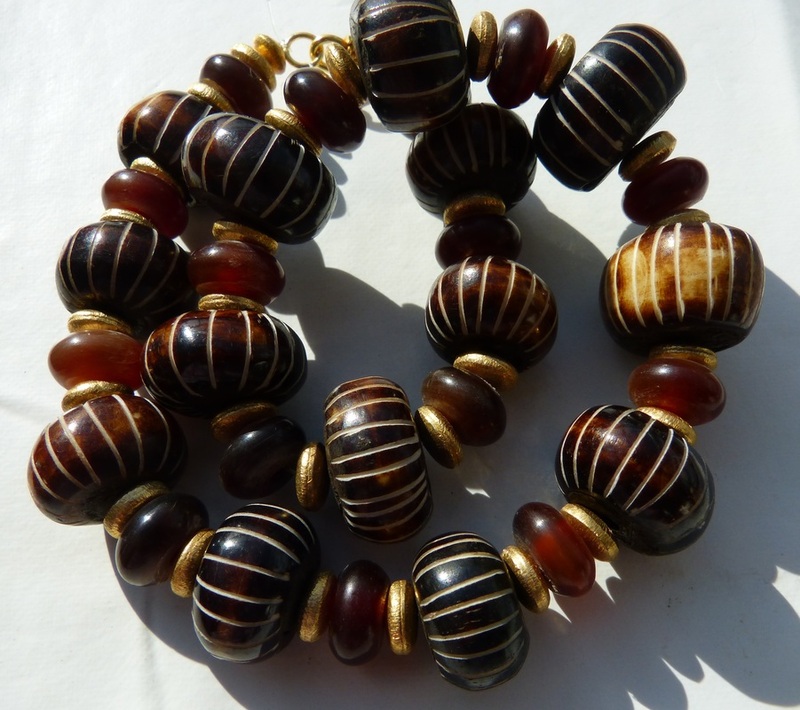 In Africa, especially Mali, called "television" beads. 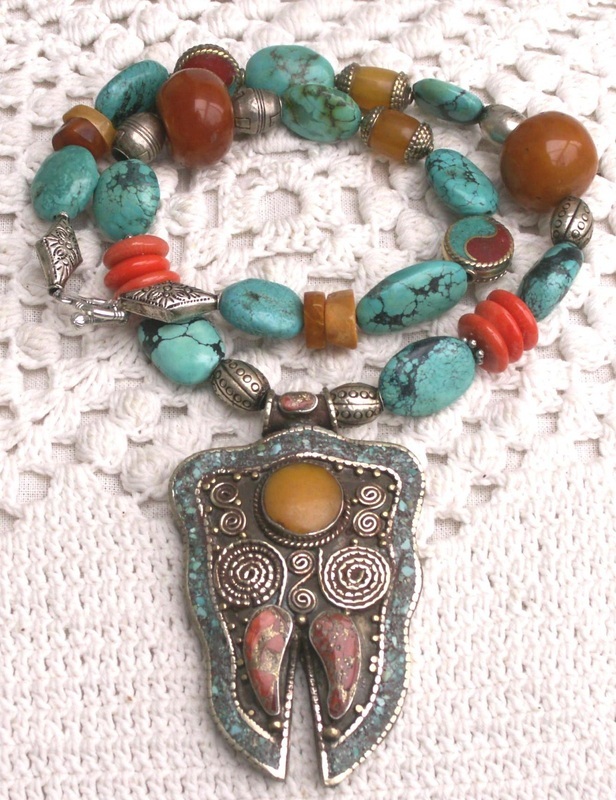 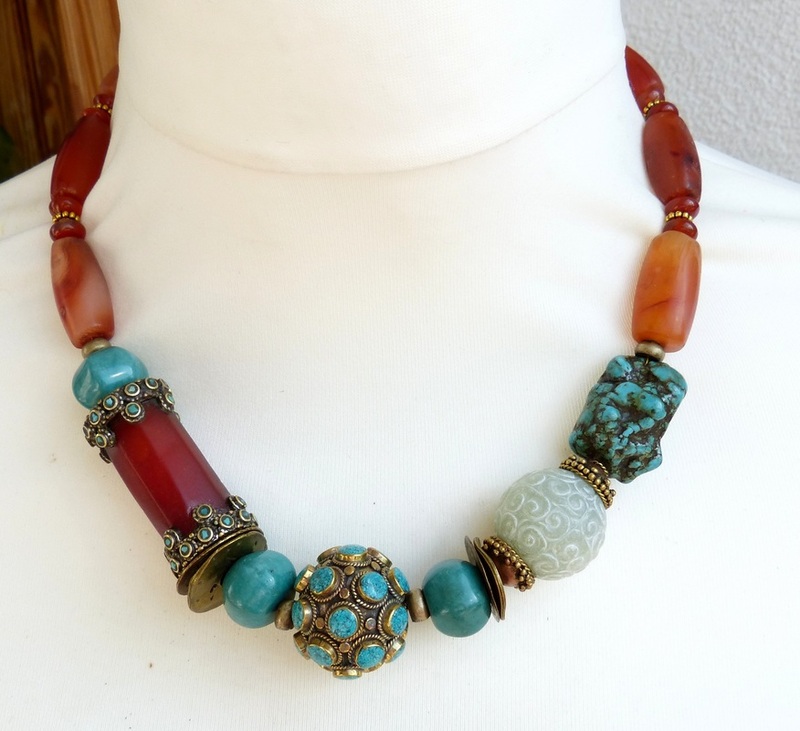 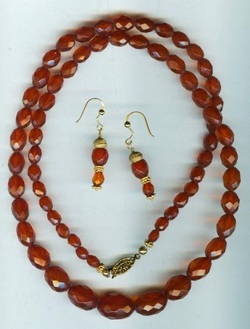 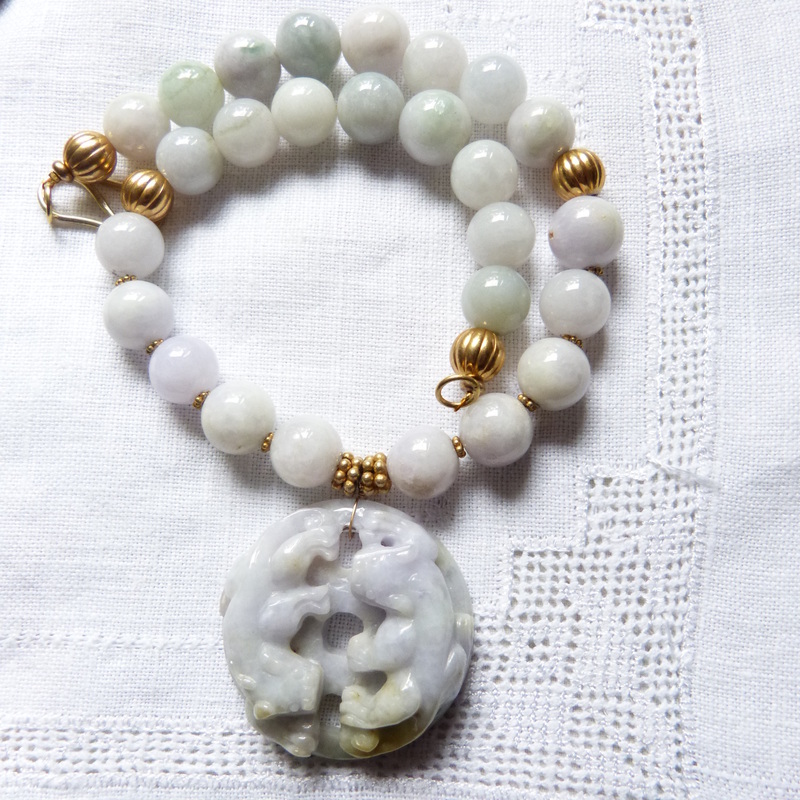 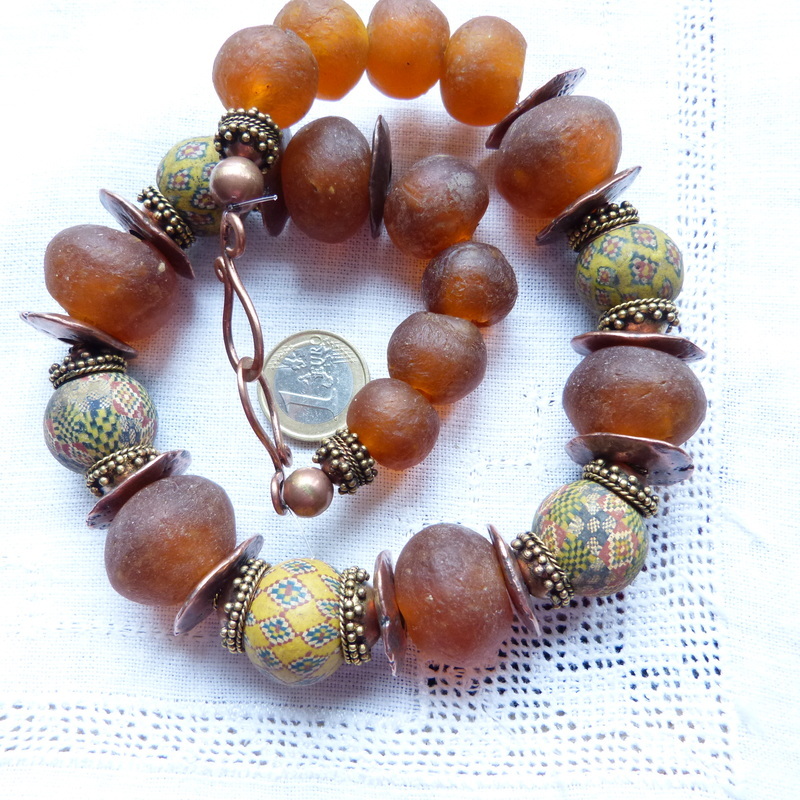 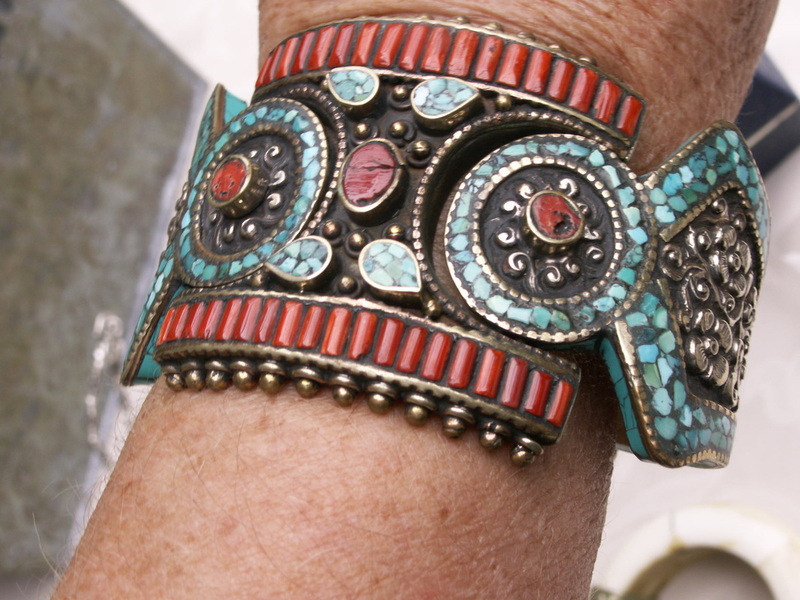 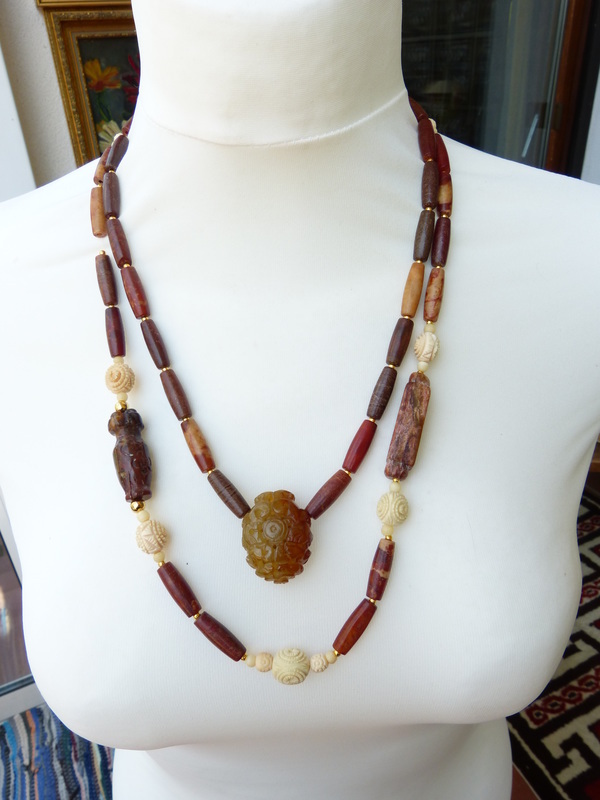 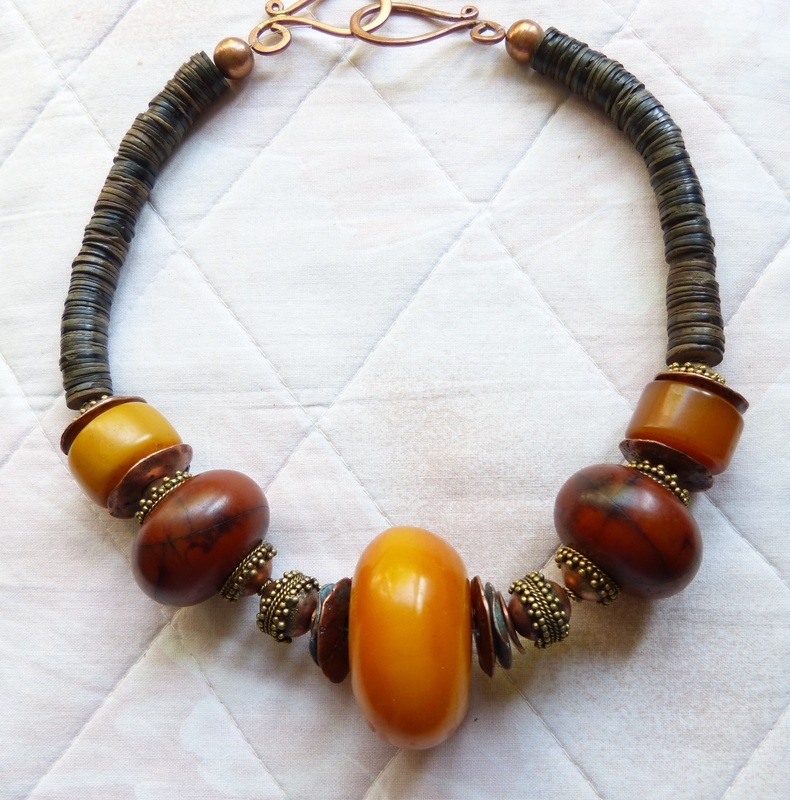 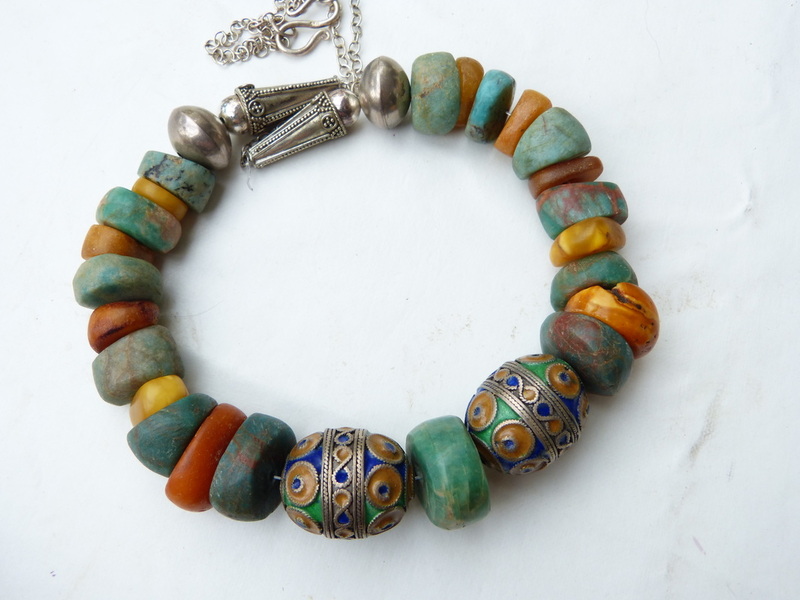 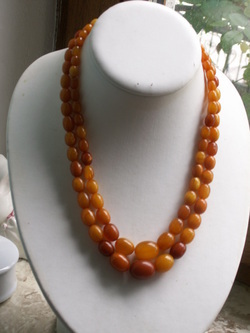 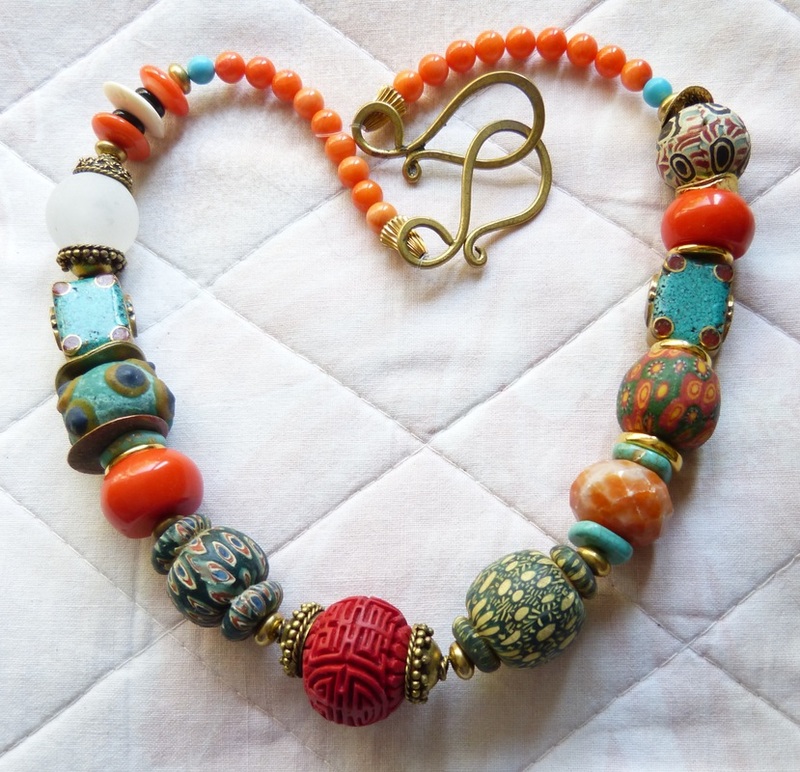 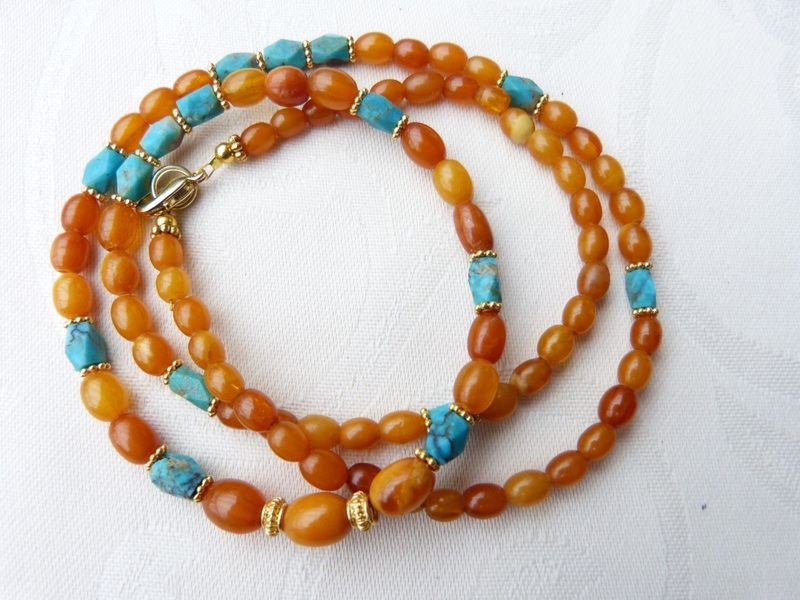 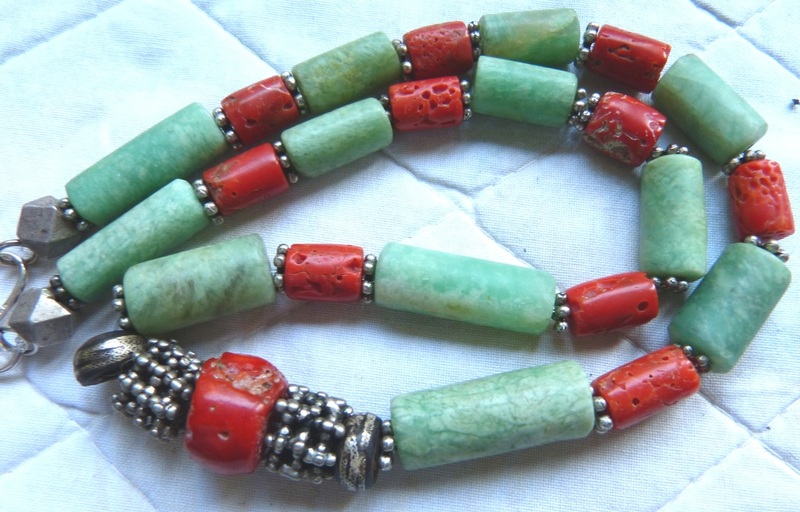 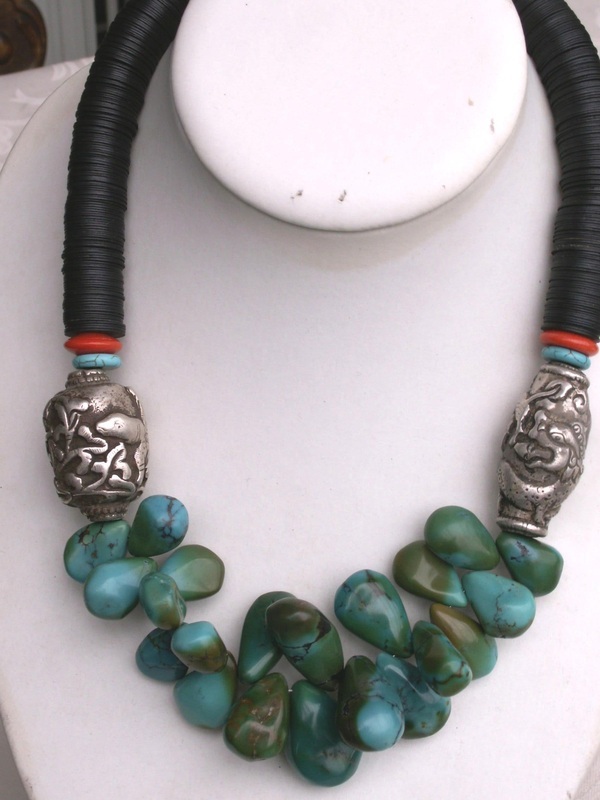 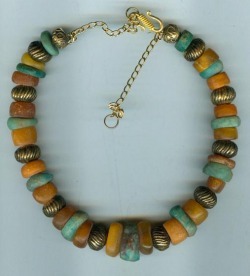 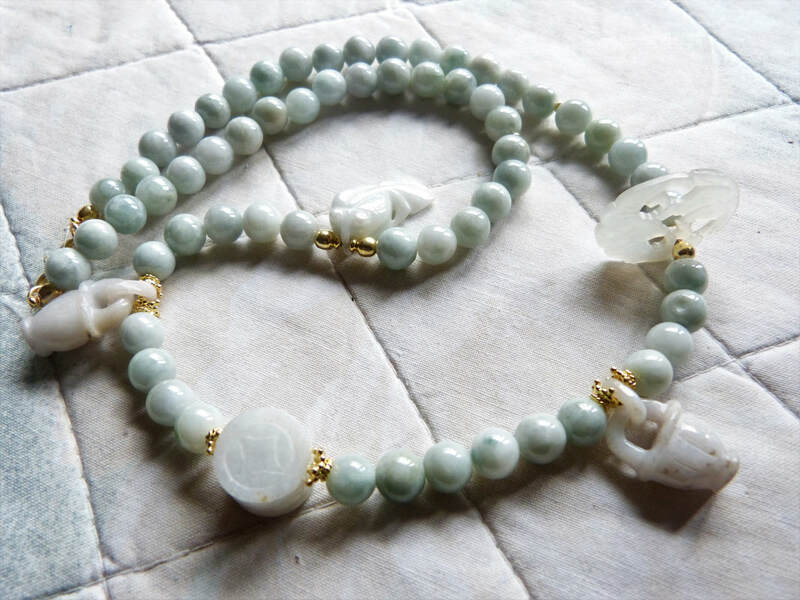 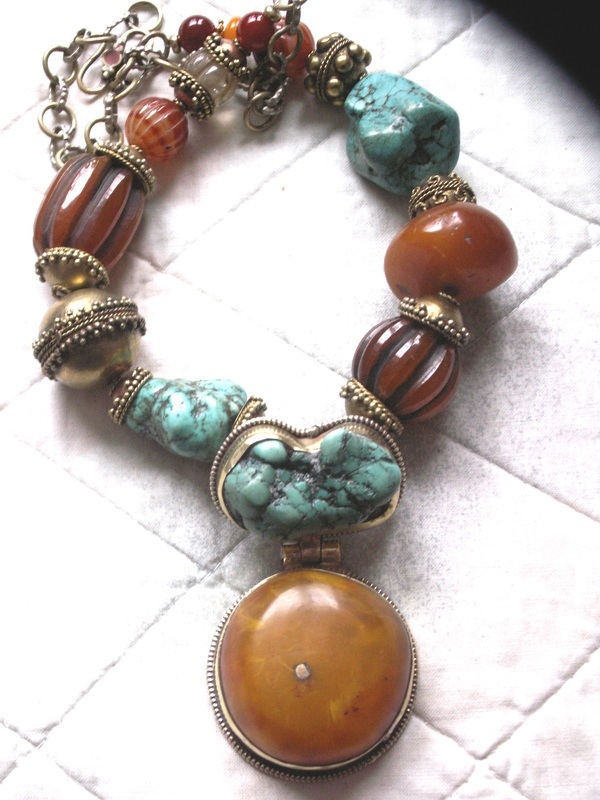 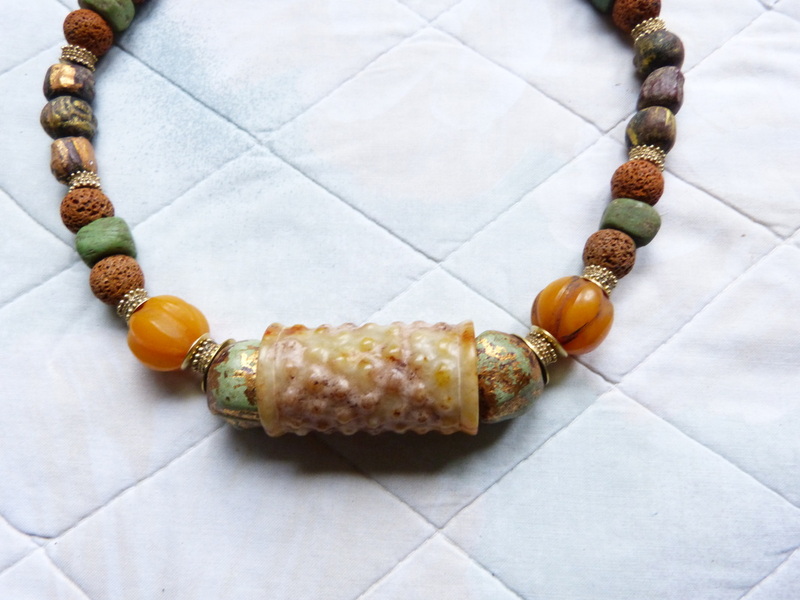 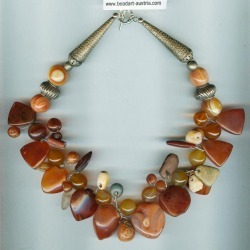 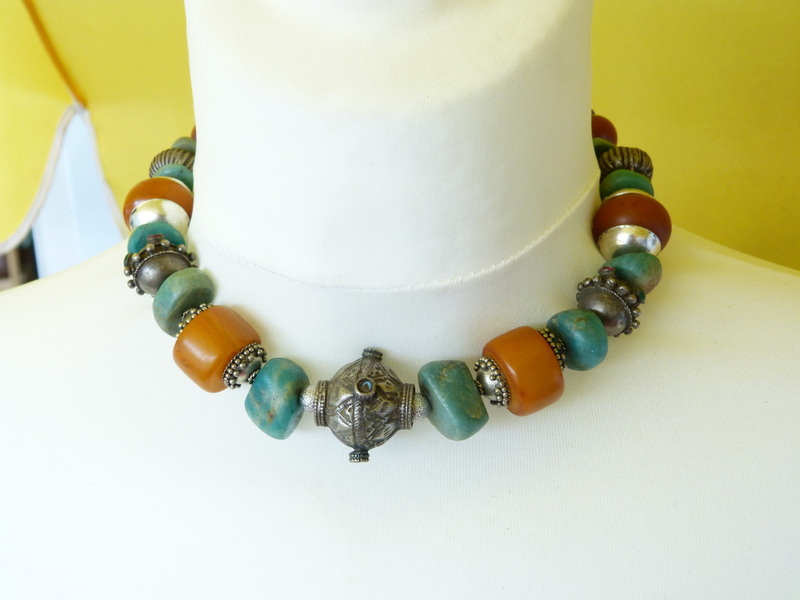 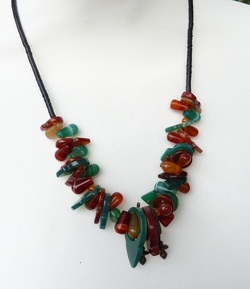 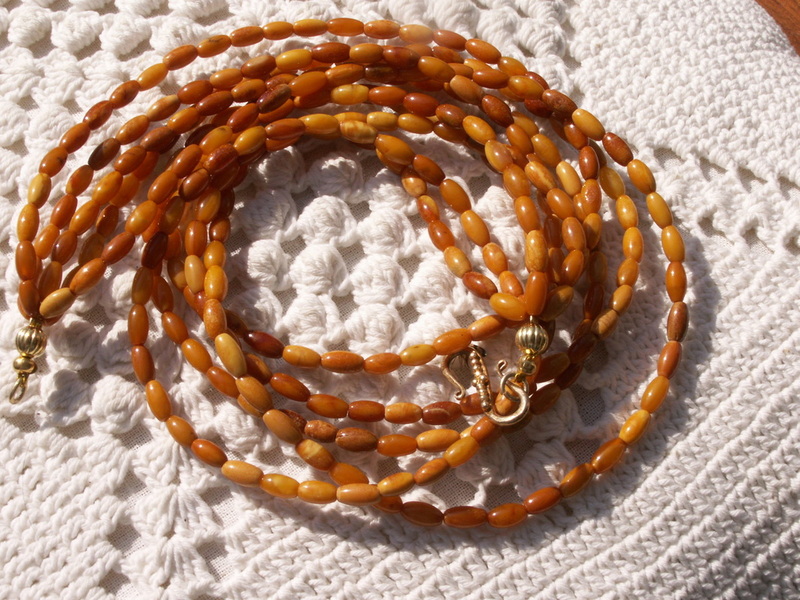 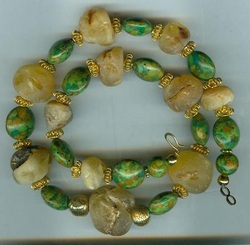 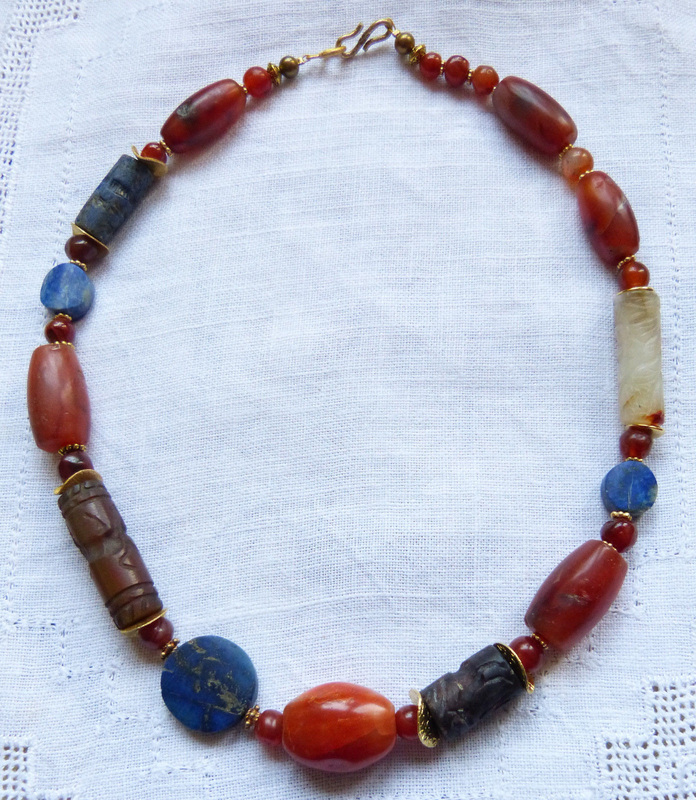 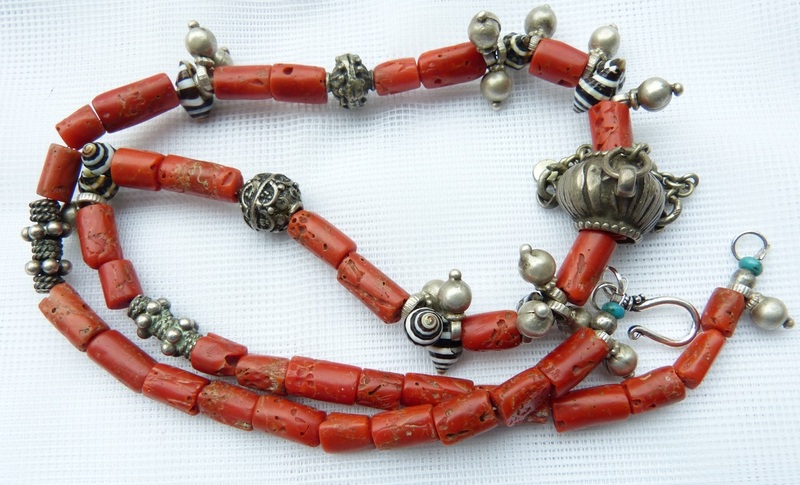 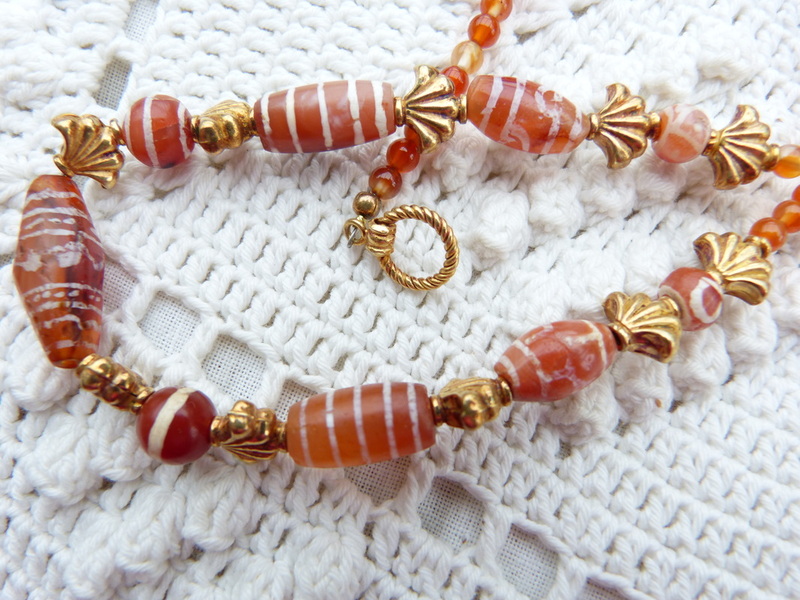 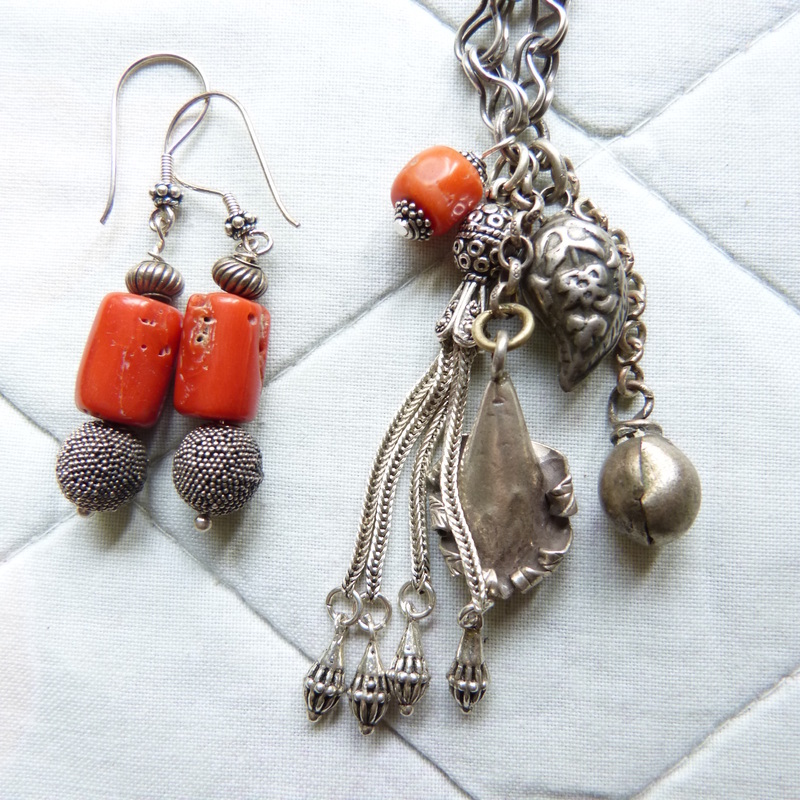 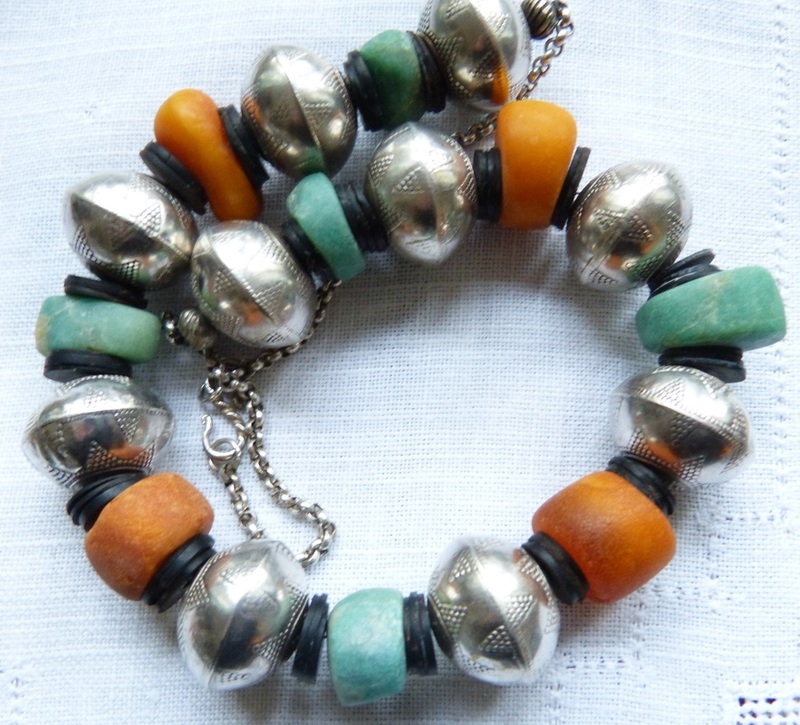 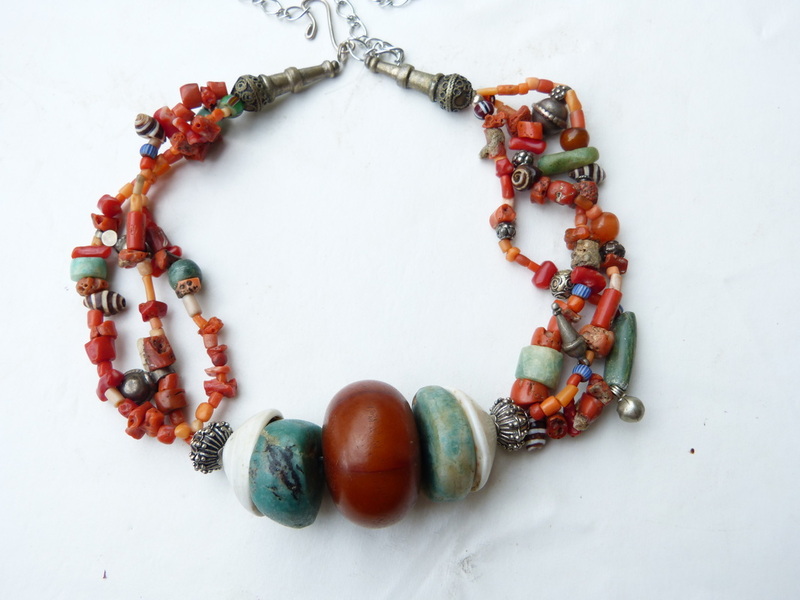 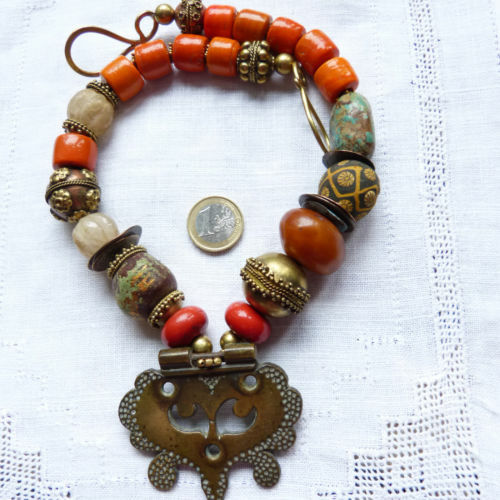 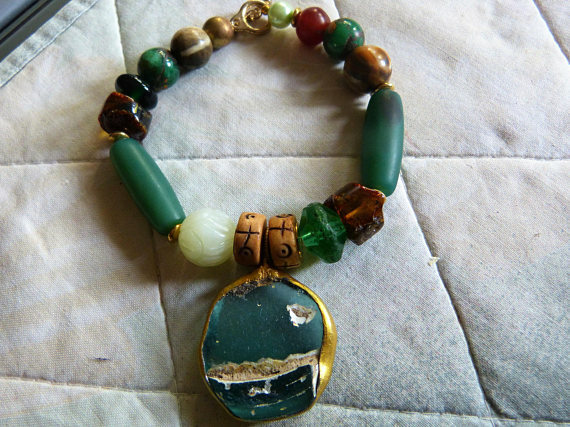 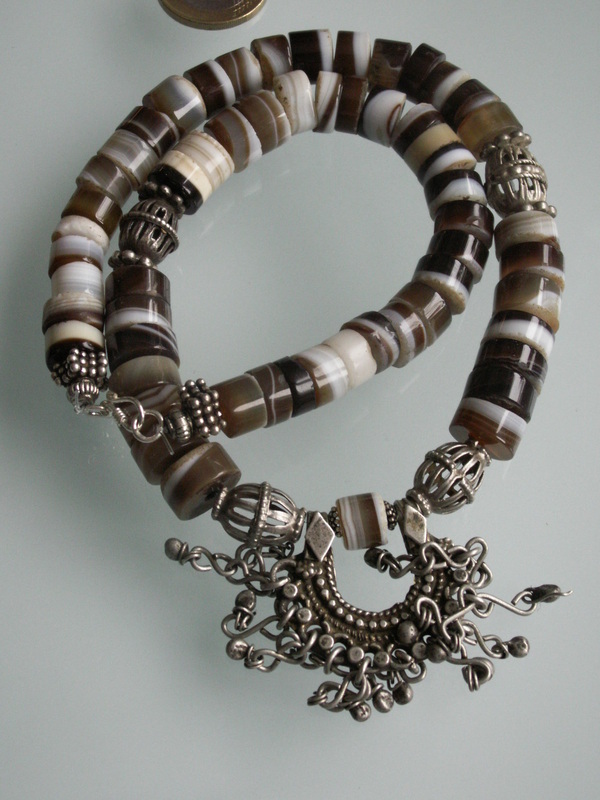 An exceptional combination of beautifully colored antique amazonite beads and genuine antique Mauretanian amber beads. 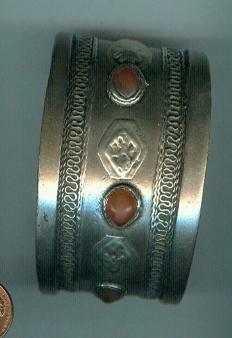 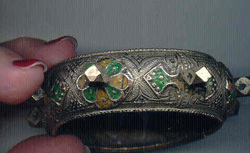 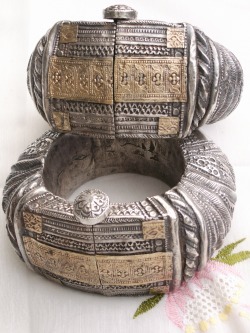 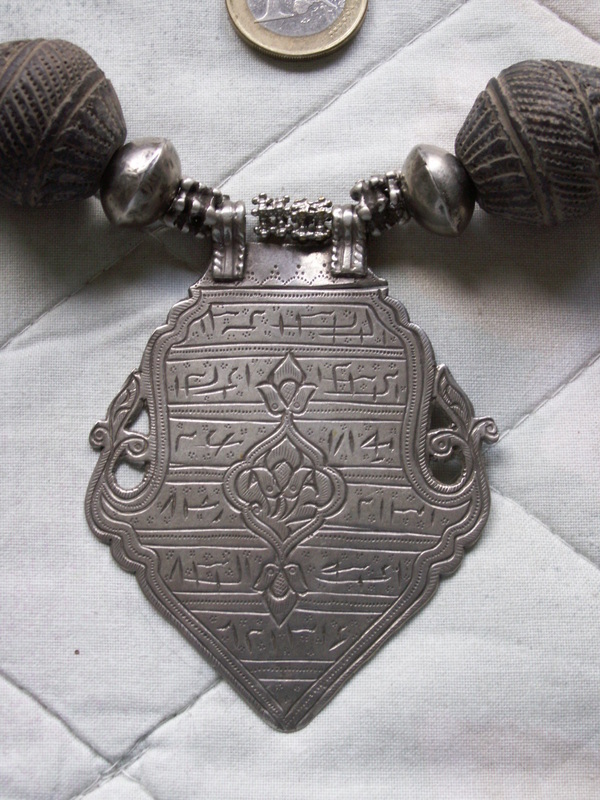 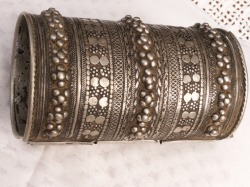 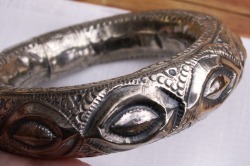 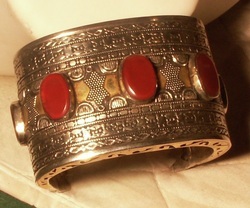 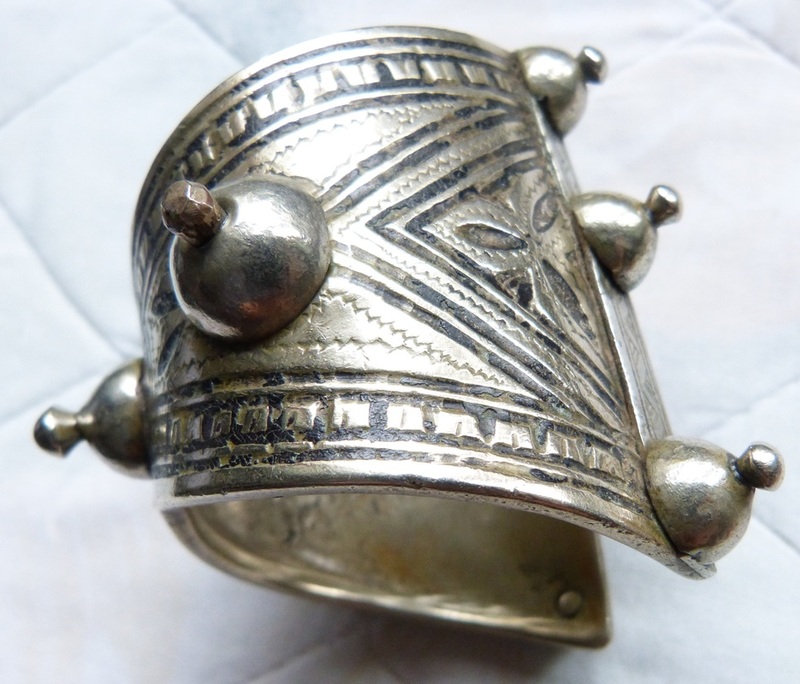 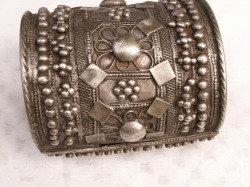 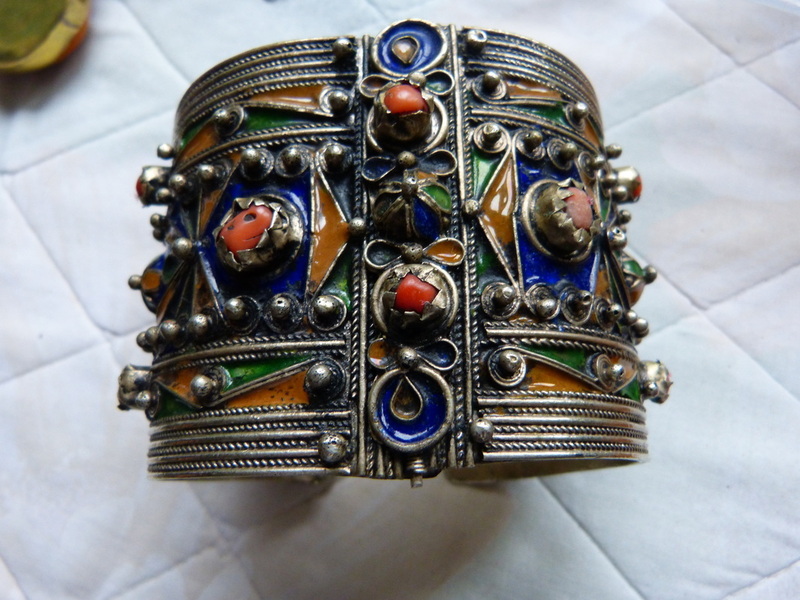 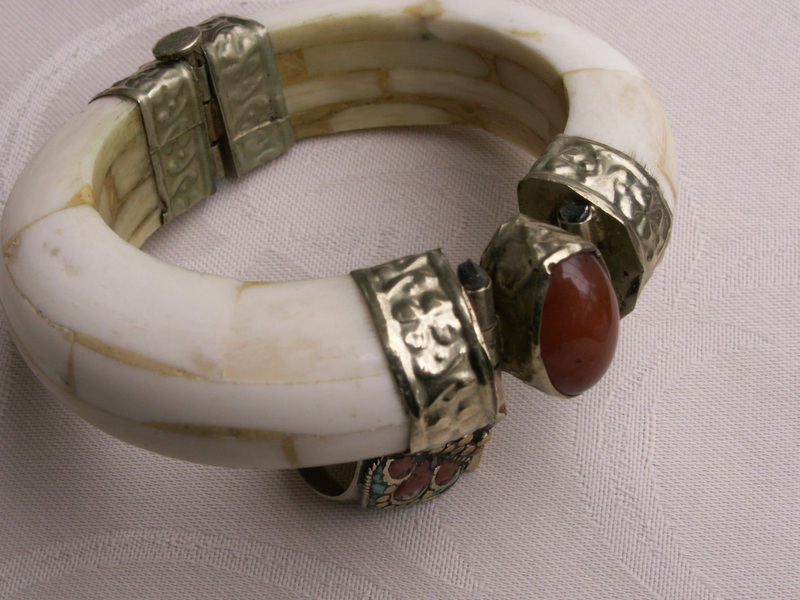 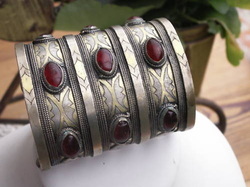 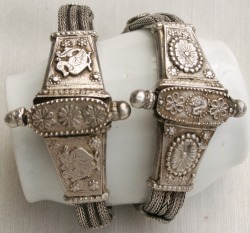 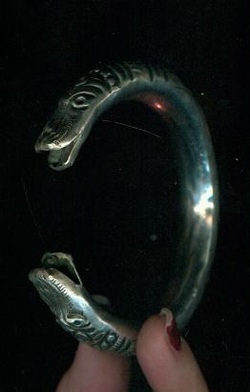 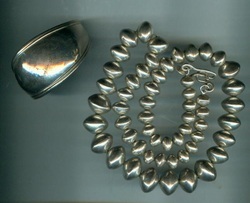 The three gilded beads are very rare Yemeni "Beri" beads, made of silver . 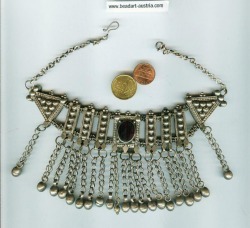 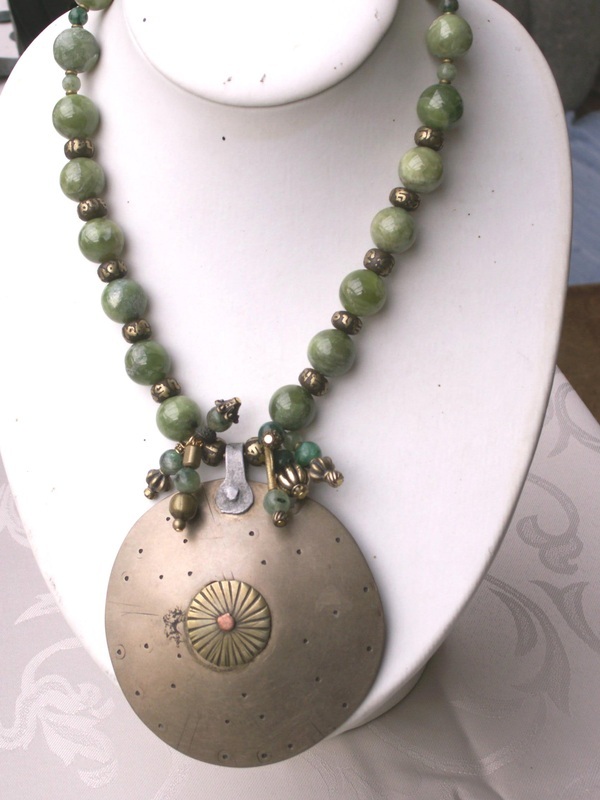 The back part of the necklace is a goldplated silver chain with an exceptional Bali vermeil clasp. 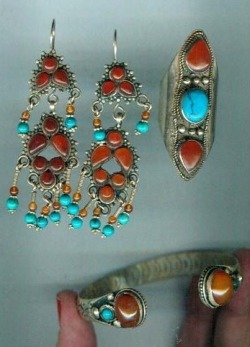 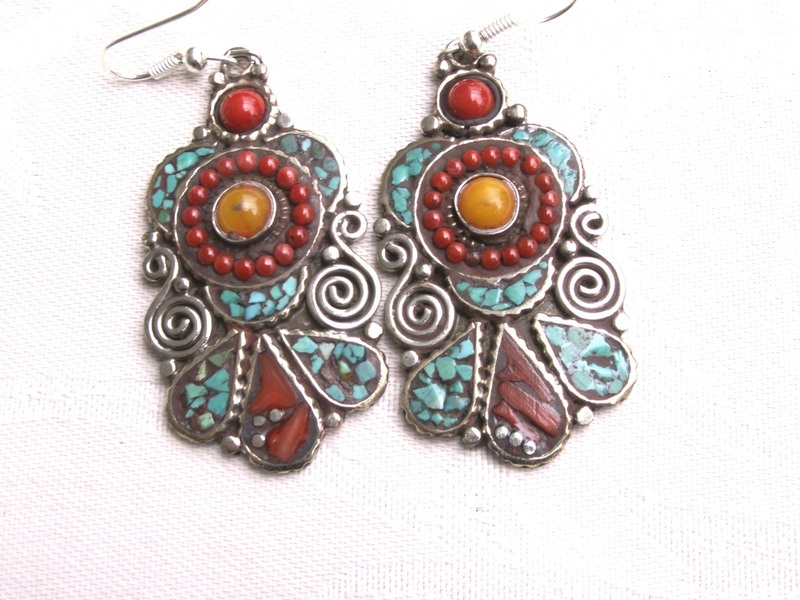 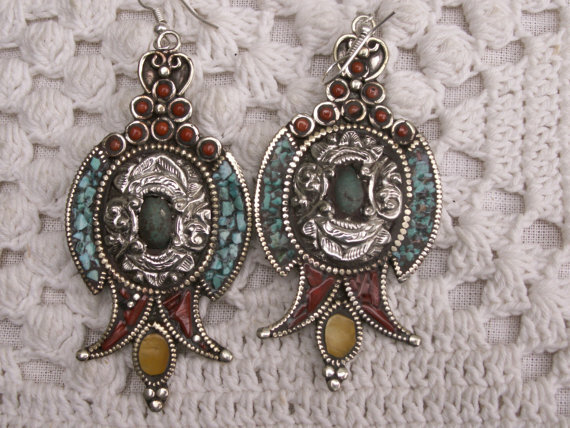 Earrings vermeil silver with amber and amazonite. 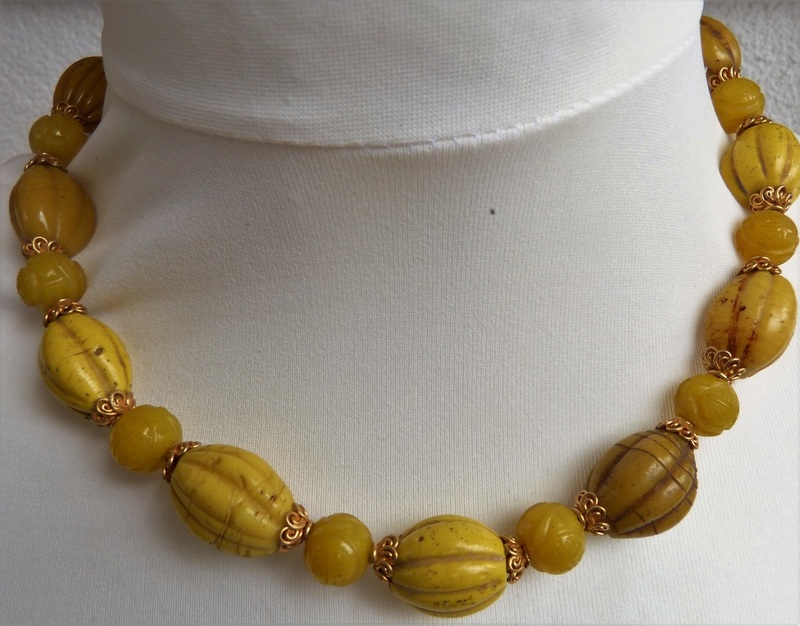 Exquisite old/antique melon shaped citrine beads, varying from 9 mm to 20 mm diameter are strung with large 22 ct gold beads from India and tiny gold spacers. 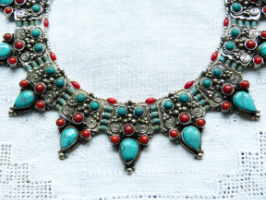 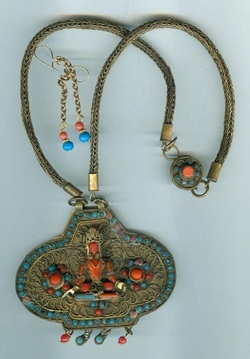 The neckpart iwas originallyvery much Indian style with a gold threaded tassle ich allows to vary the length of the necklace. 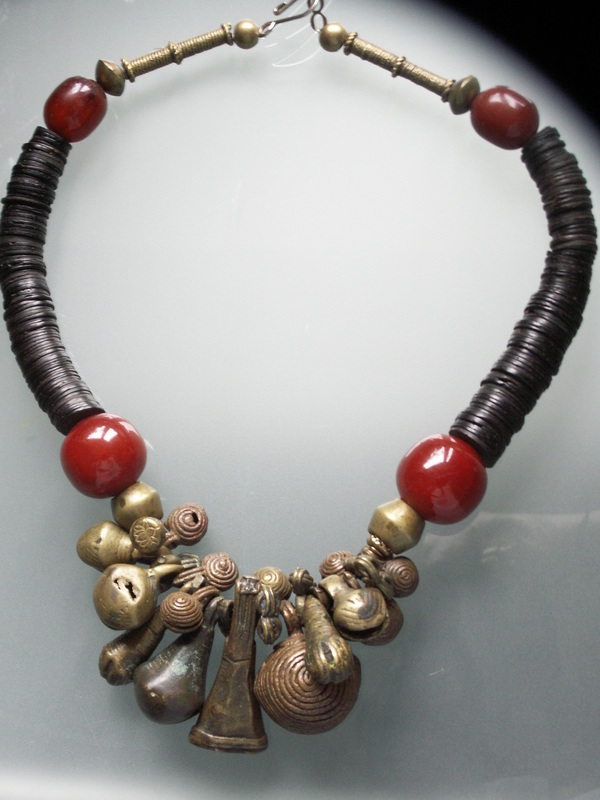 This is a designer necklace by Spanish Artist Nishedha!. 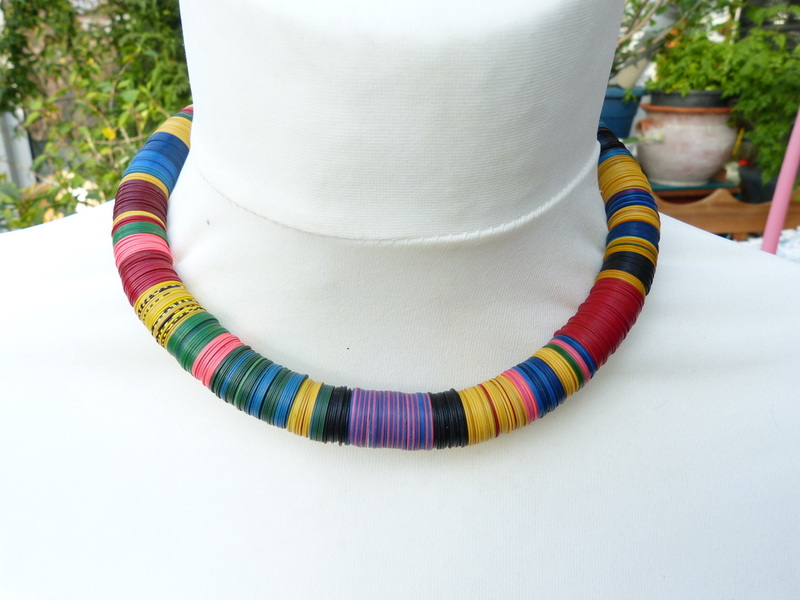 However, as I did not like the tassle int he back I have changed the outlook. 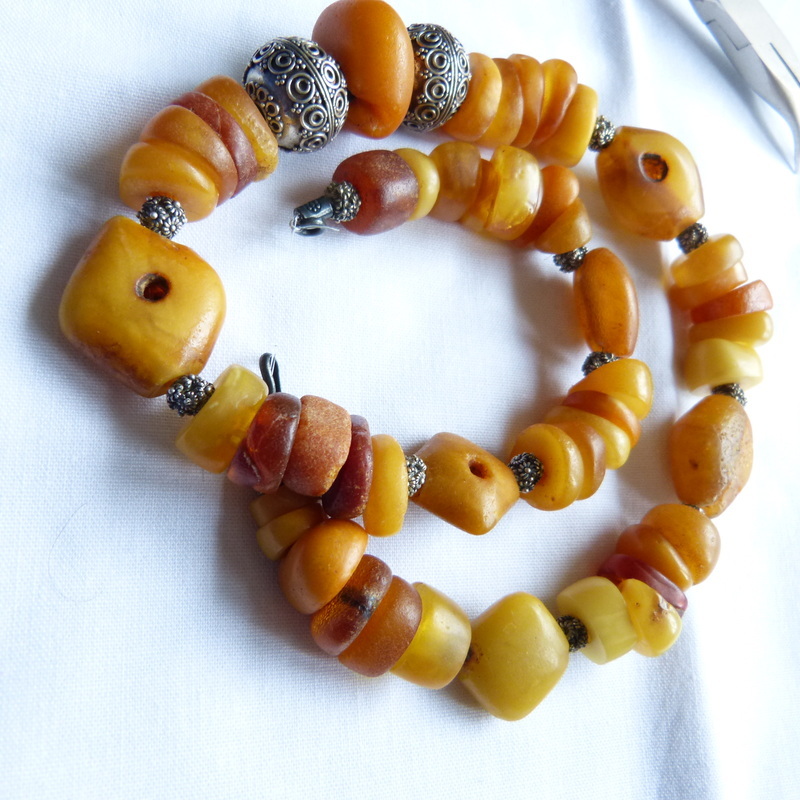 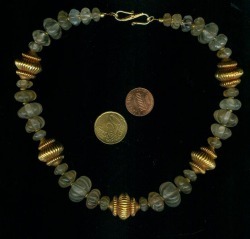 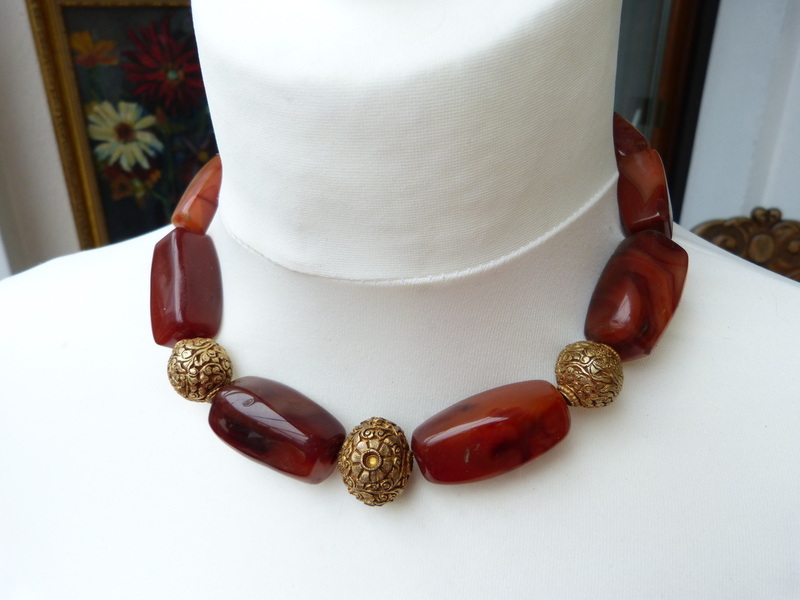 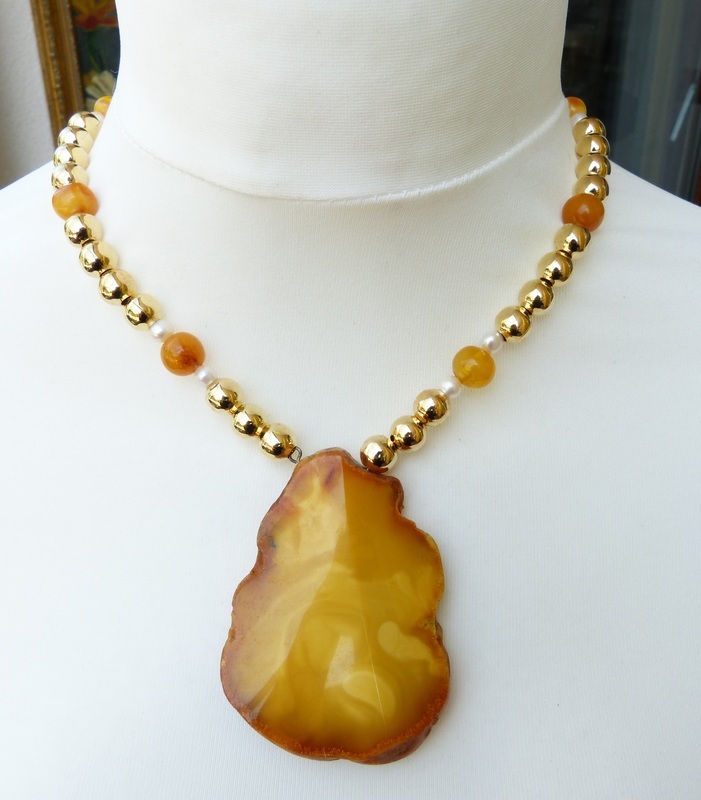 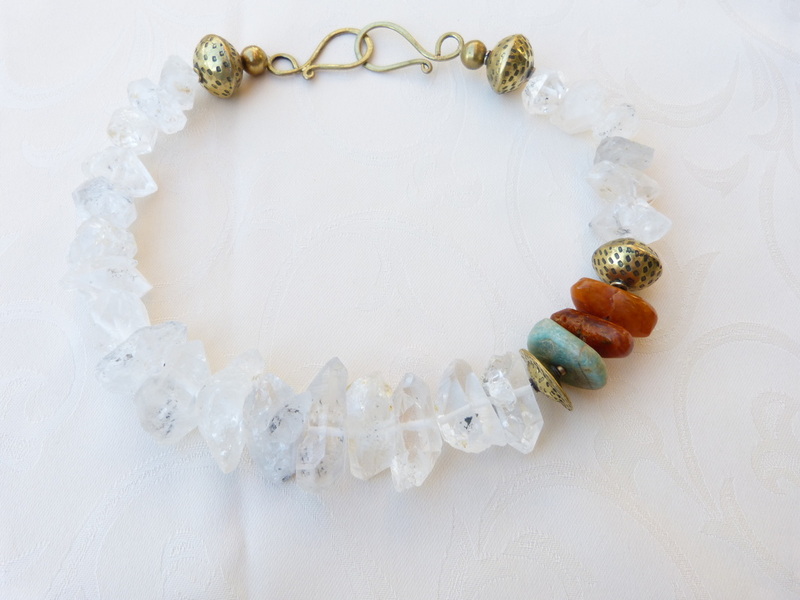 I have added four ancient citrine melon beads and a gold clasp. 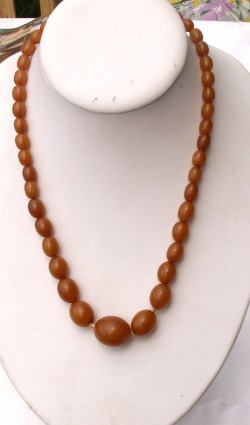 I prefer it this way! 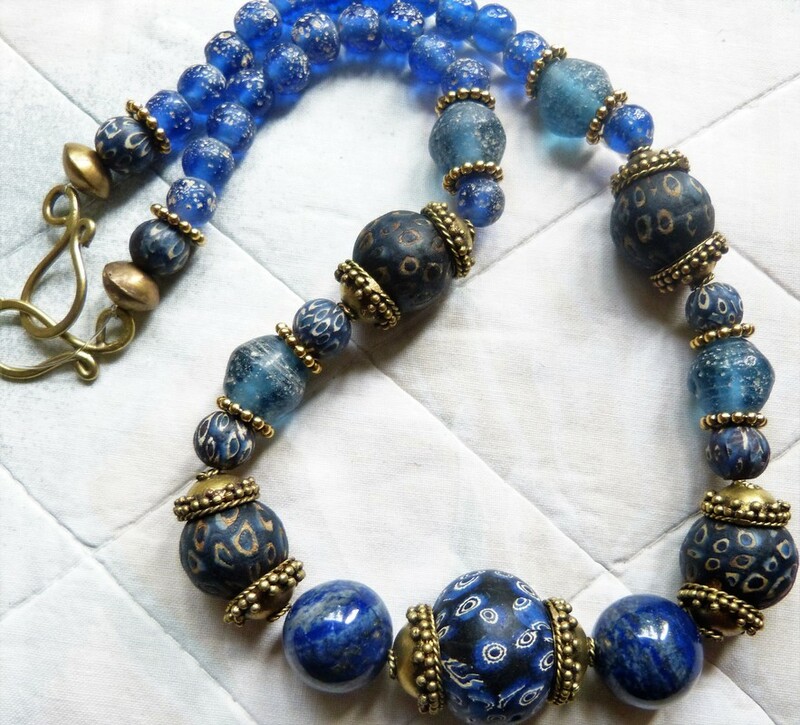 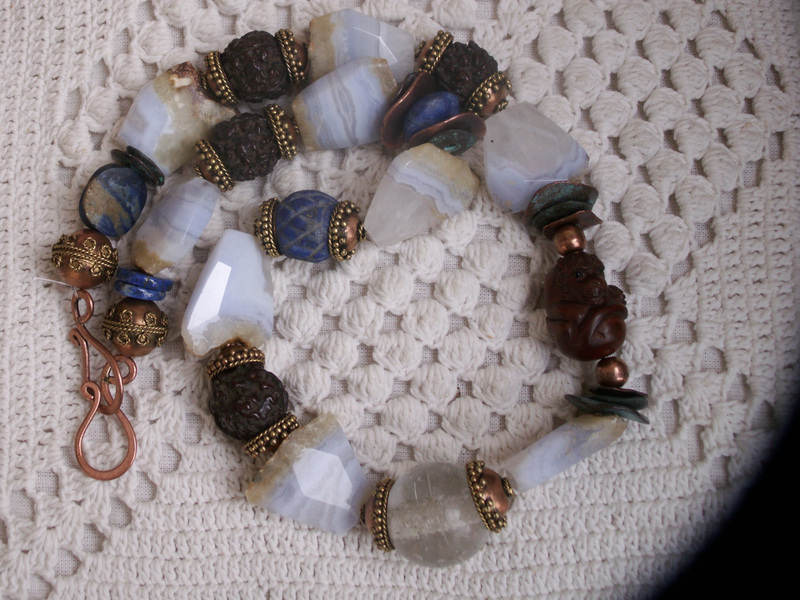 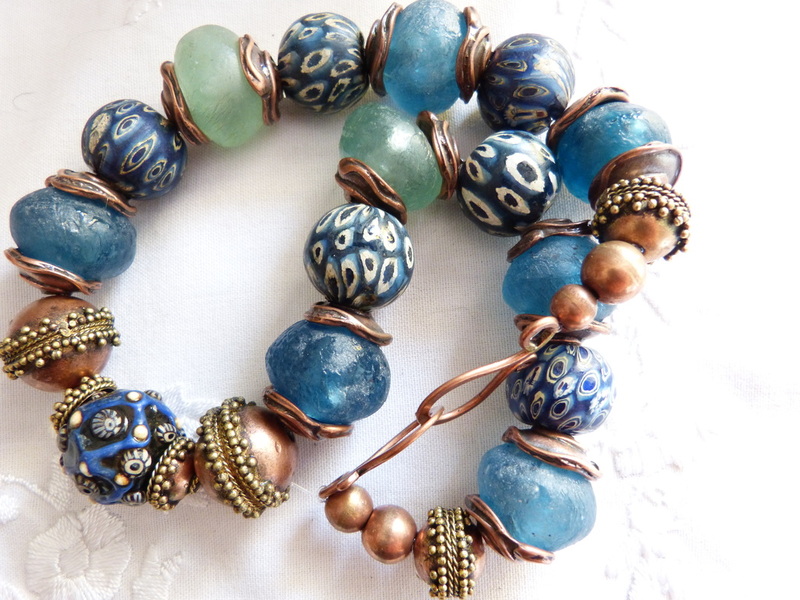 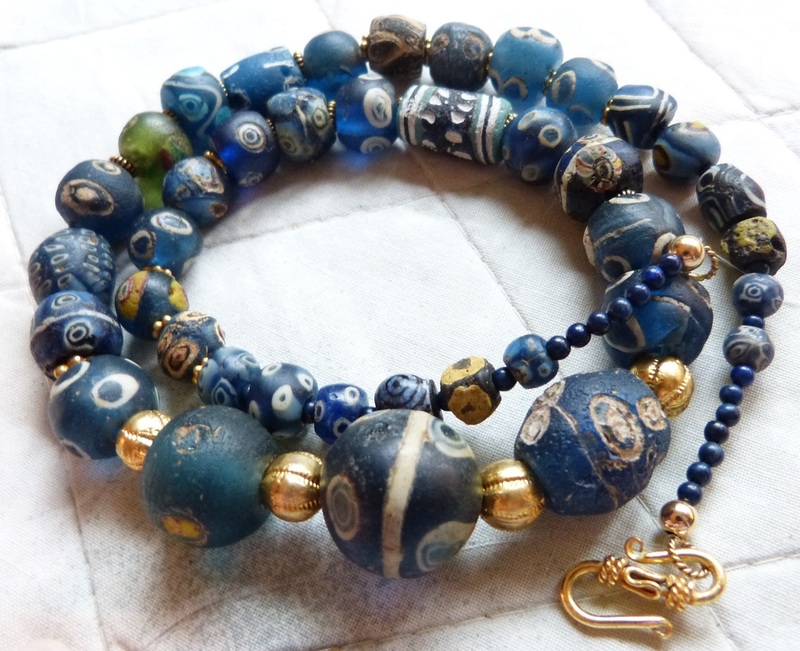 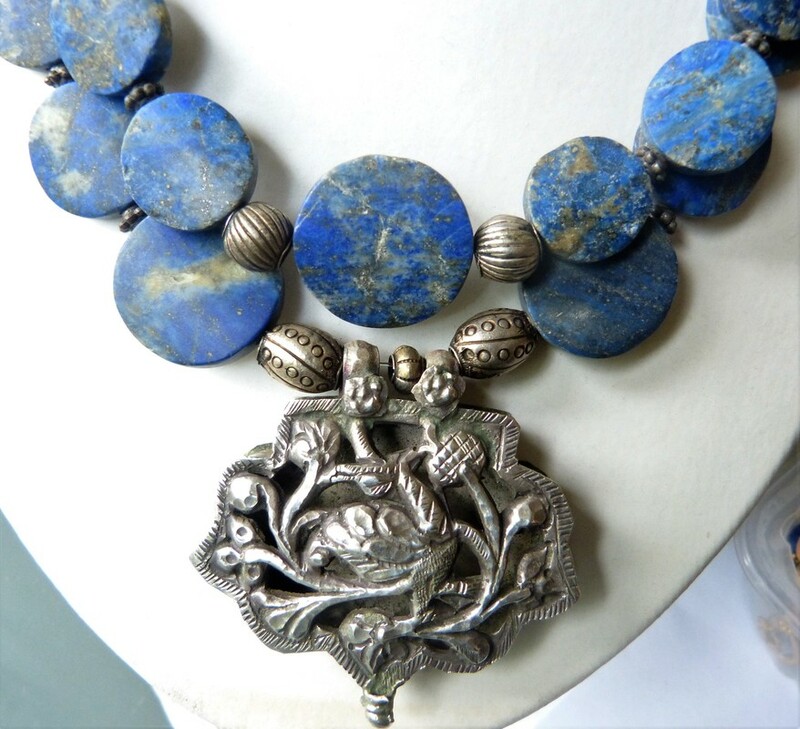 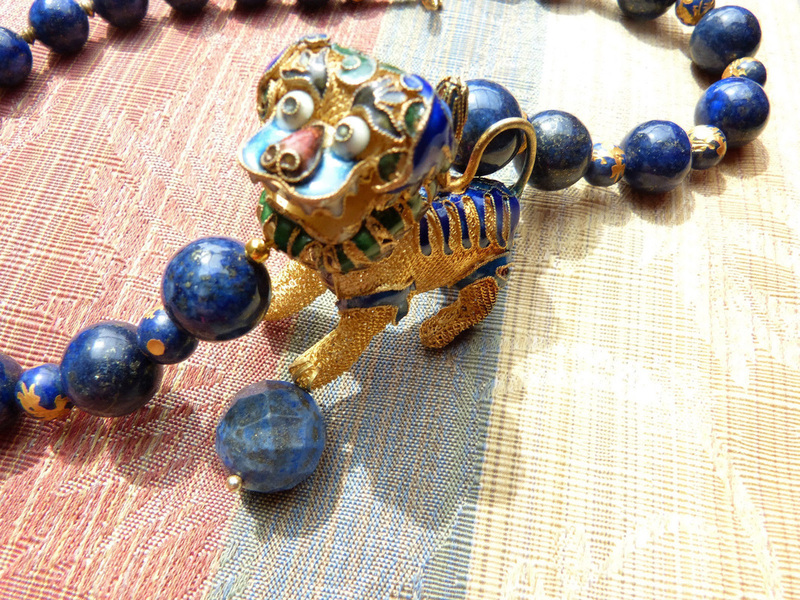 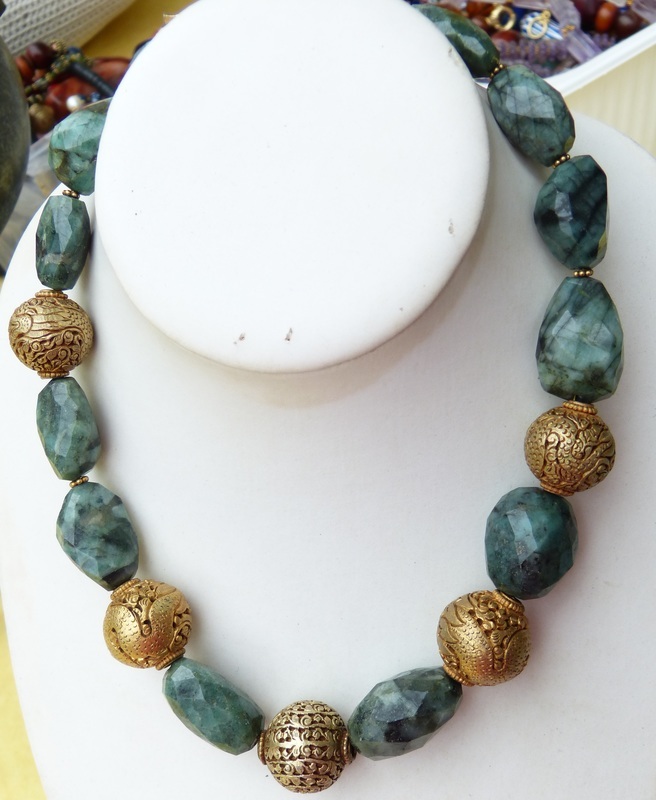 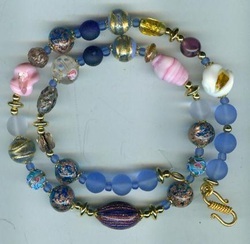 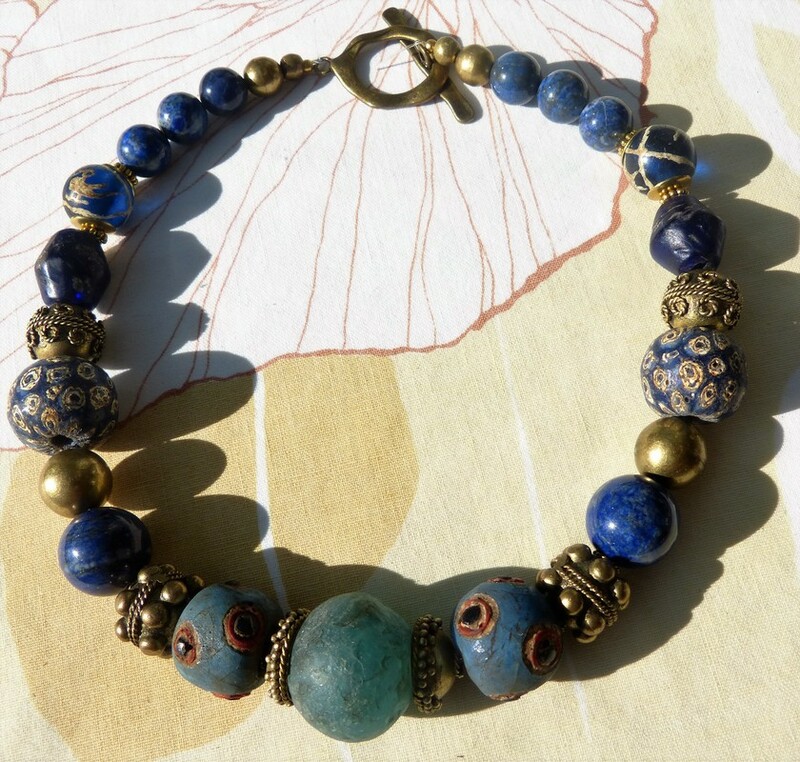 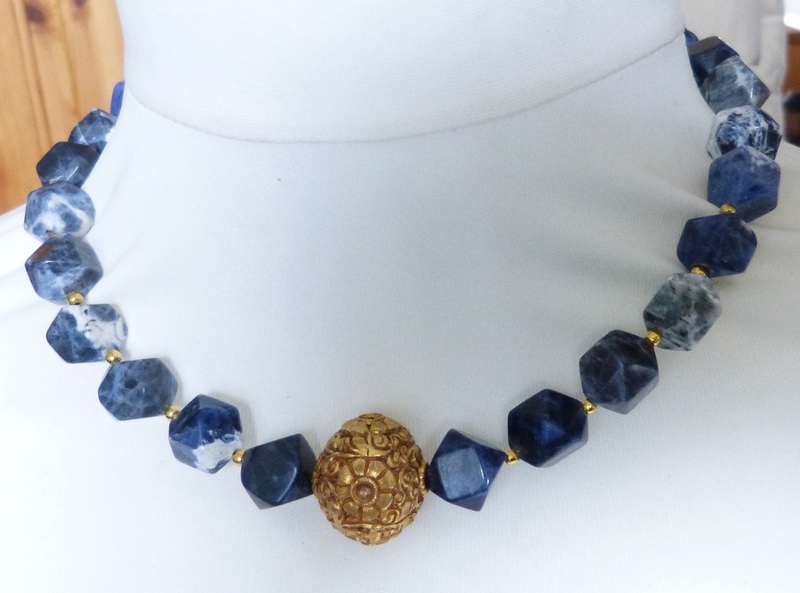 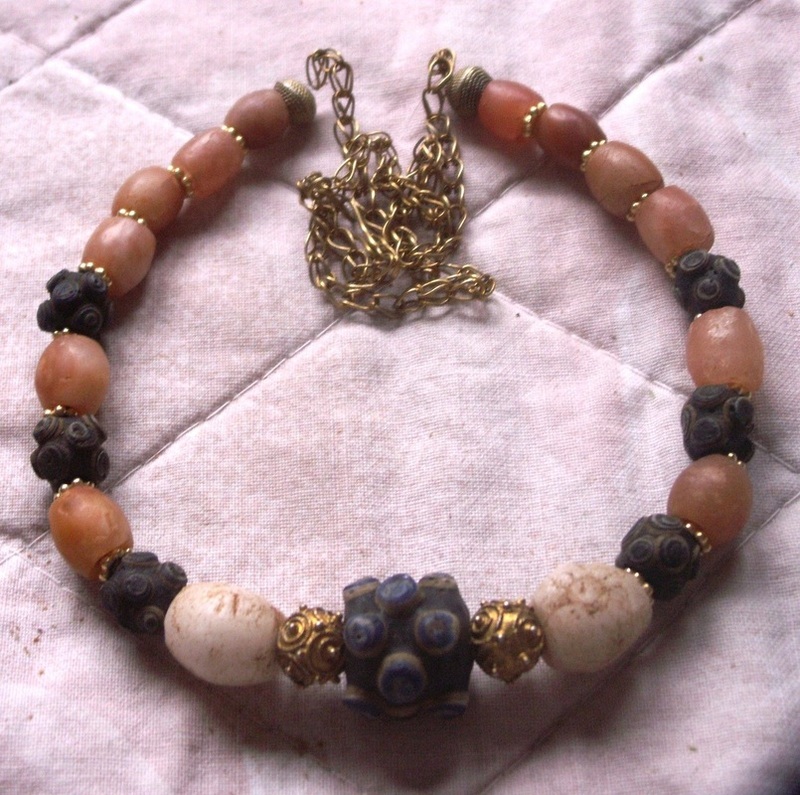 superb old blue chalcedony beads strung with Bali vermeil and gilded copper beads with carved dragons. 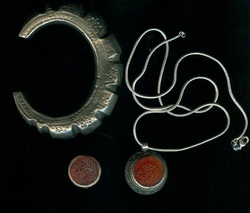 All items show below and above are sold. 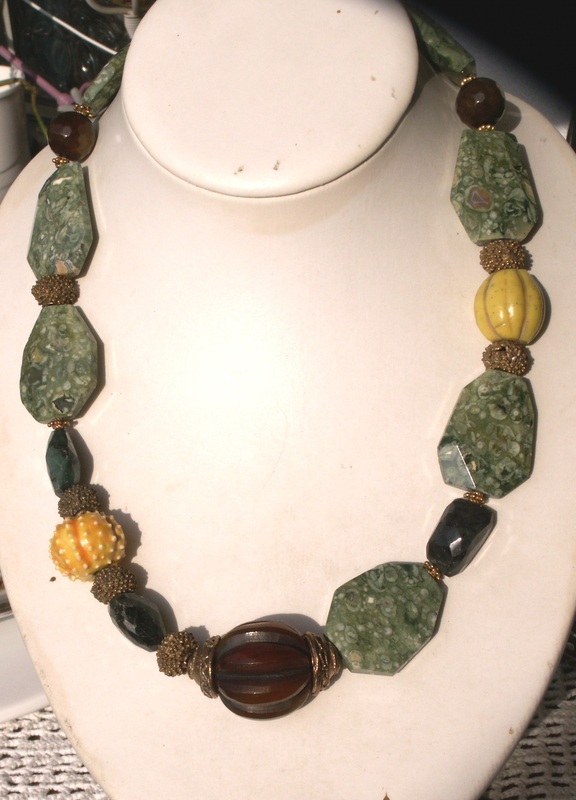 If it is necklaces created by me I might be able to make a custom order. 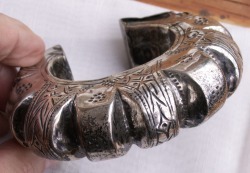 Please ask! 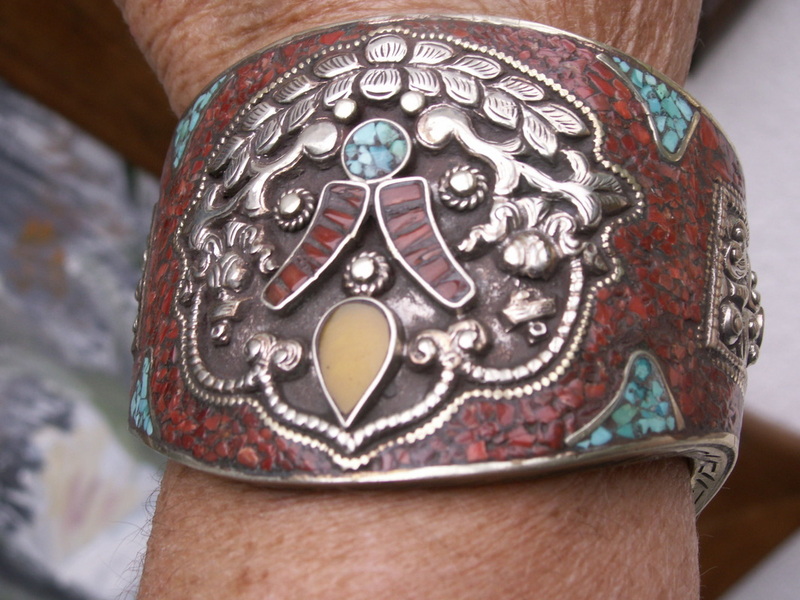 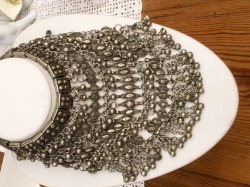 This does not apply to vintage or antique jewelry! 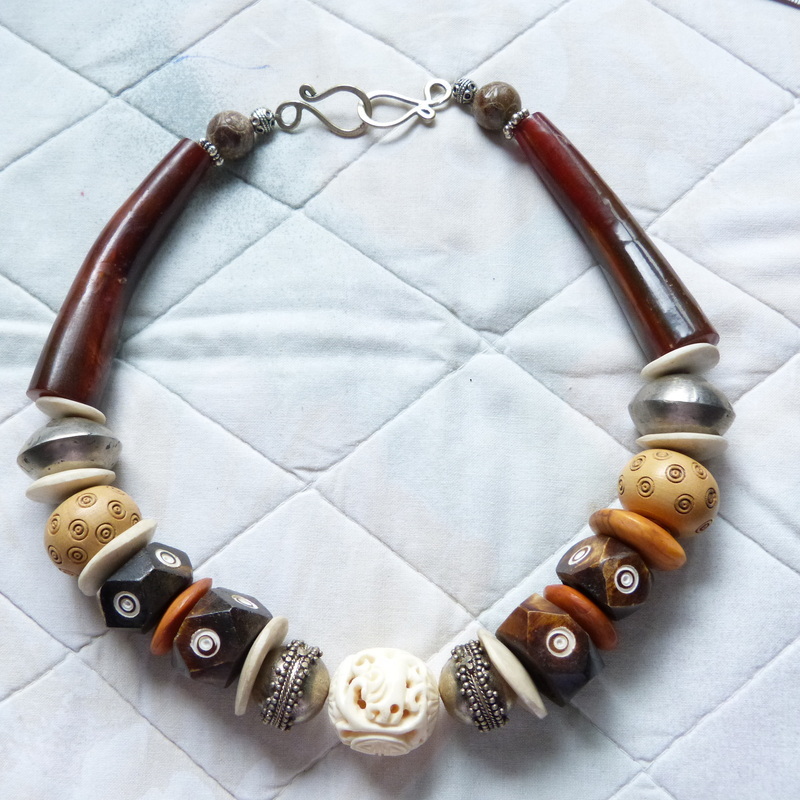 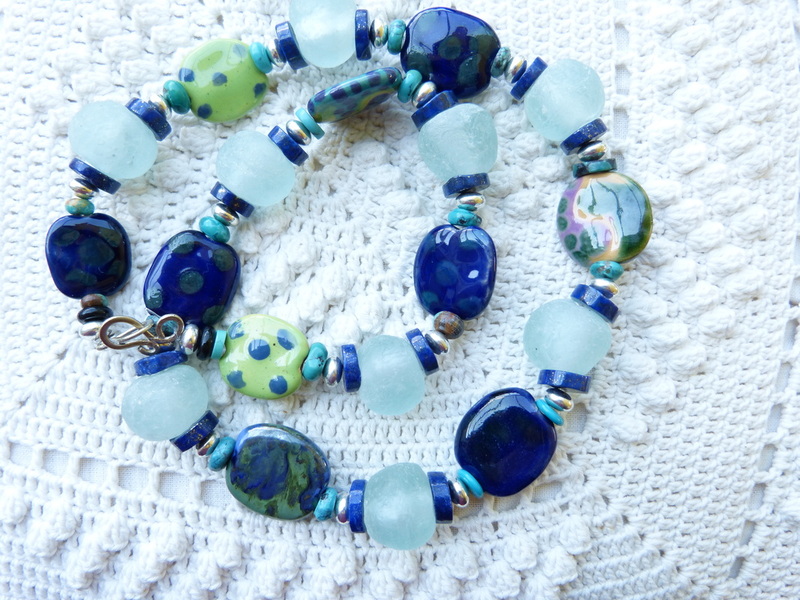 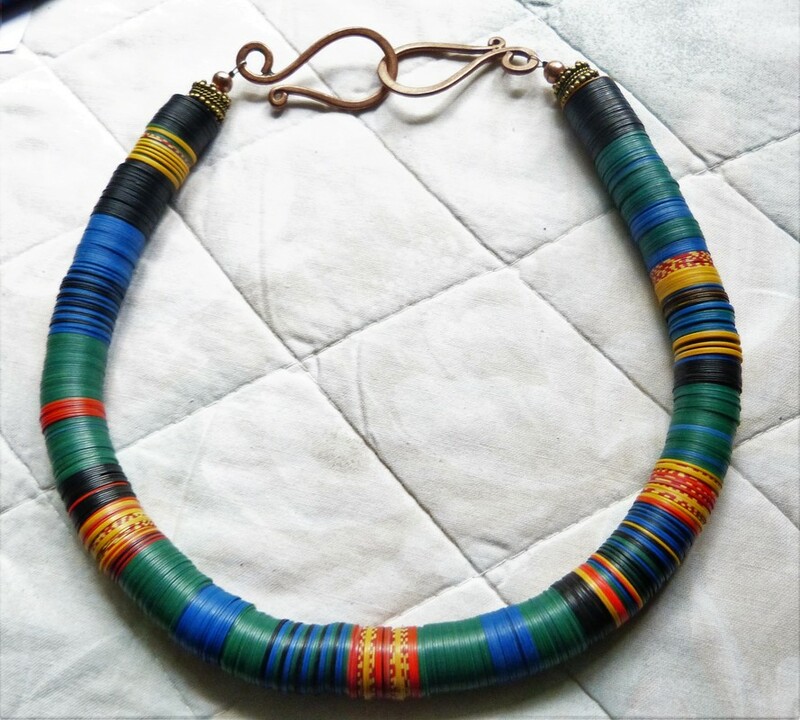 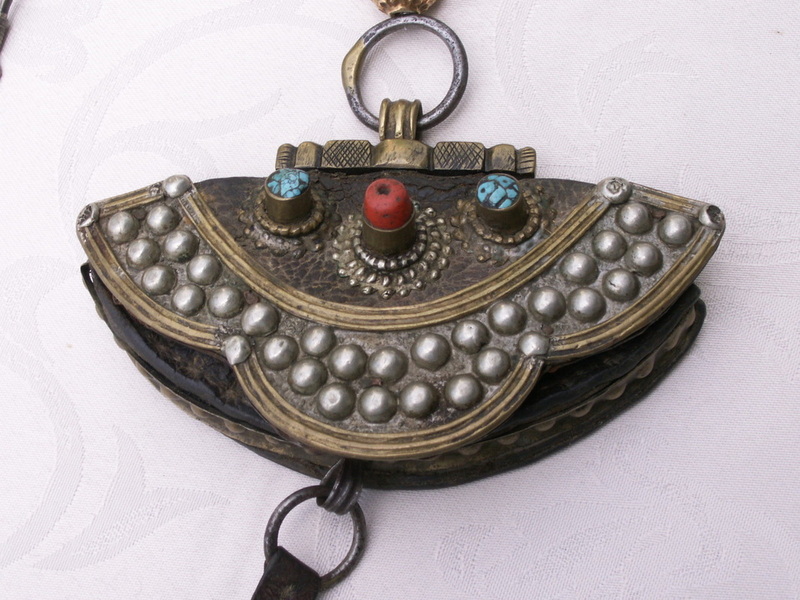 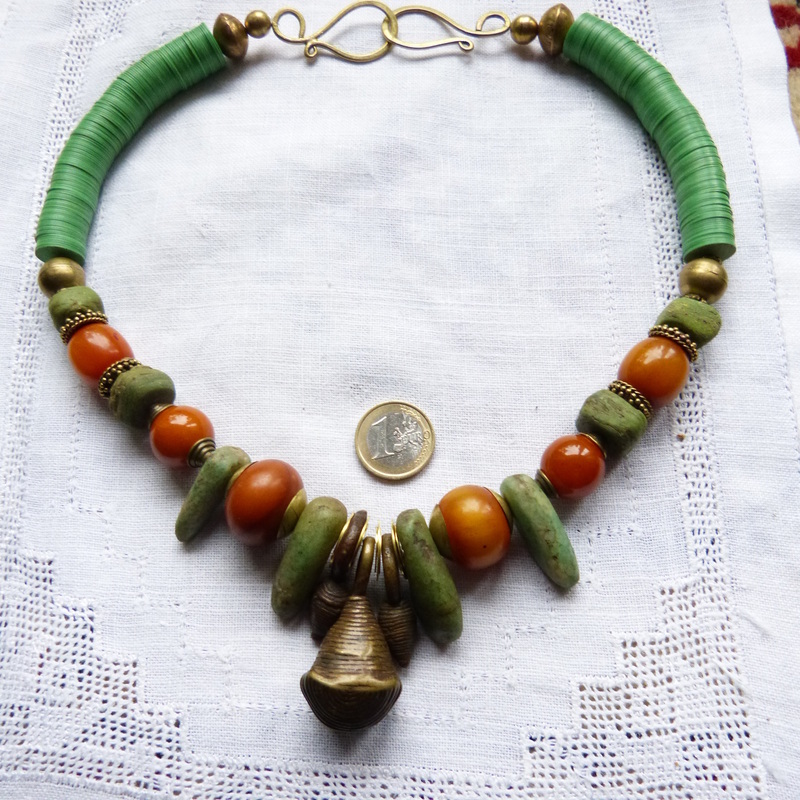 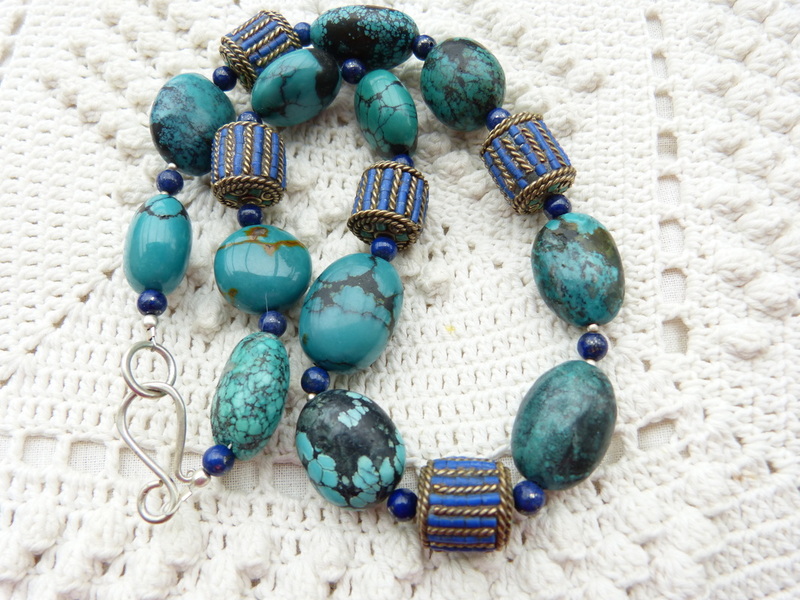 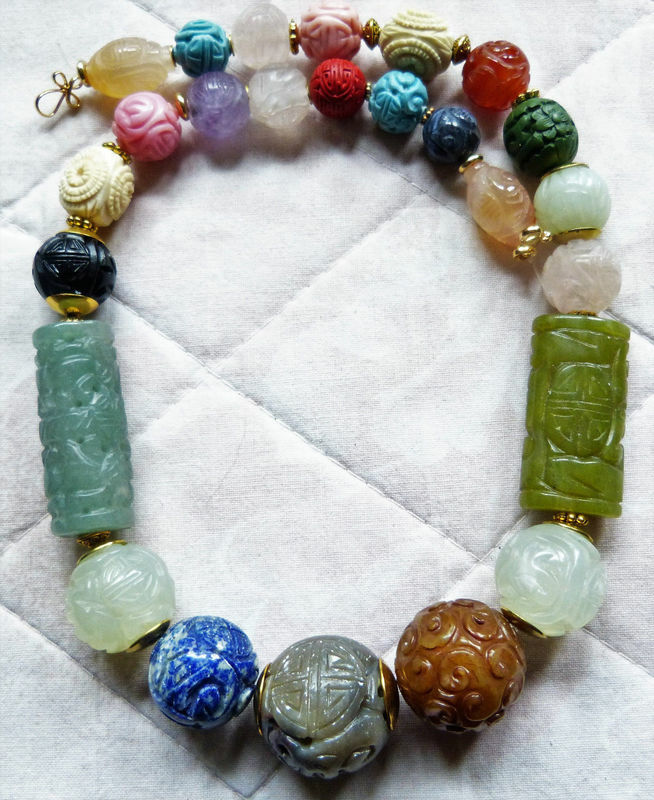 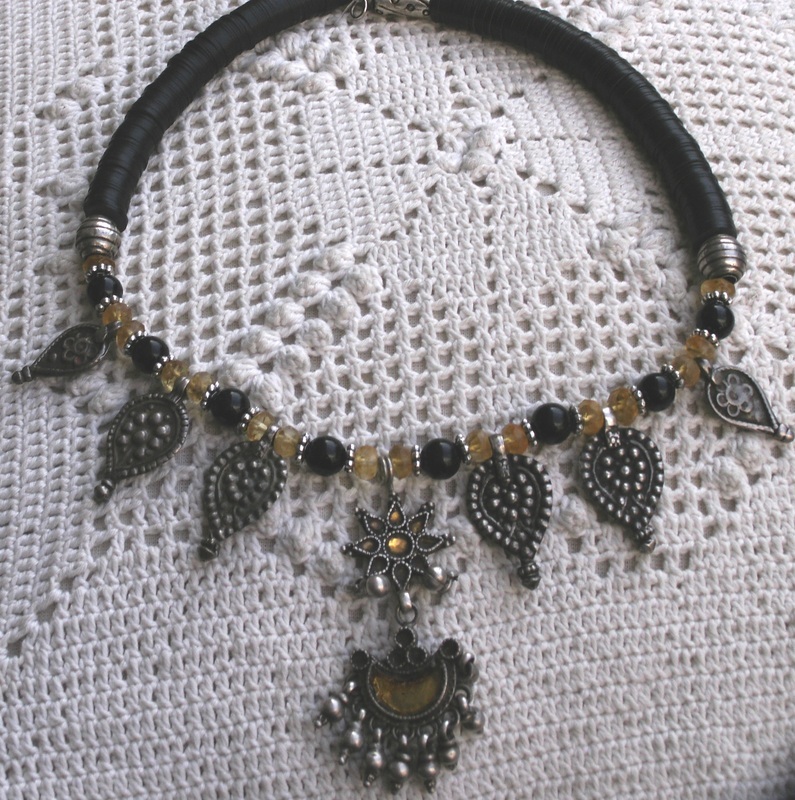 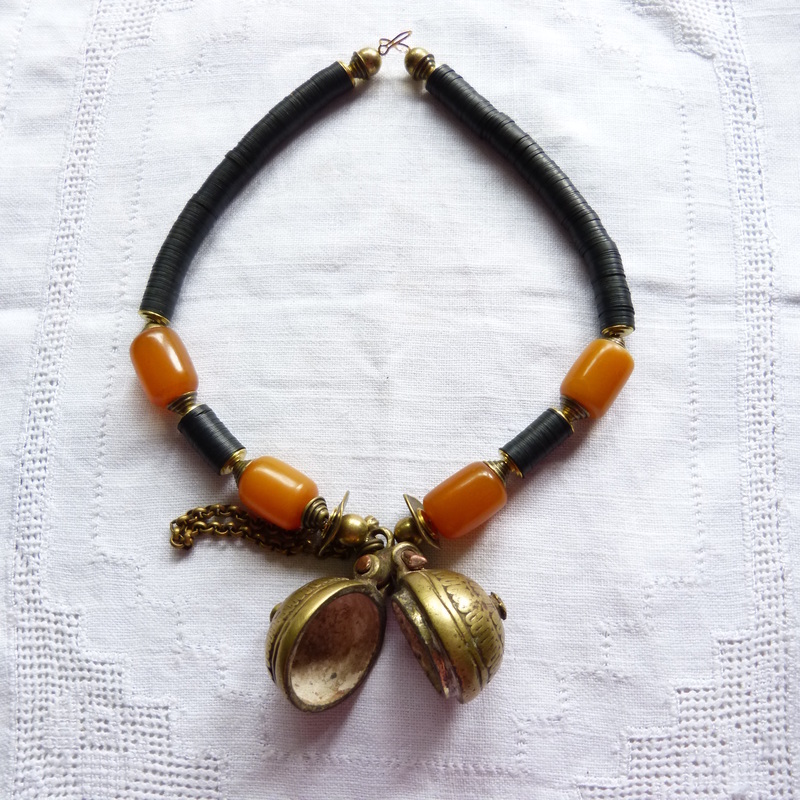 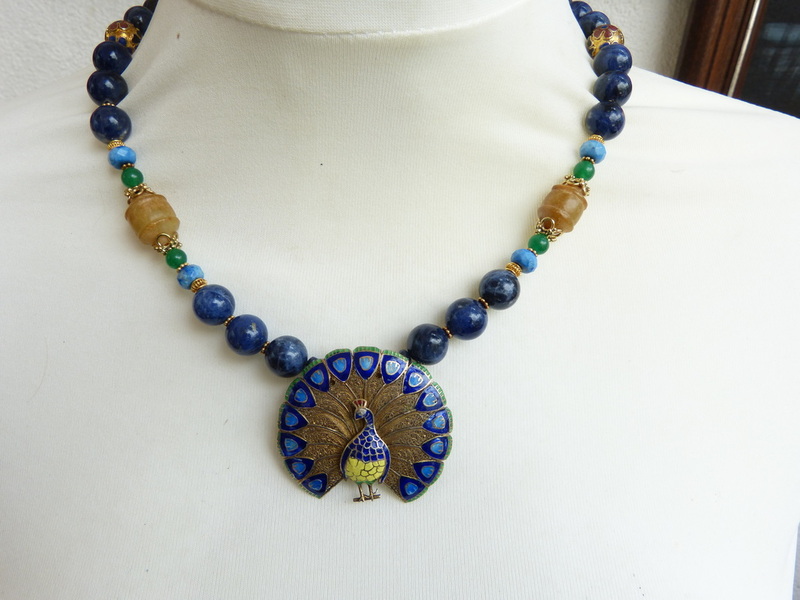 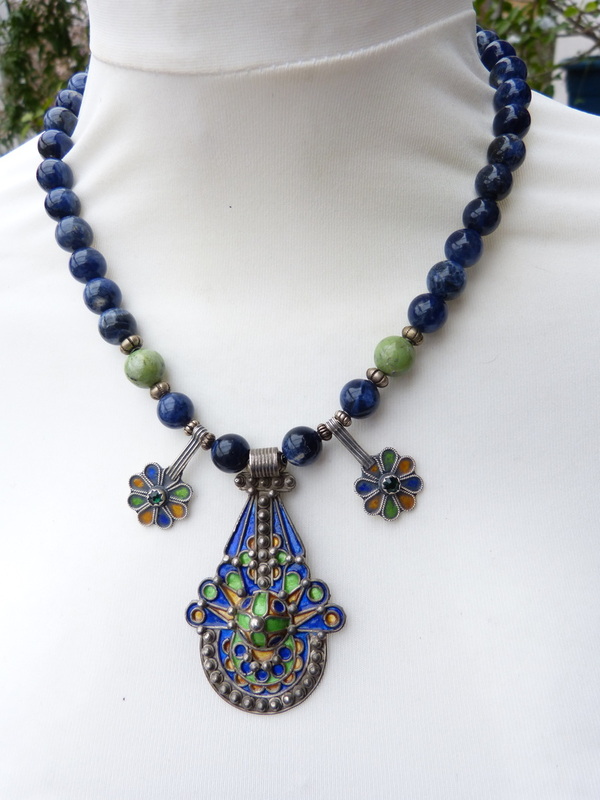 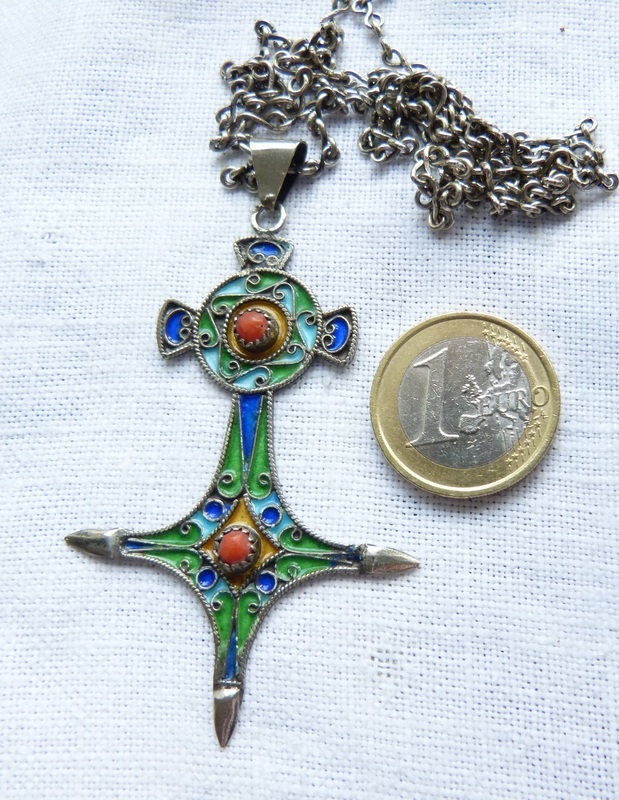 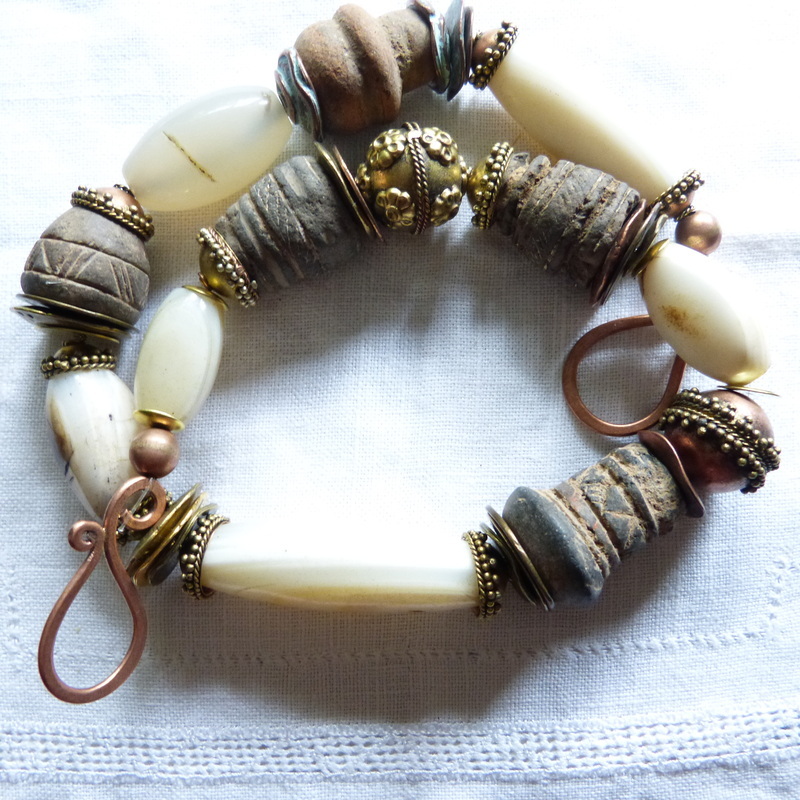 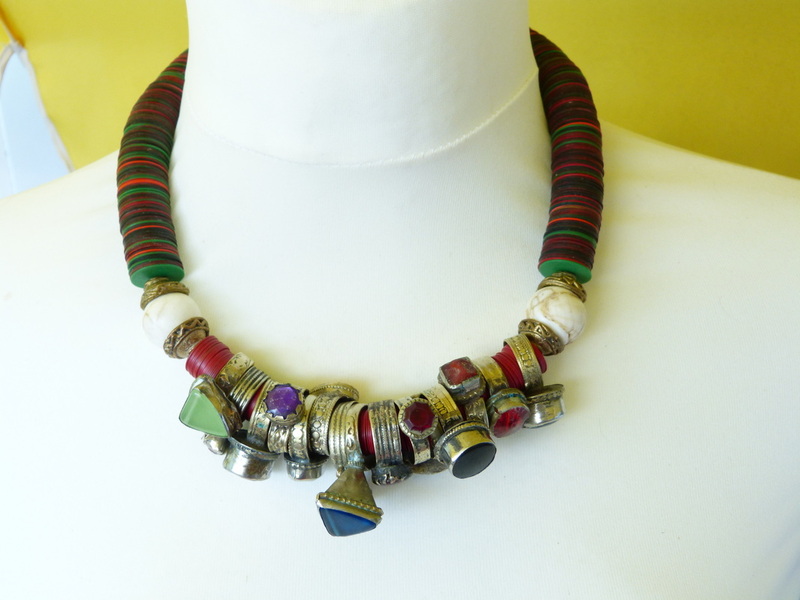 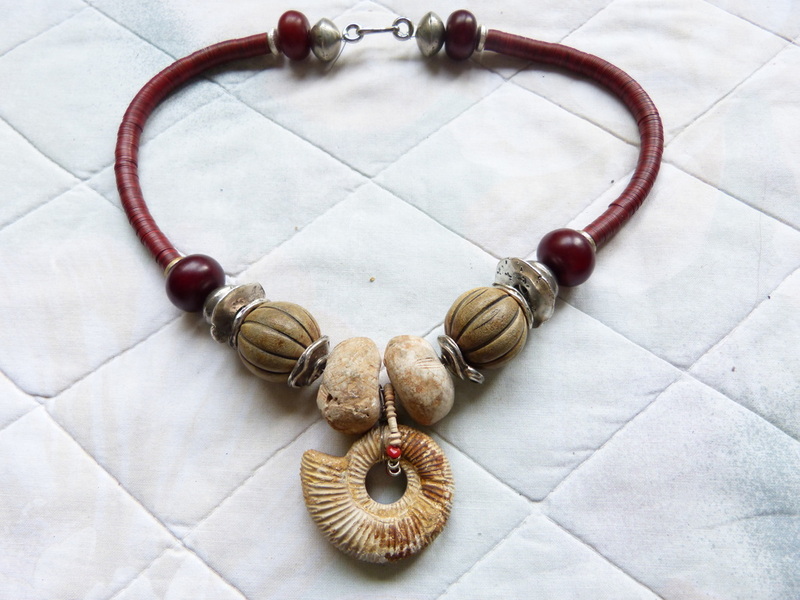 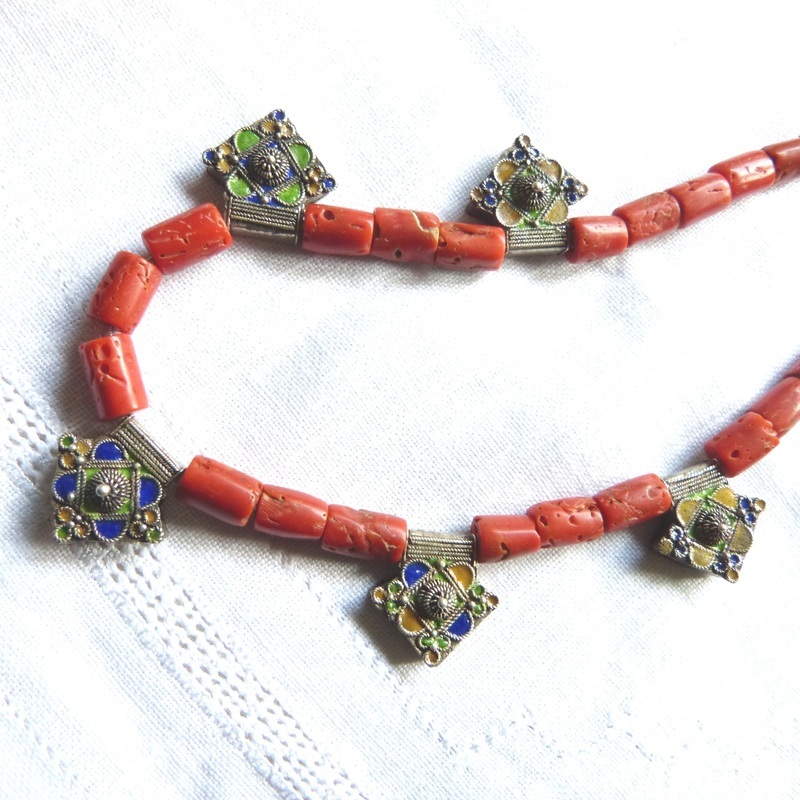 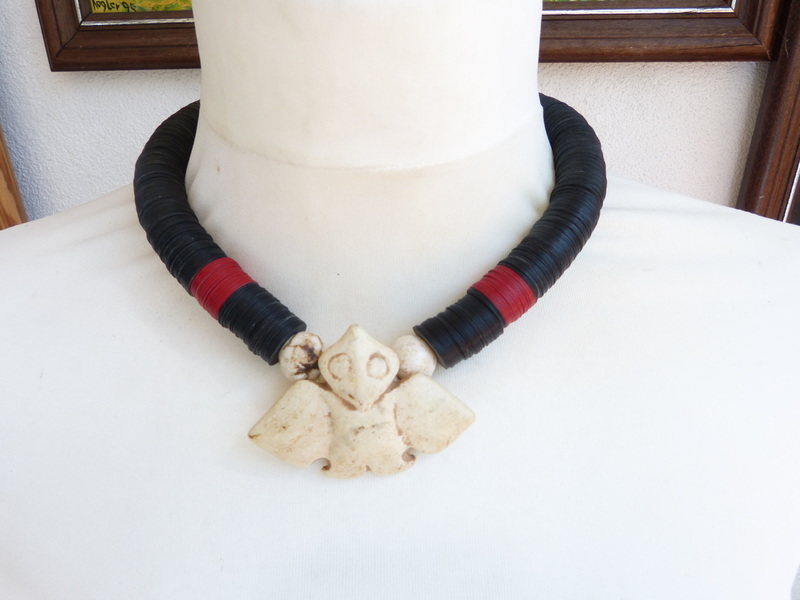 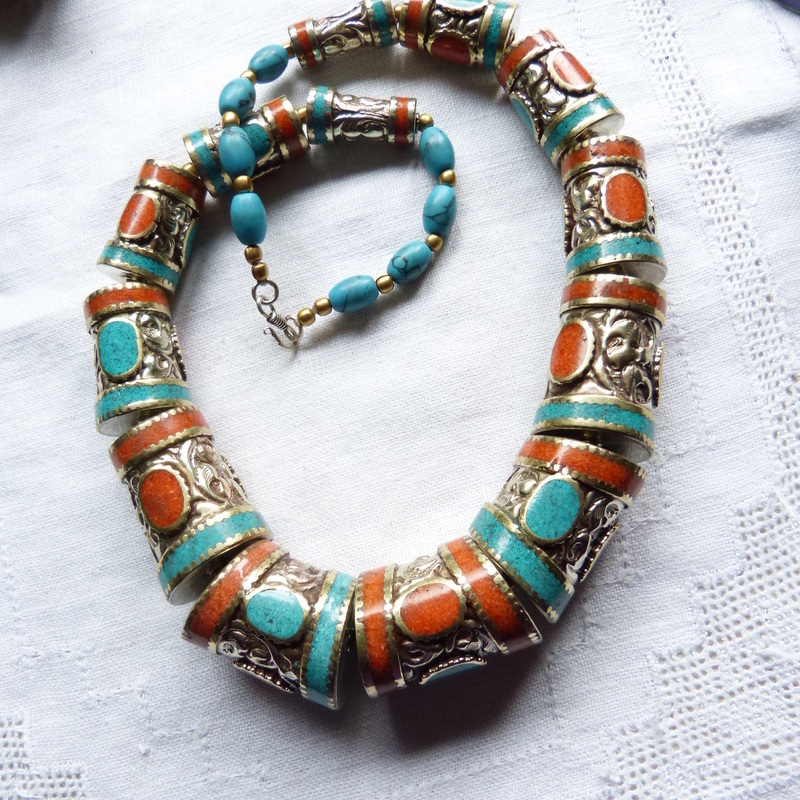 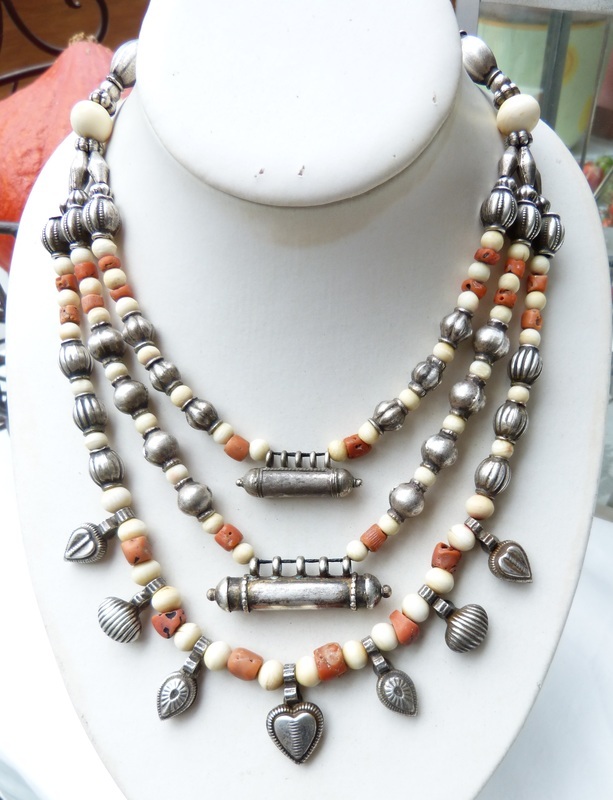 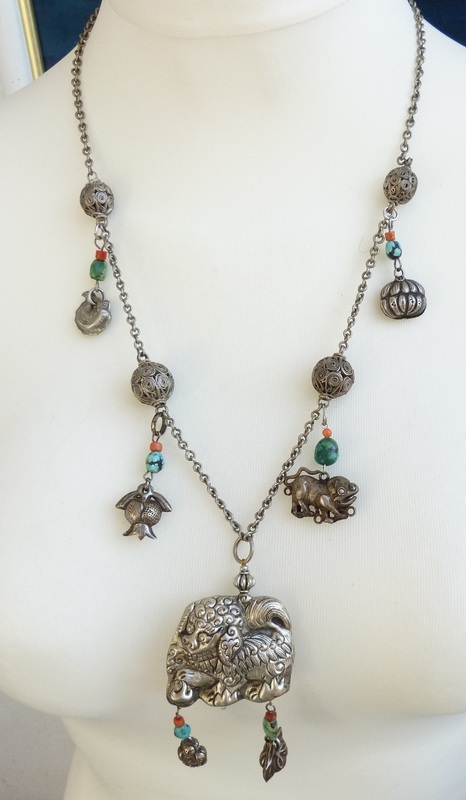 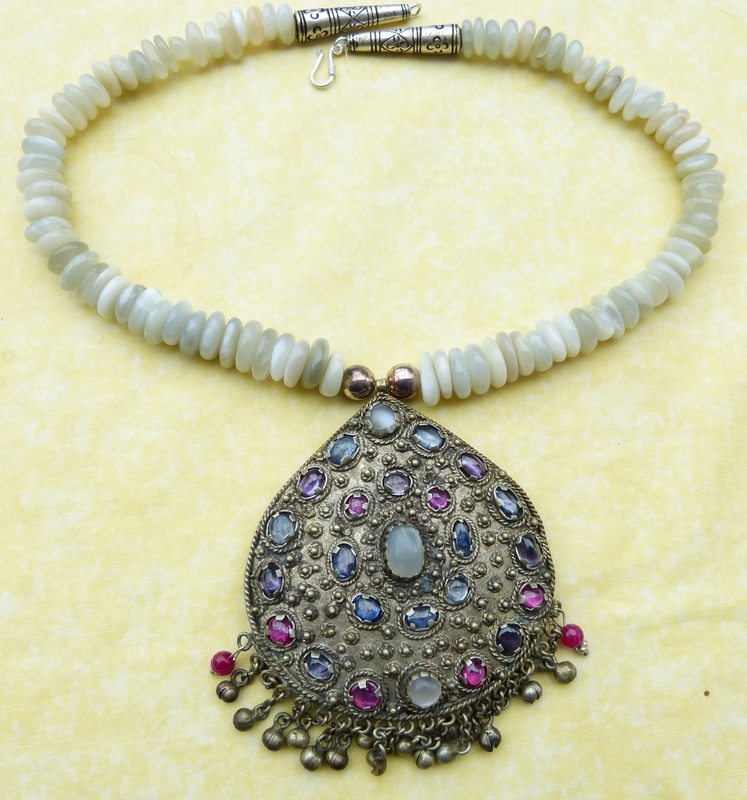 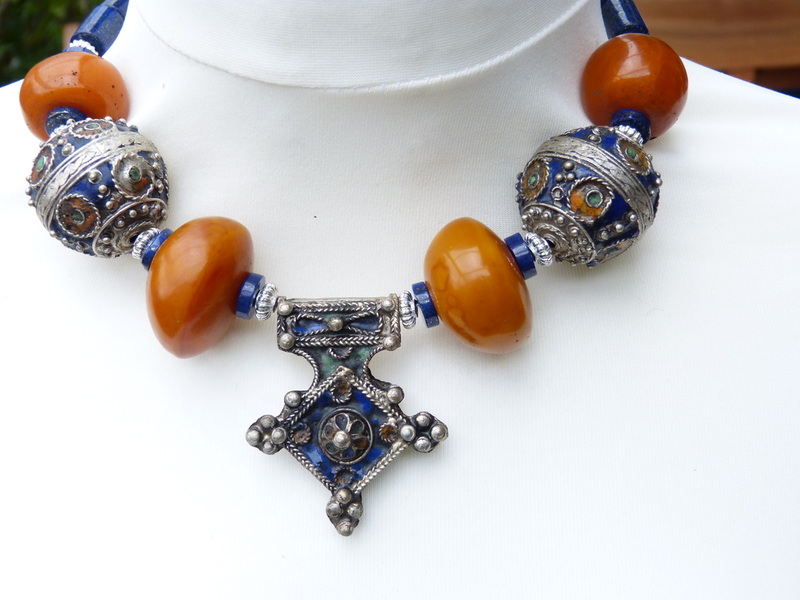 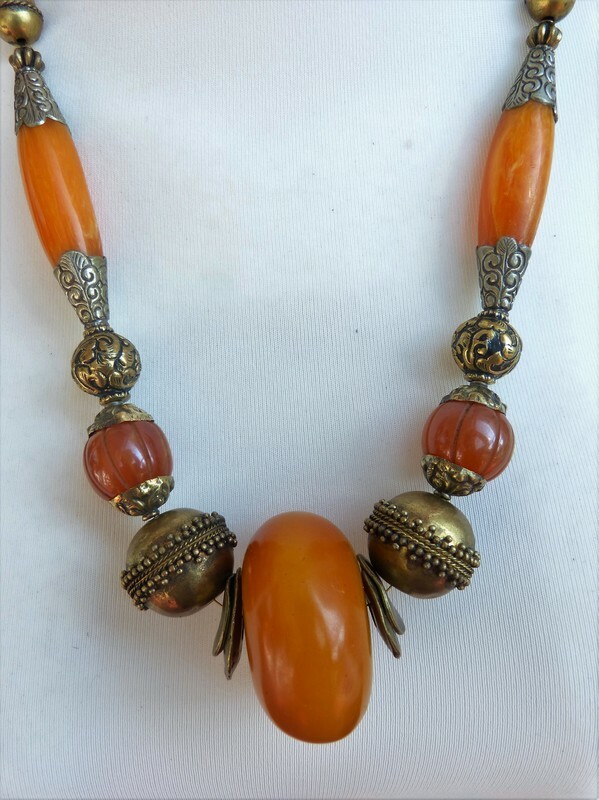 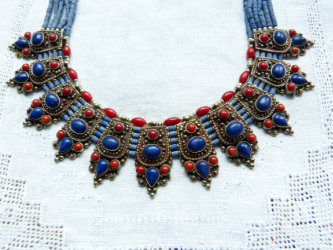 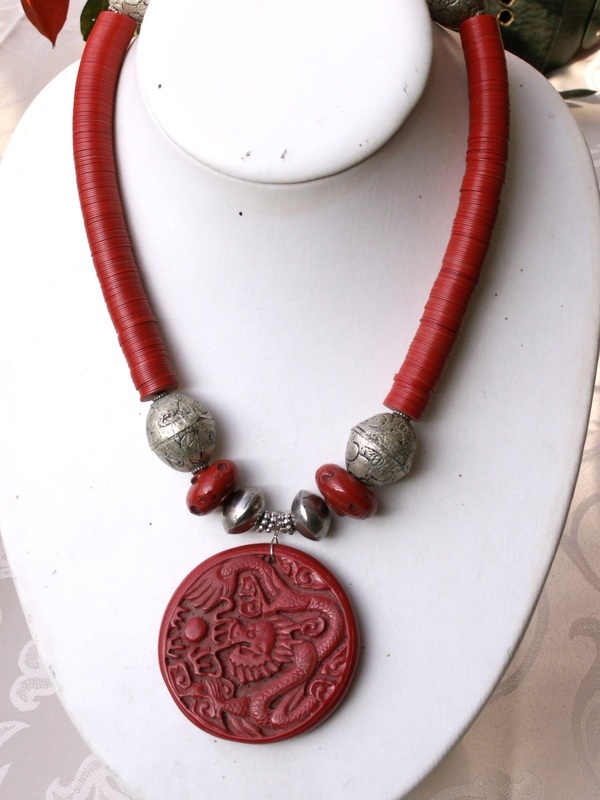 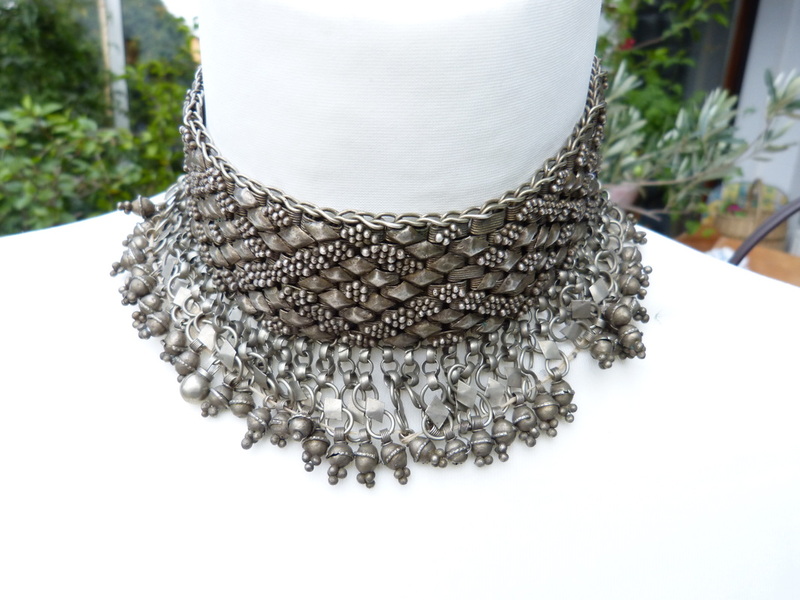 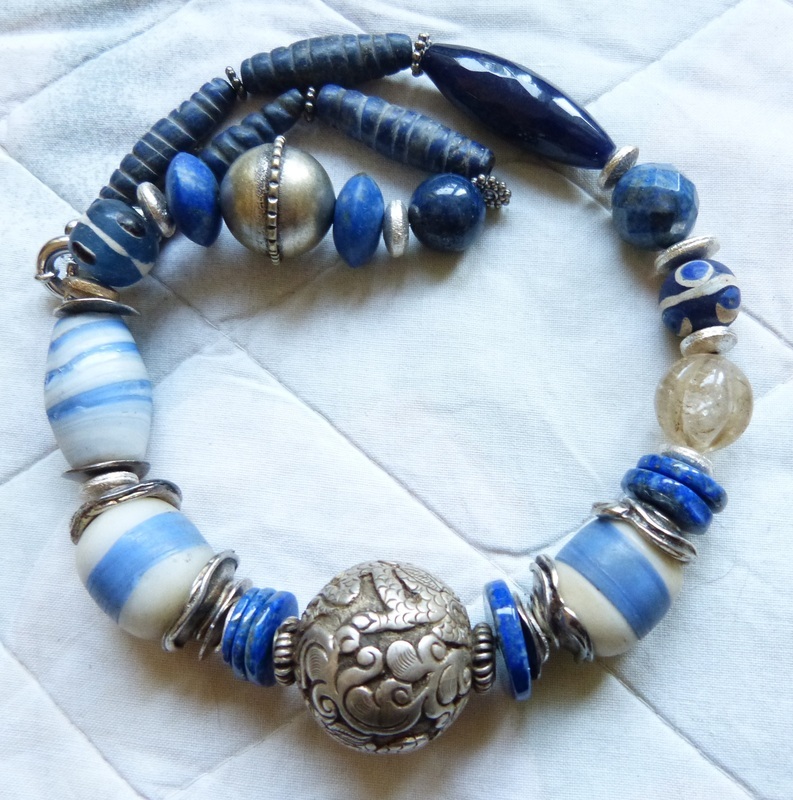 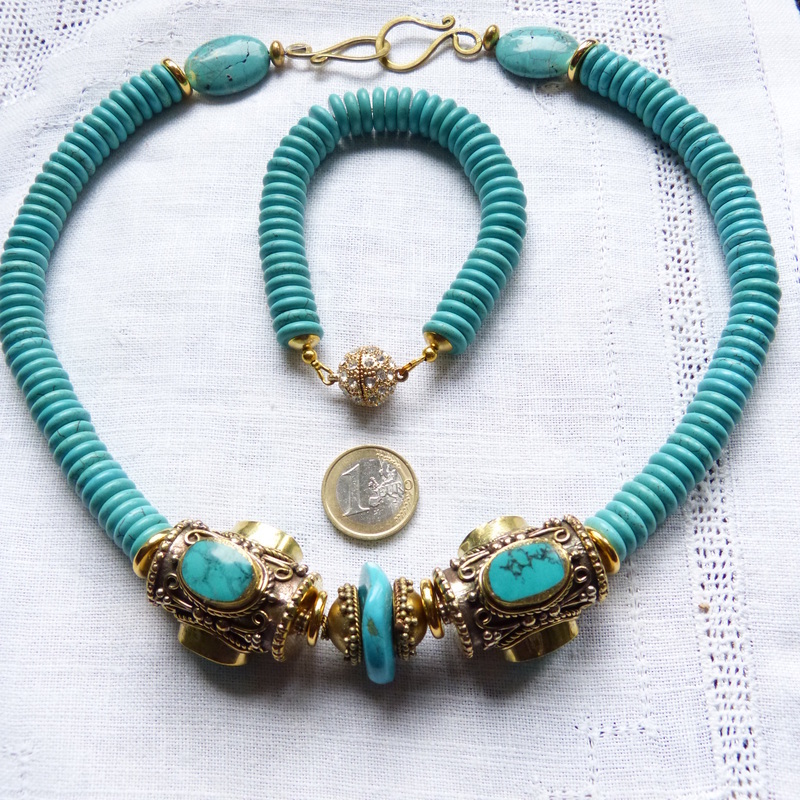 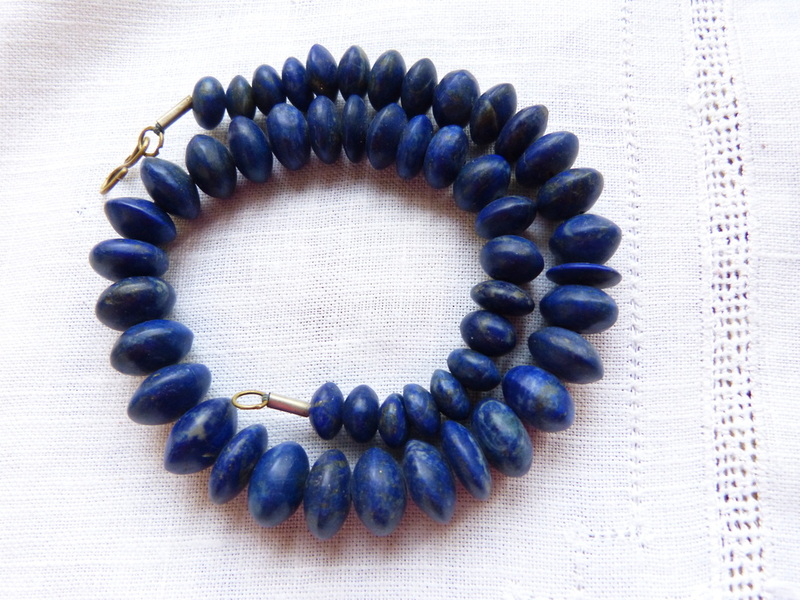 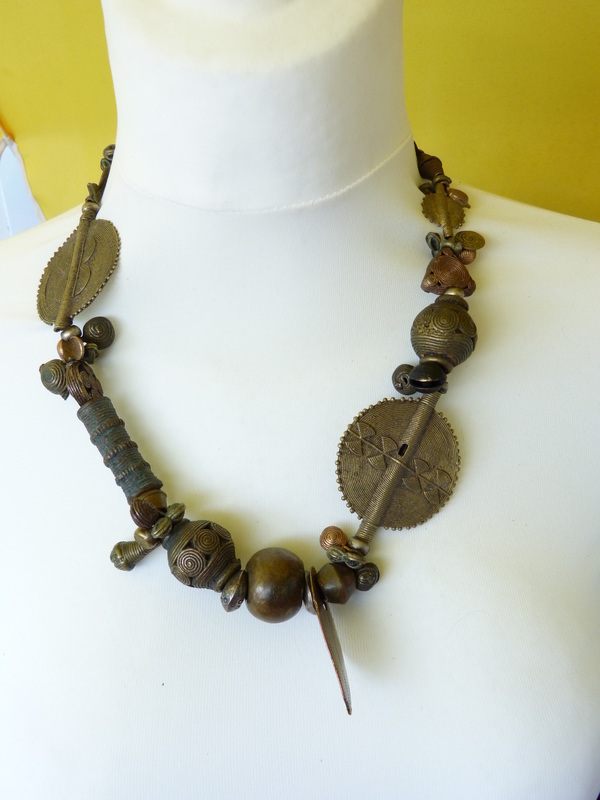 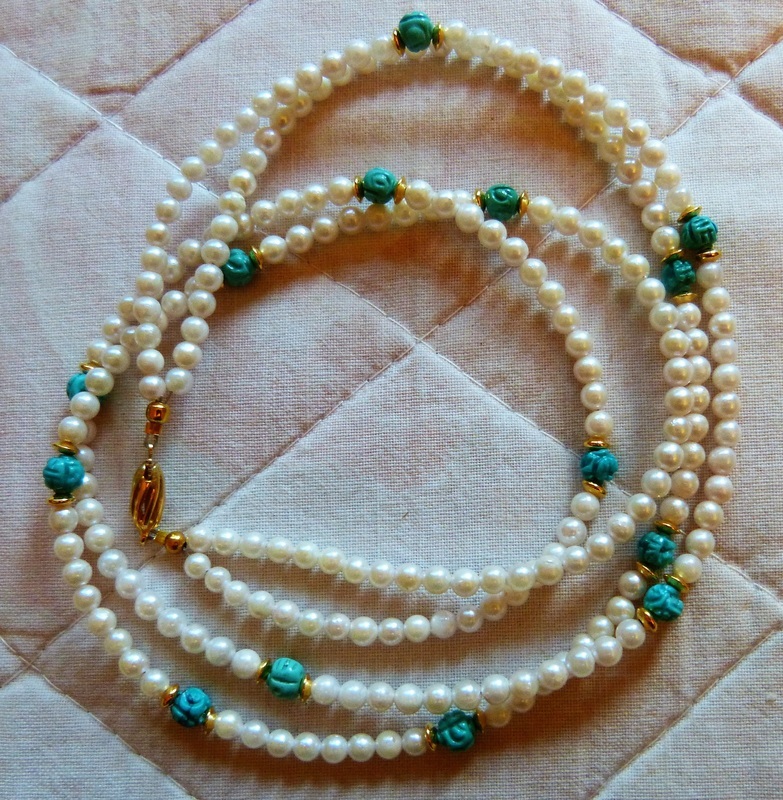 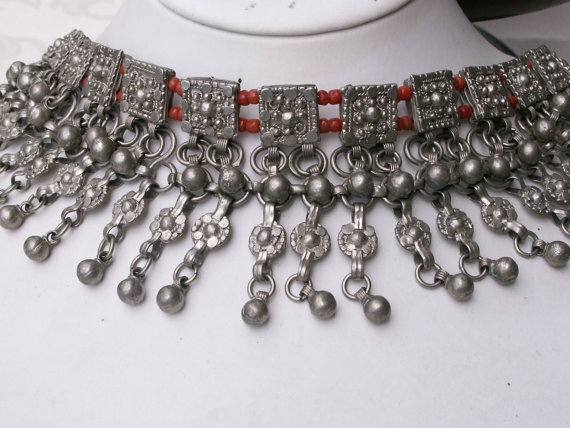 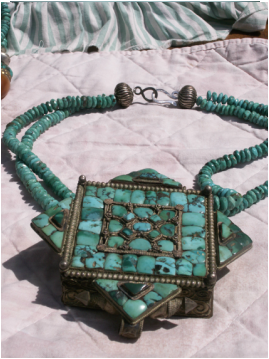 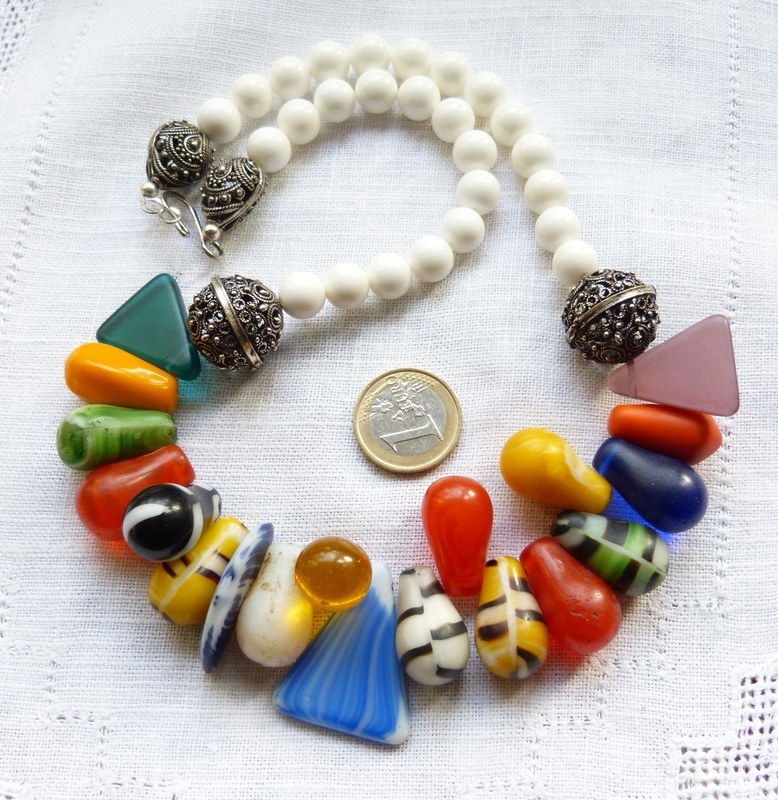 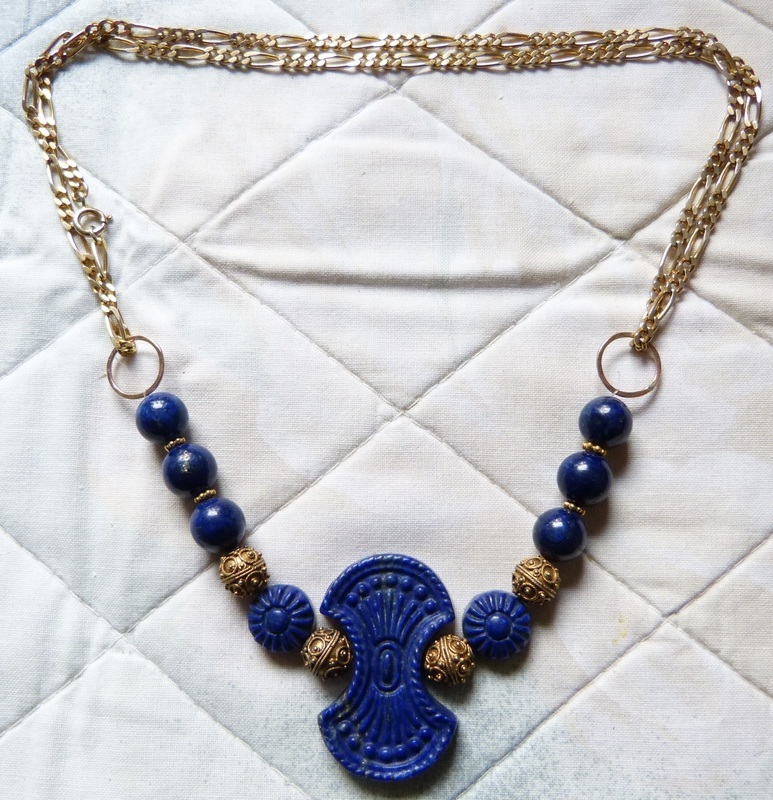 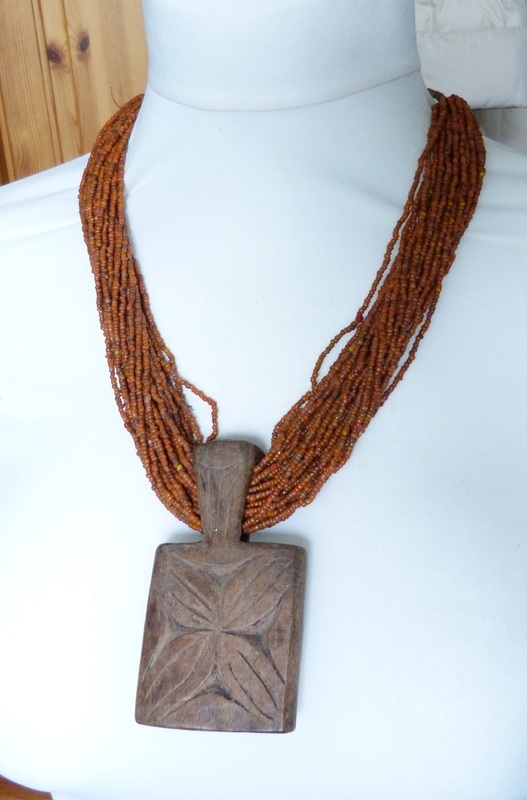 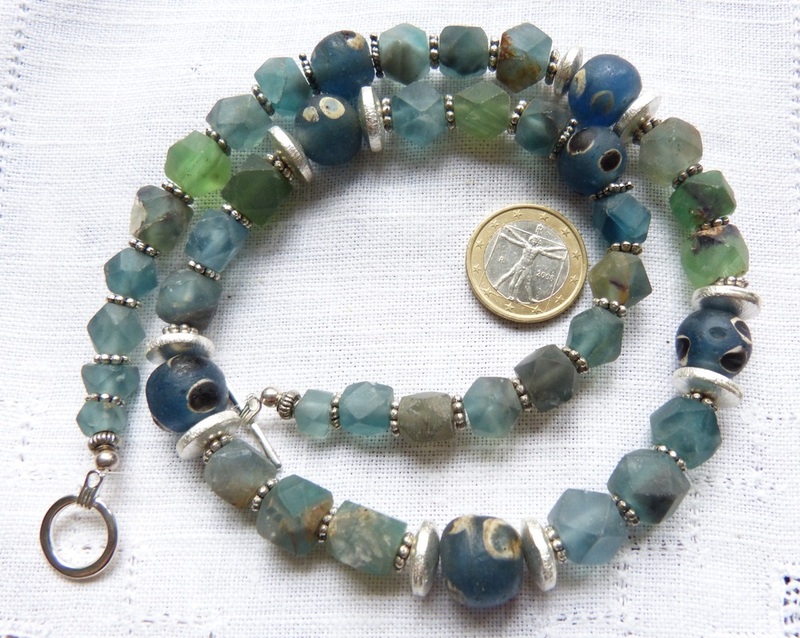 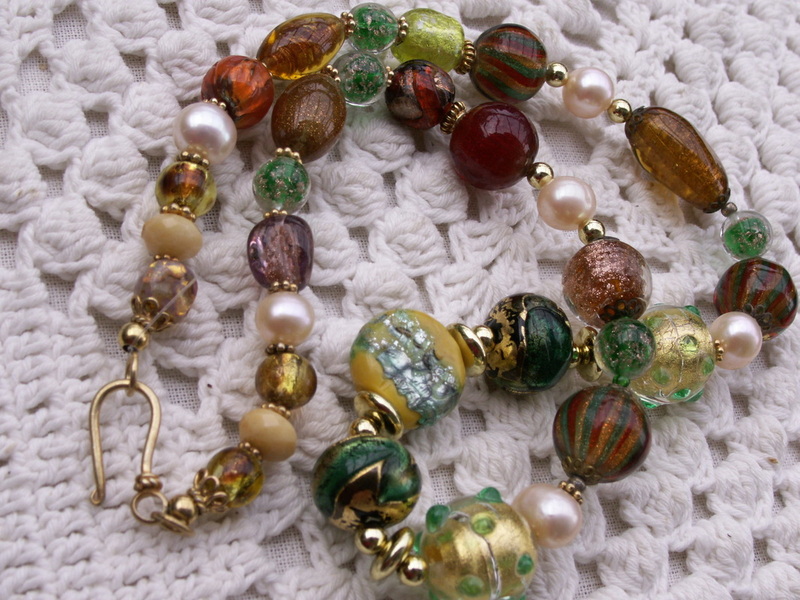 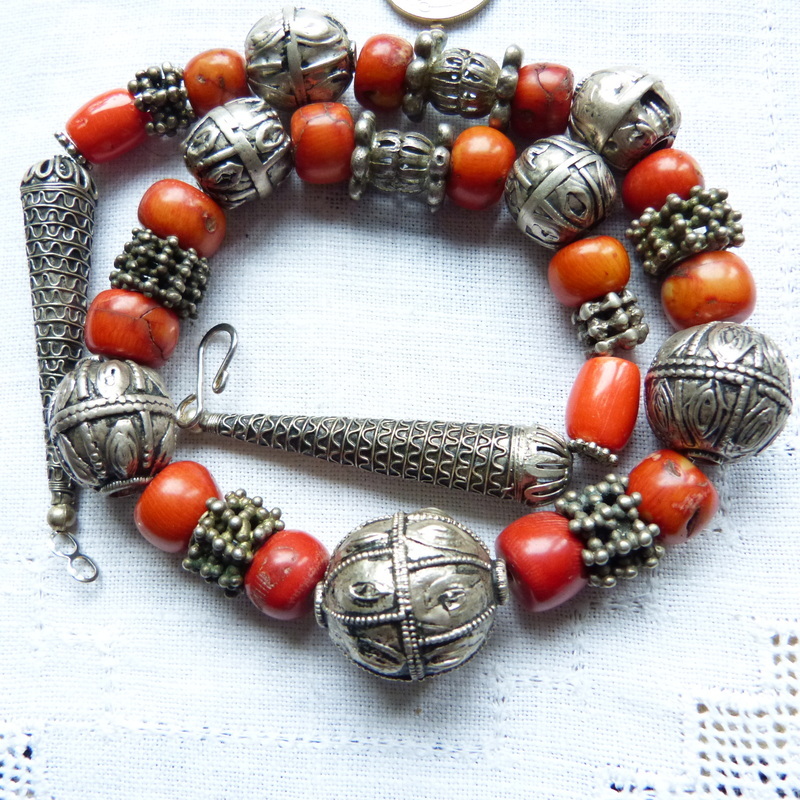 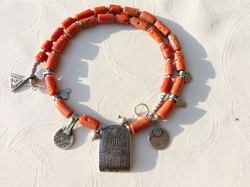 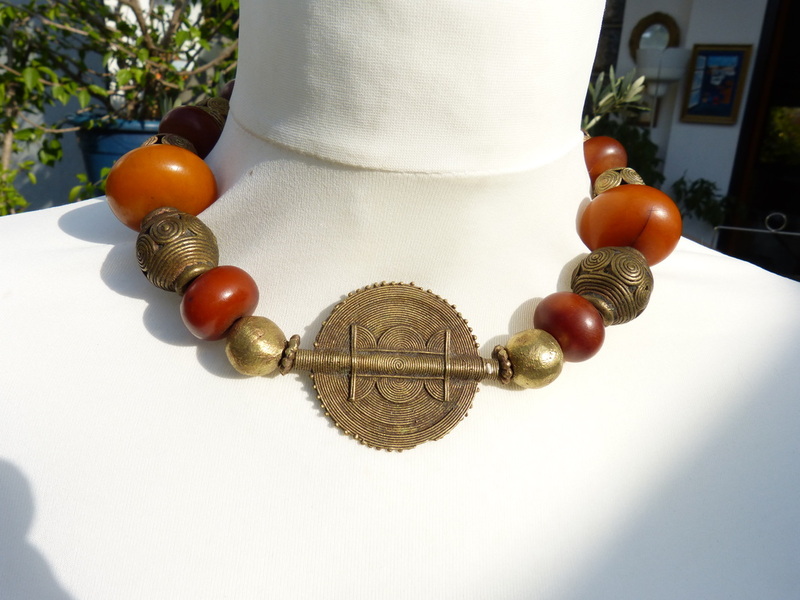 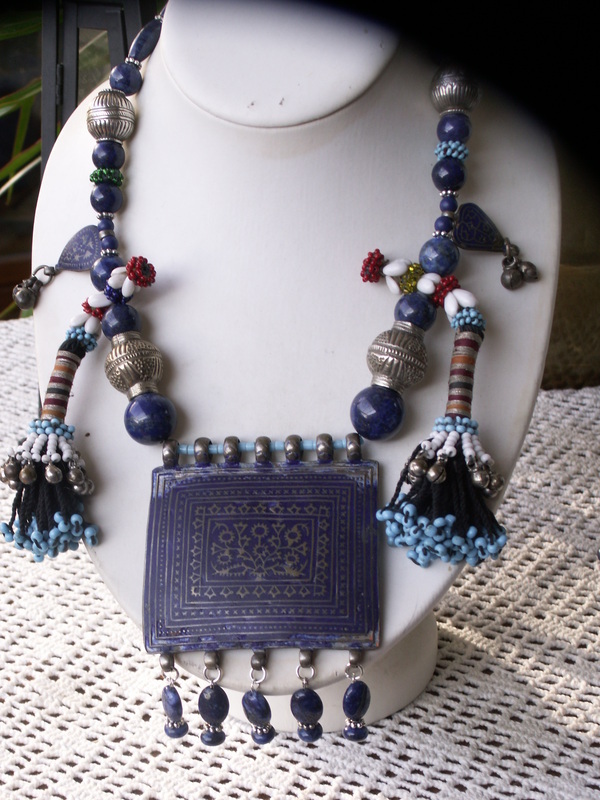 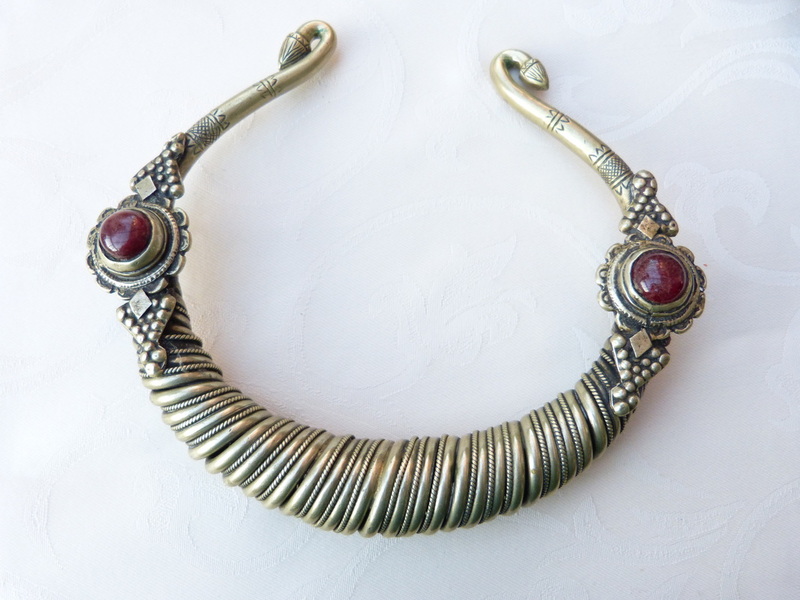 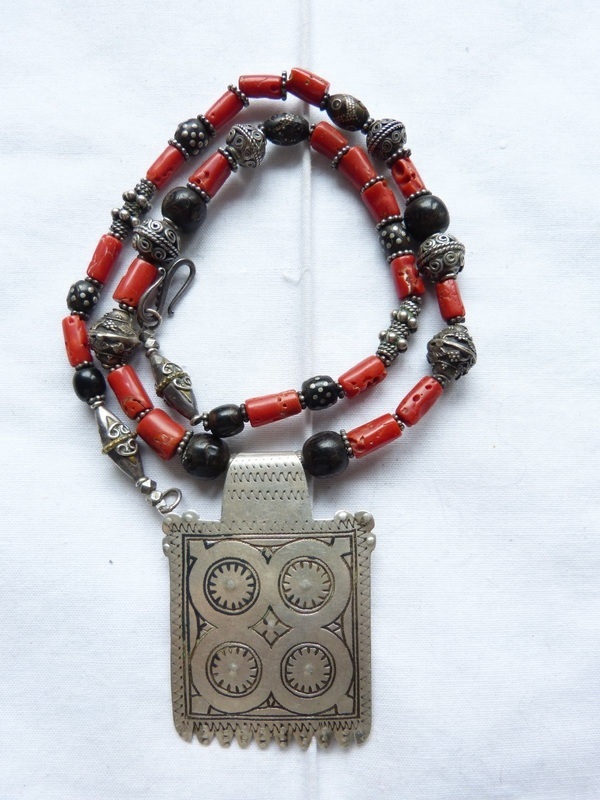 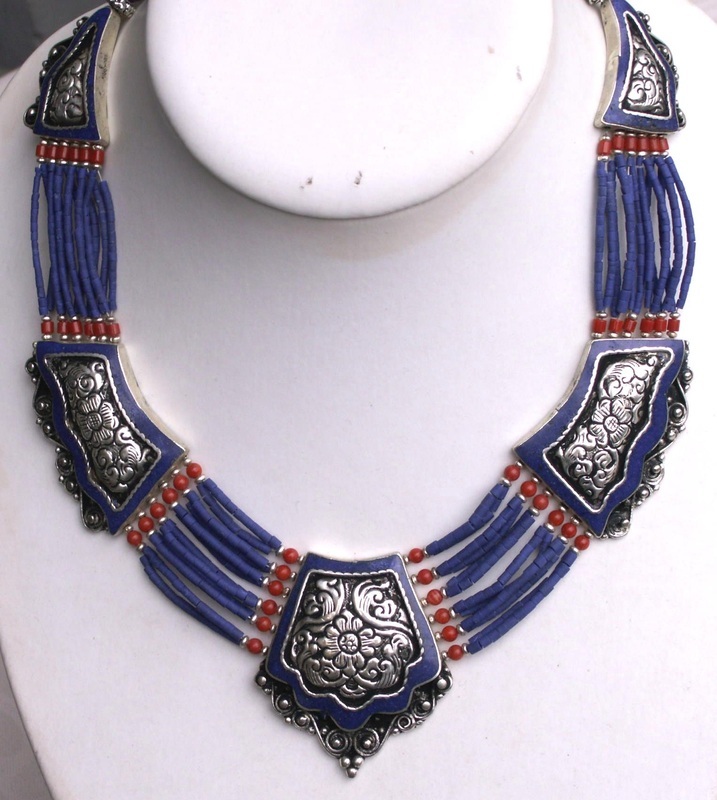 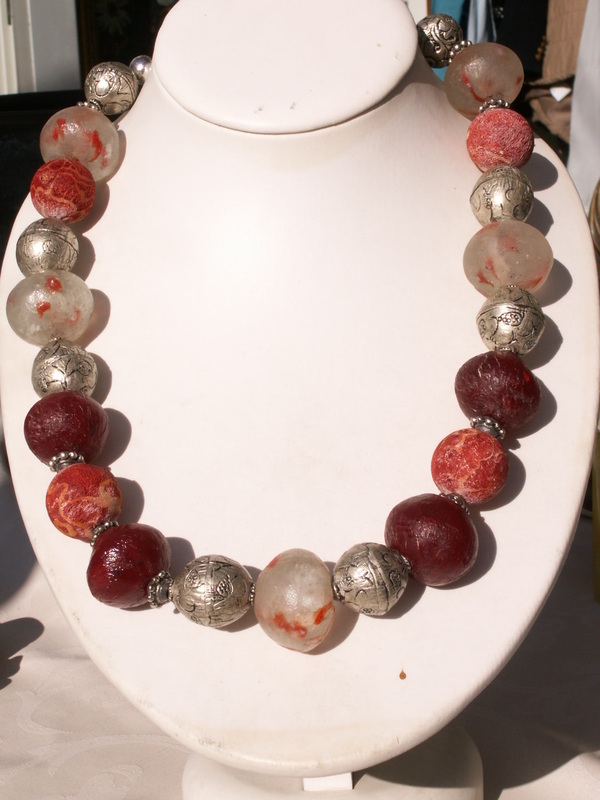 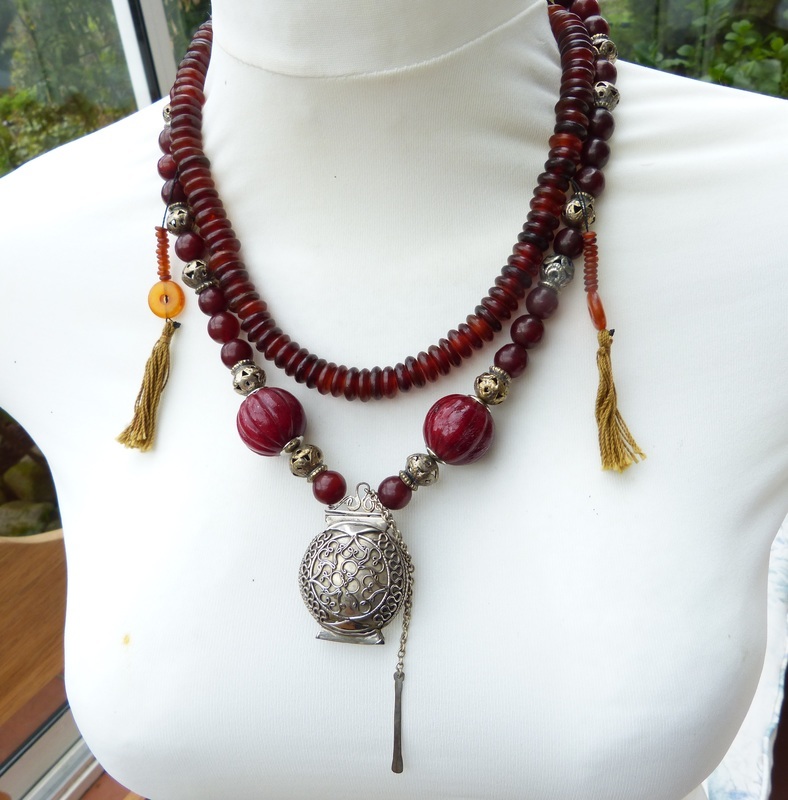 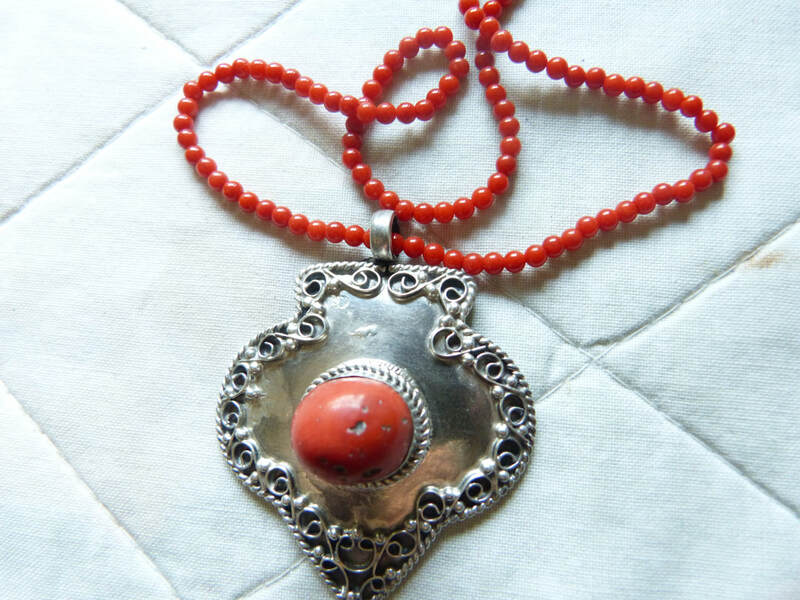 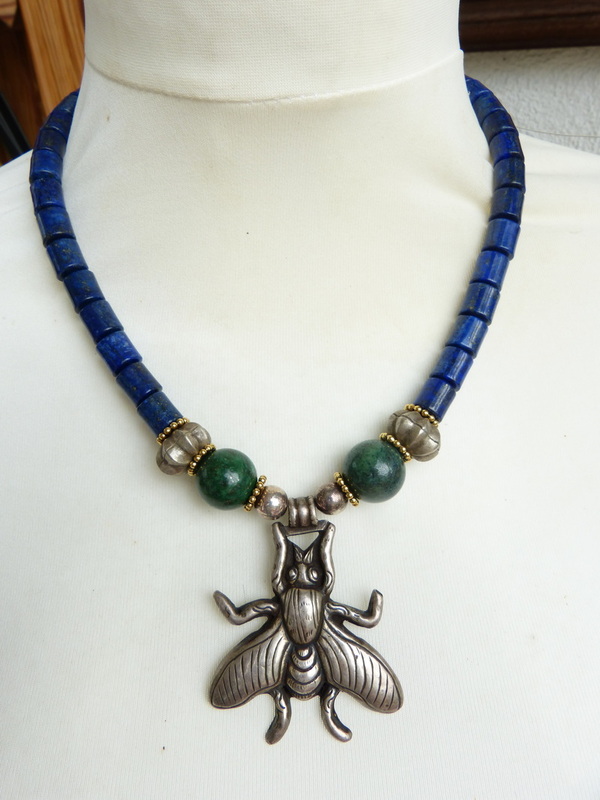 For sale here is a necklace made with genuine old powder glass KIFFA beads from Mauretania . 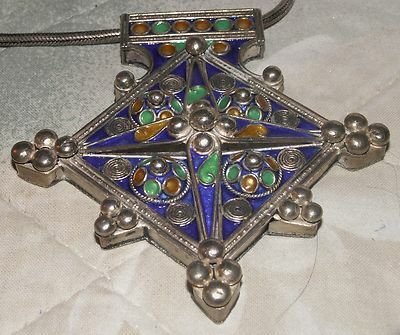 The blue triangles are all 25 mm long and from 14 to 18 mm wide. 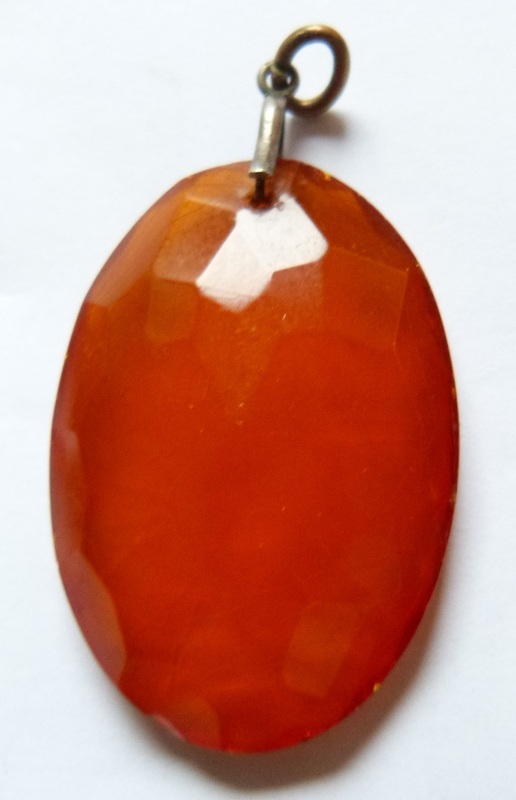 One triangle has a production fault around one white dot, the rest is in pristine condition. 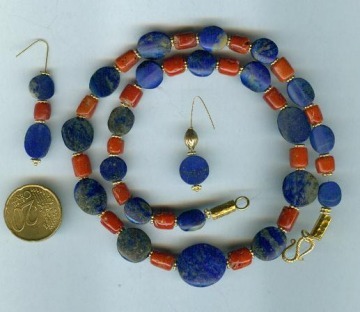 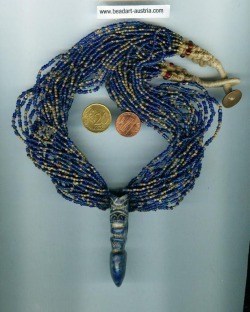 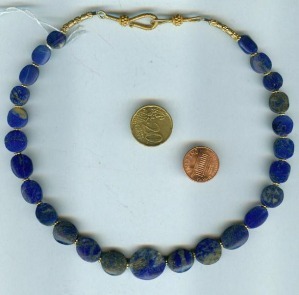 Old Senegalese "or du pays" beads (gold silver alloy) and 3 mm lapis lazuli round beads are strung between the blue Kiffa triangles. 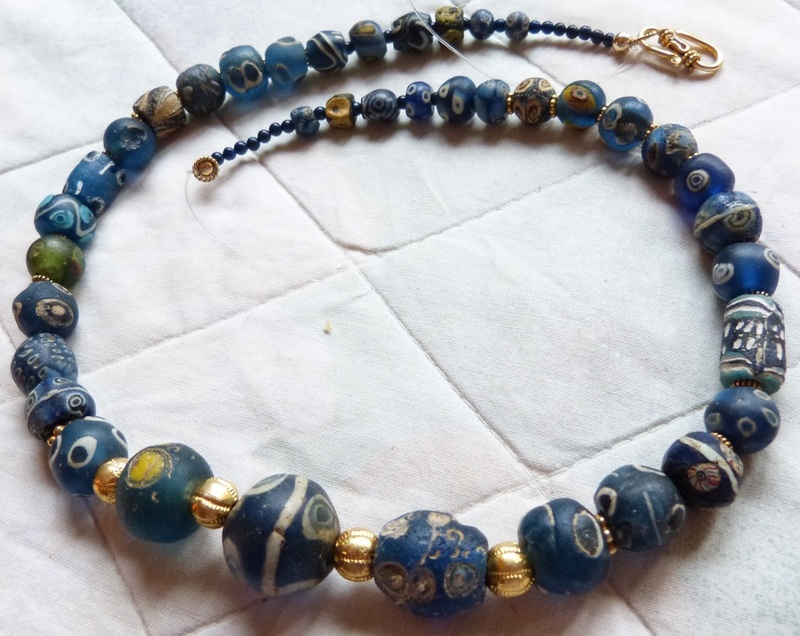 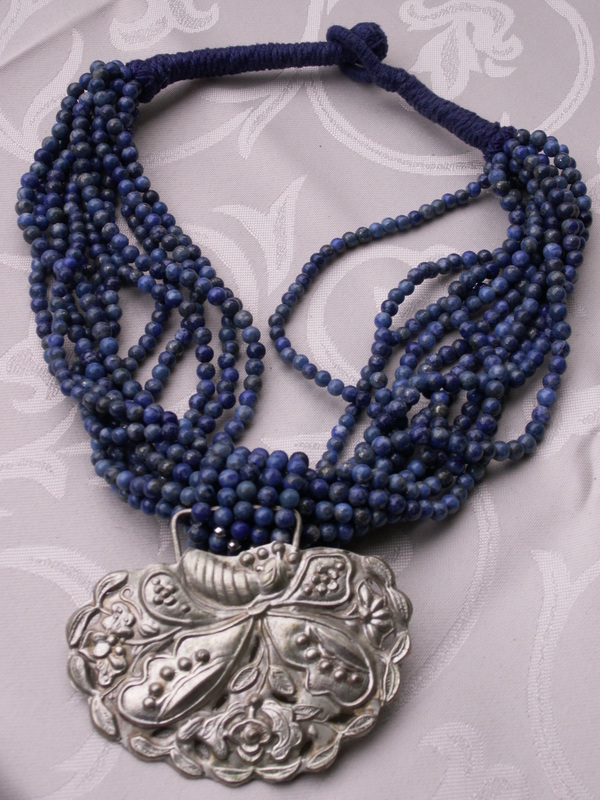 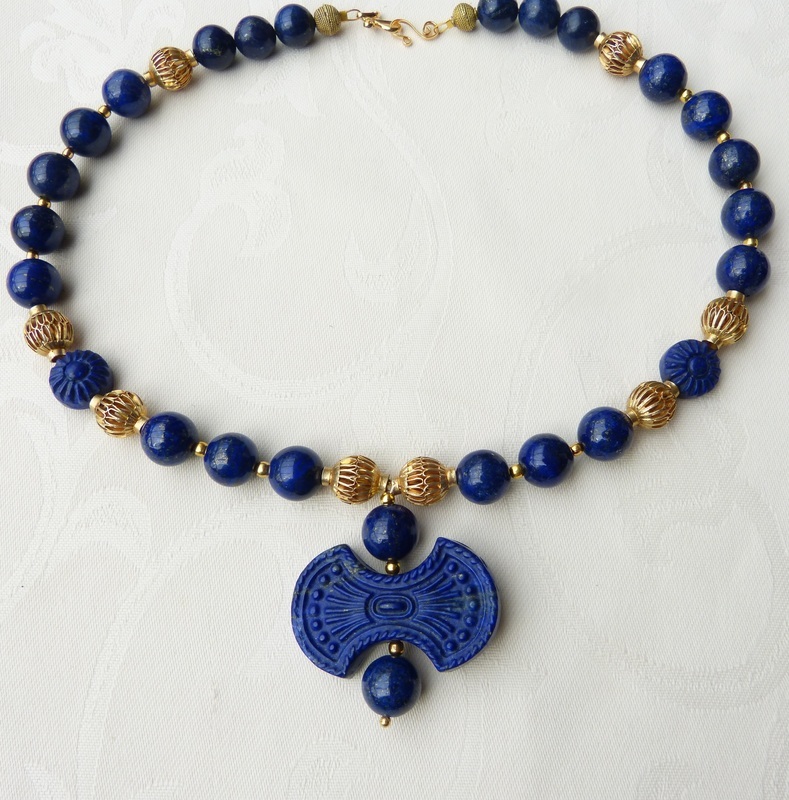 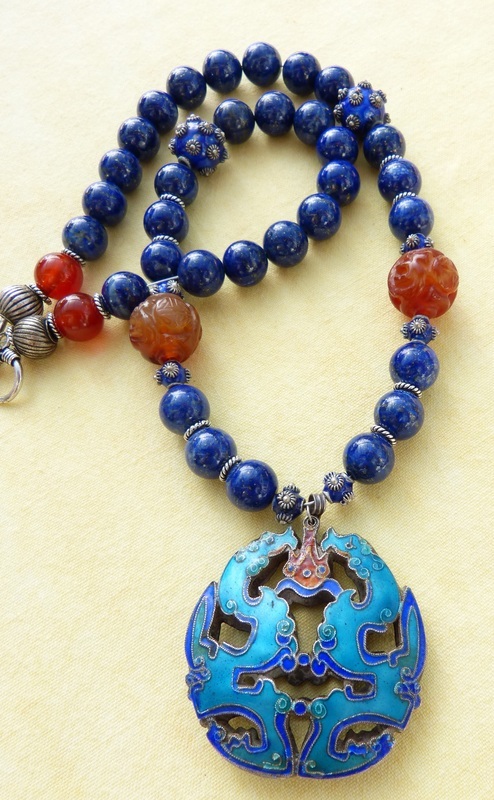 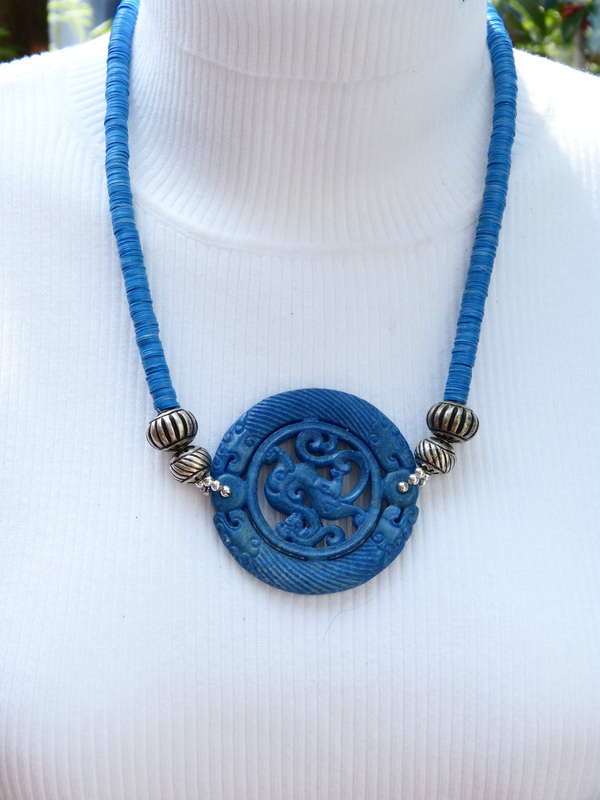 The back part of the necklace is strung with more lapis lazuli and a Bali toggle clasp. 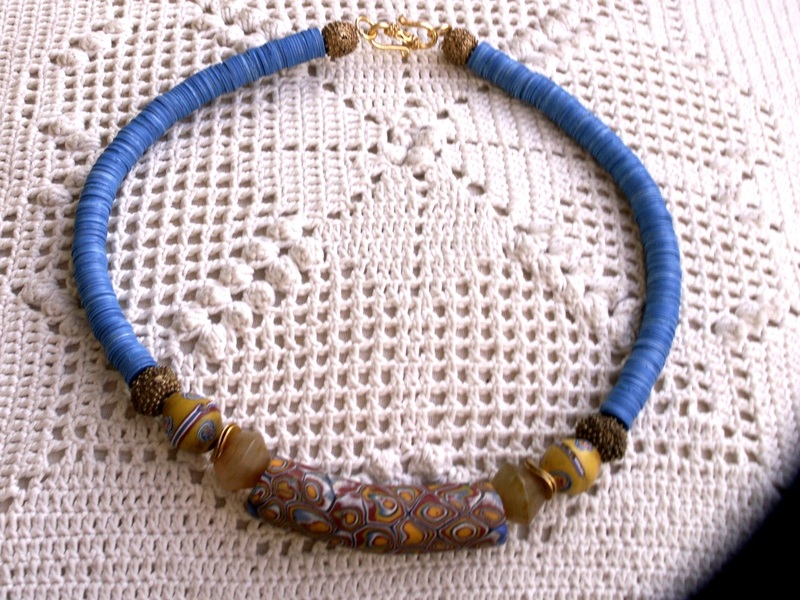 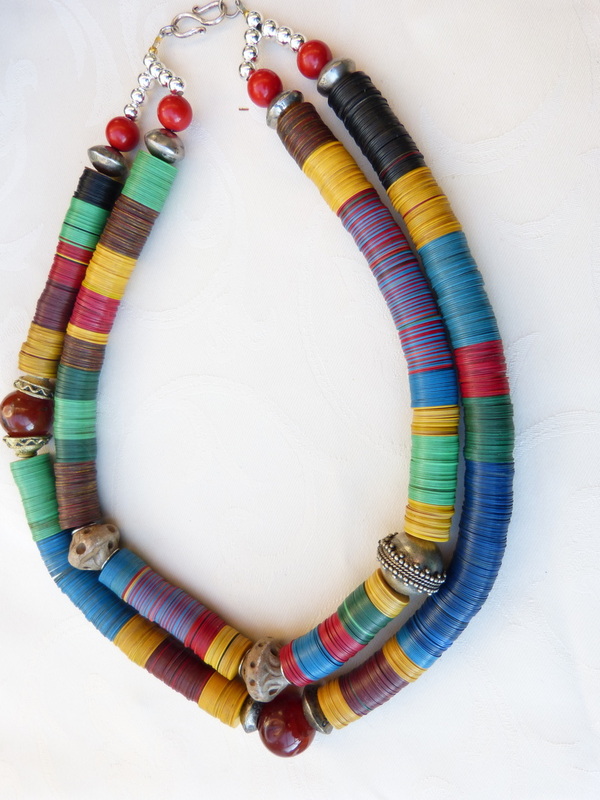 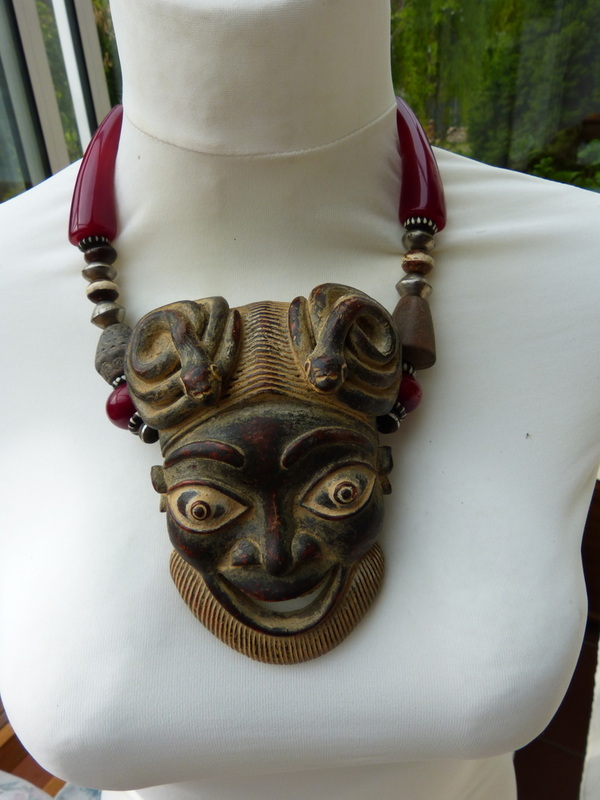 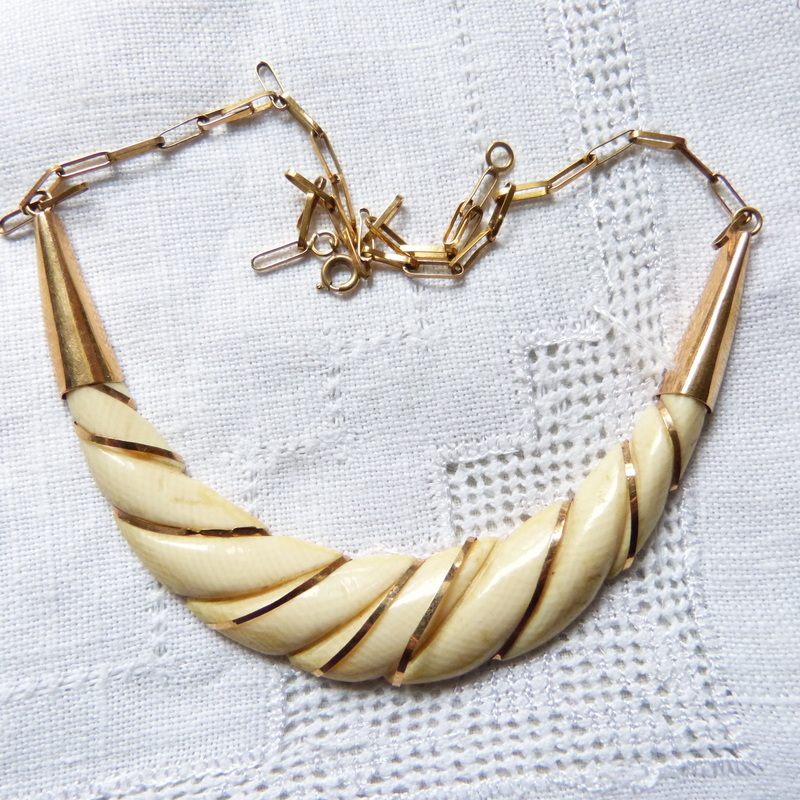 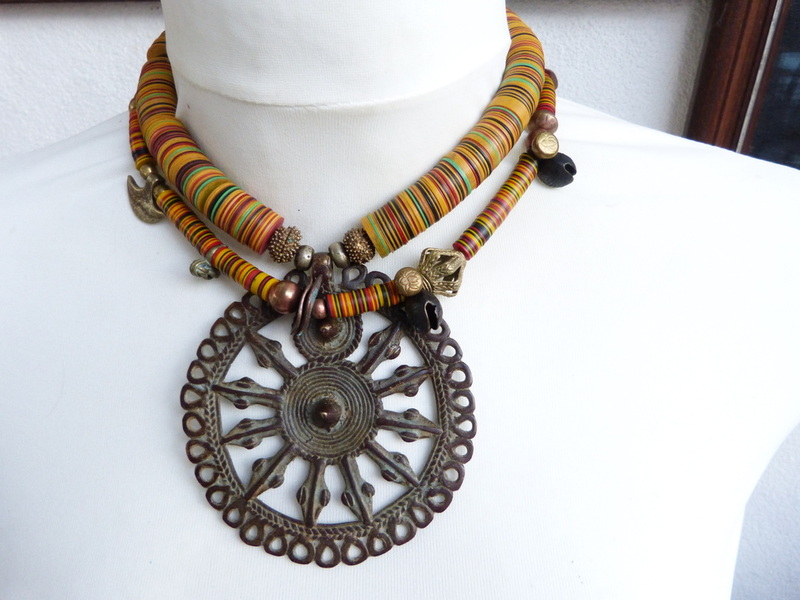 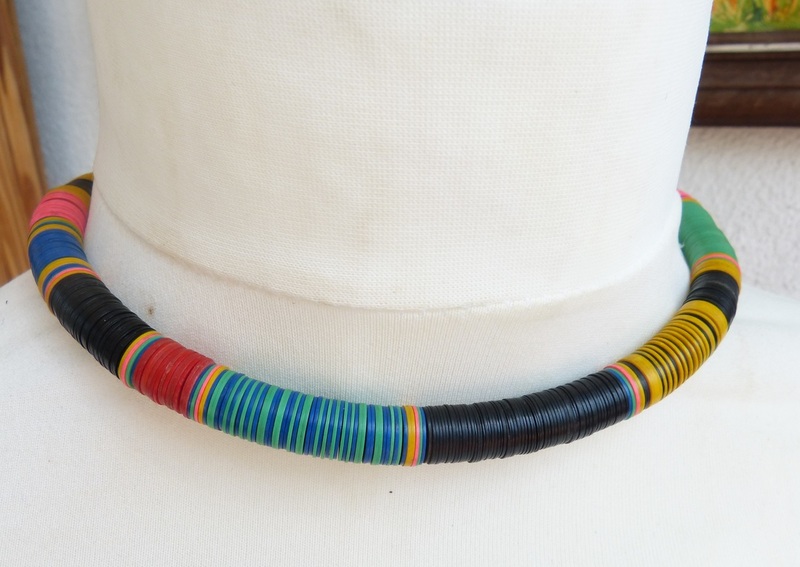 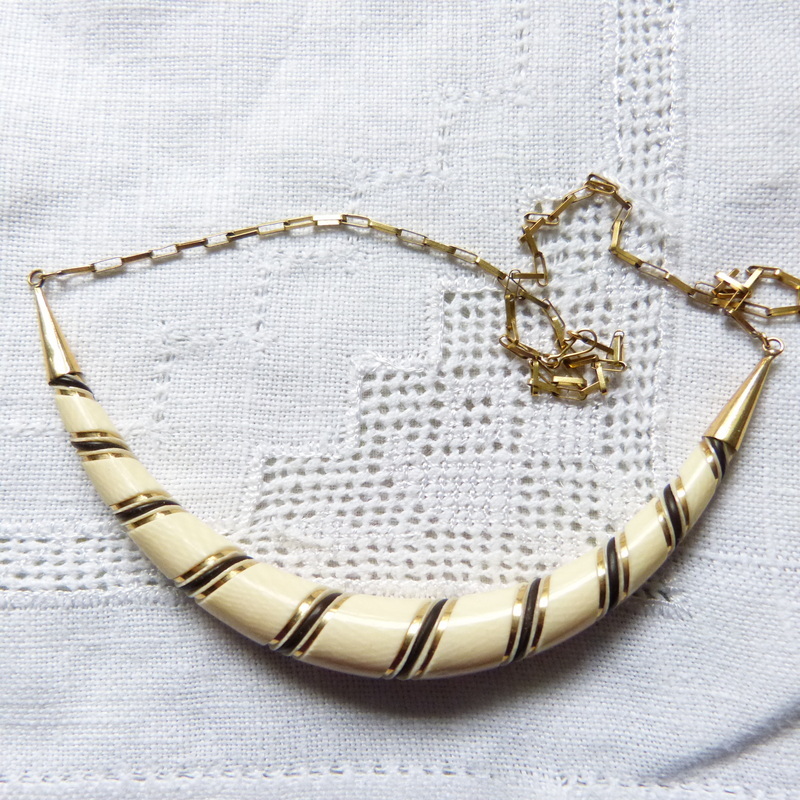 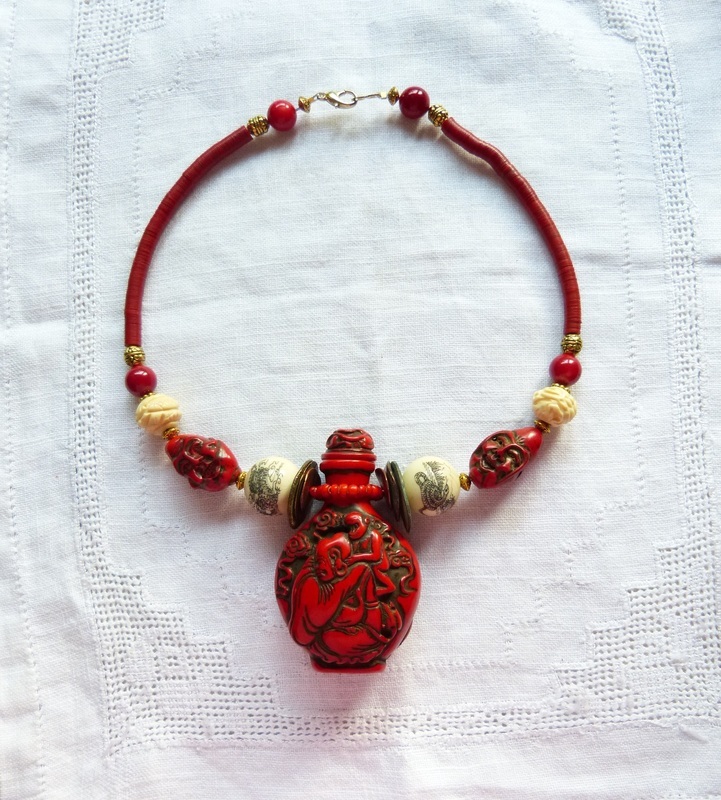 The necklace is temporarily strung on nylon, length can be adjusted to buyer's needs. 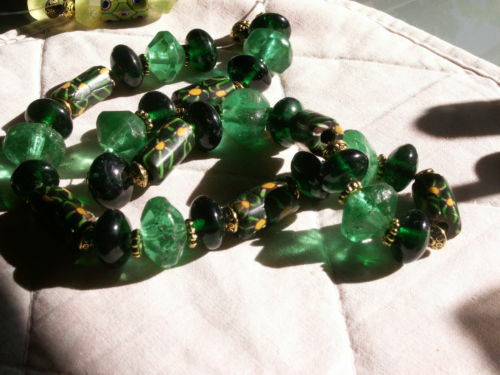 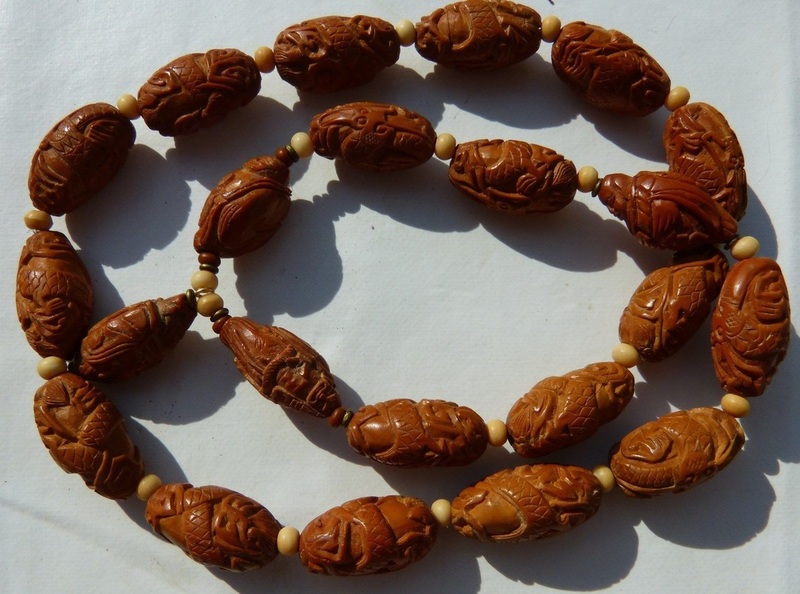 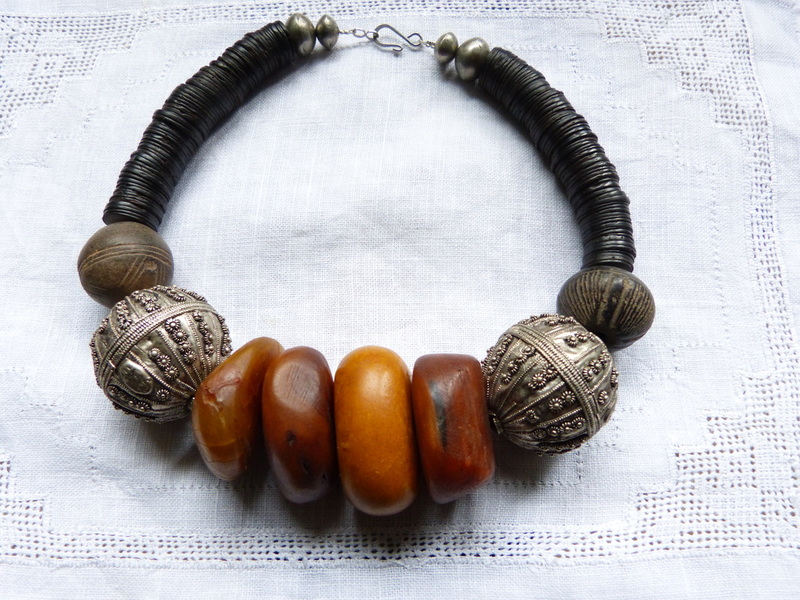 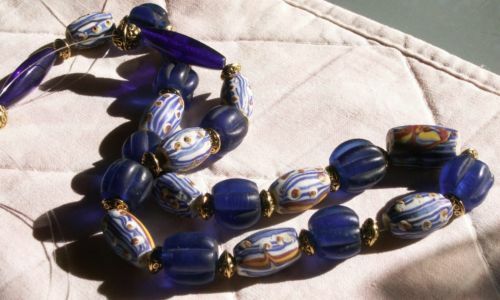 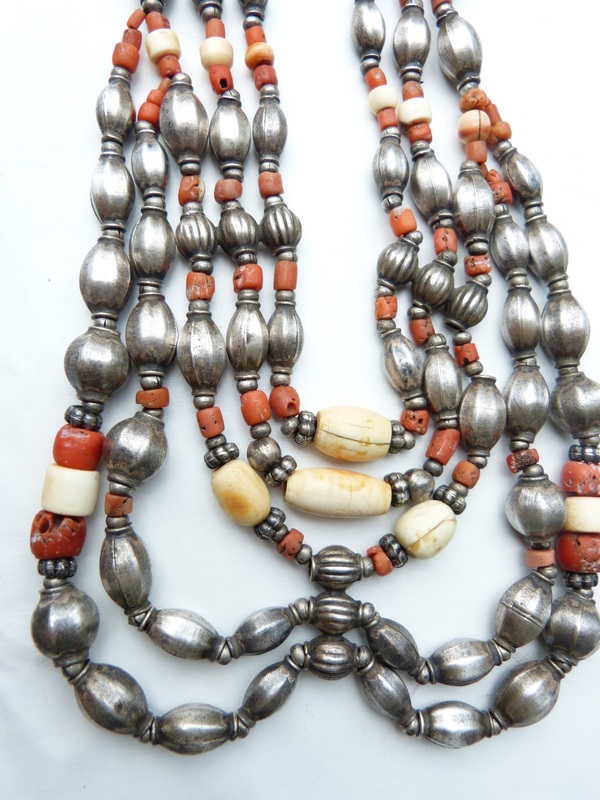 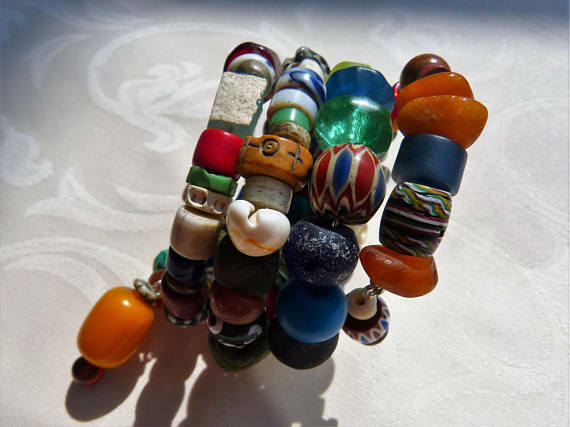 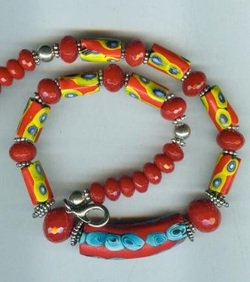 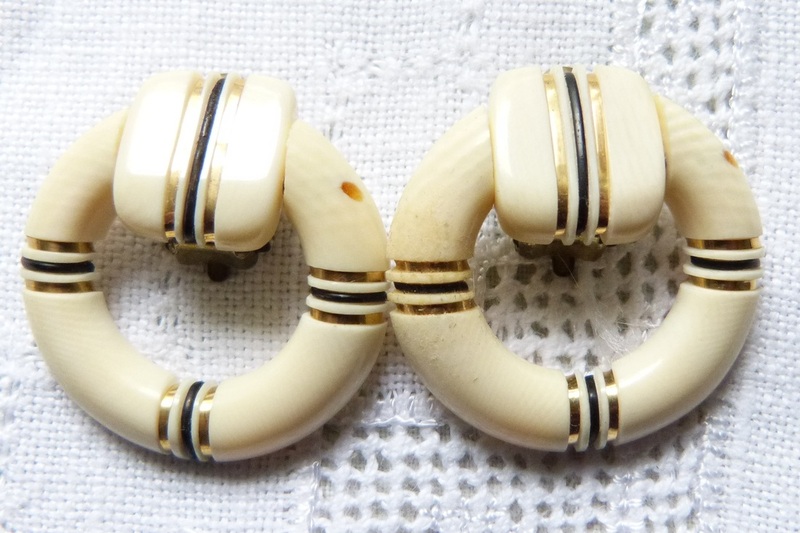 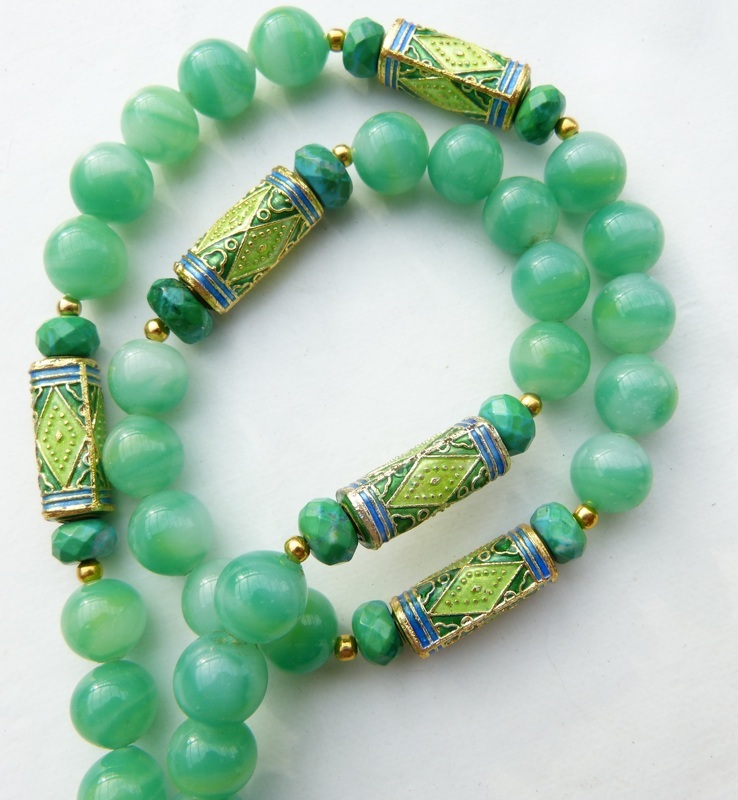 The powder glass Kiffa beads from Mauretania are the most highly prized African made beads. 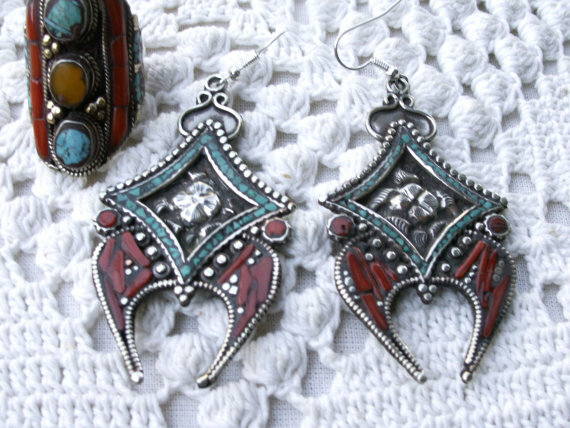 Their beauty is only exceeded by their rarity. 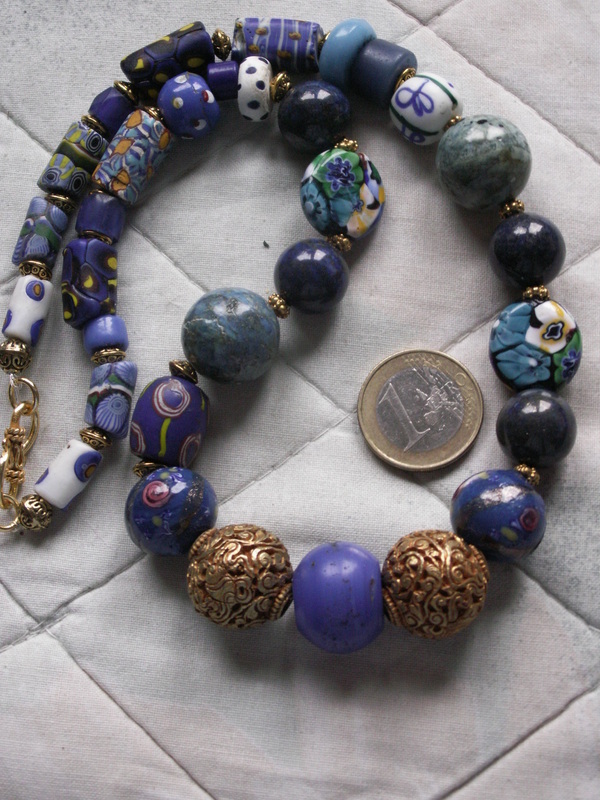 Each bead was made by a skilled woman in and around the city of Kiffa in Mauretania using only powdered glass and saliva in a tiny homemade oven, a process now lost to history. 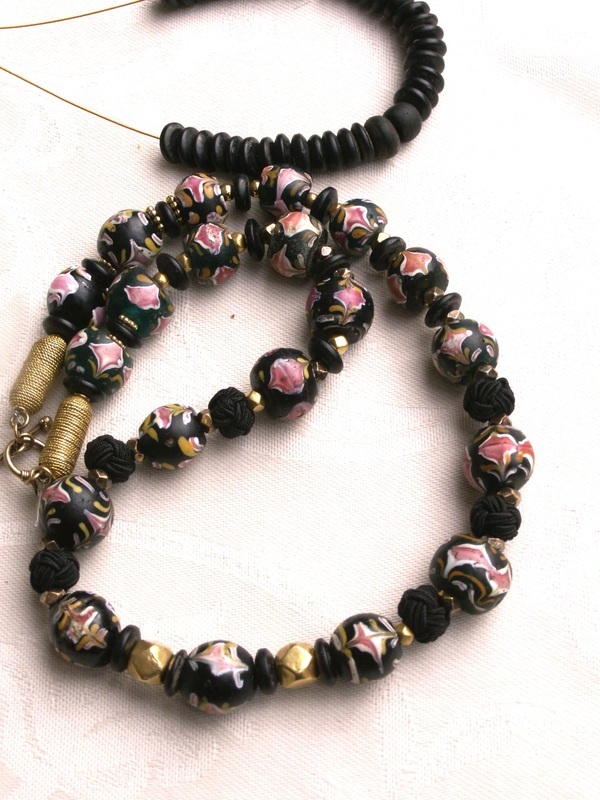 These beads were never made in great quantity but only for the use of family members of the woman who made them. 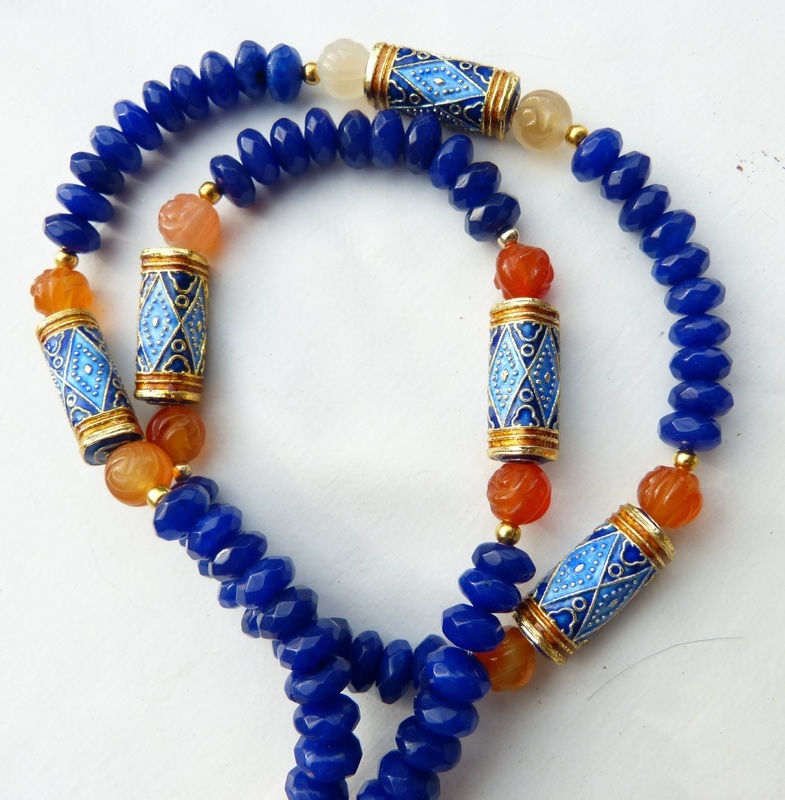 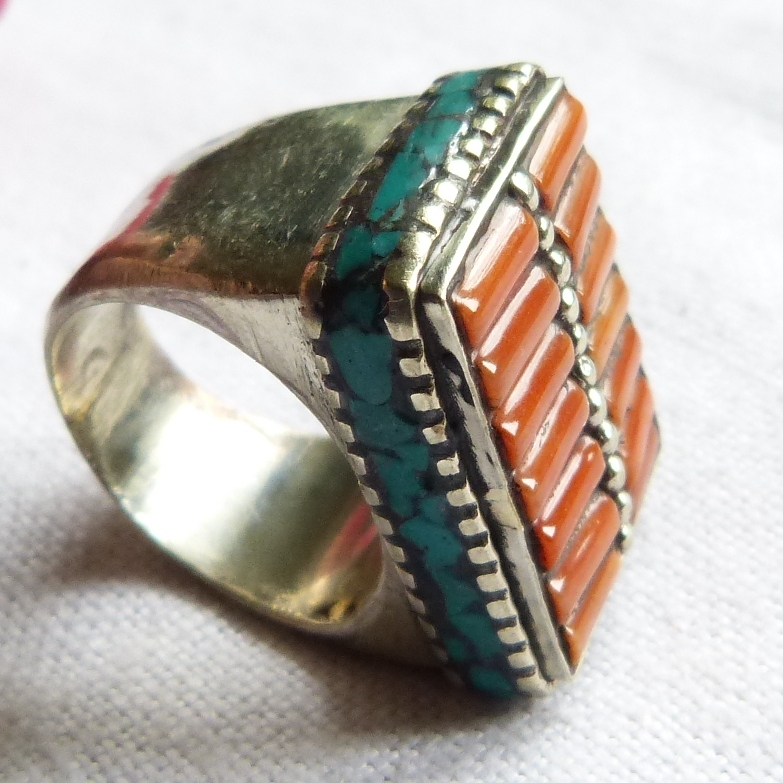 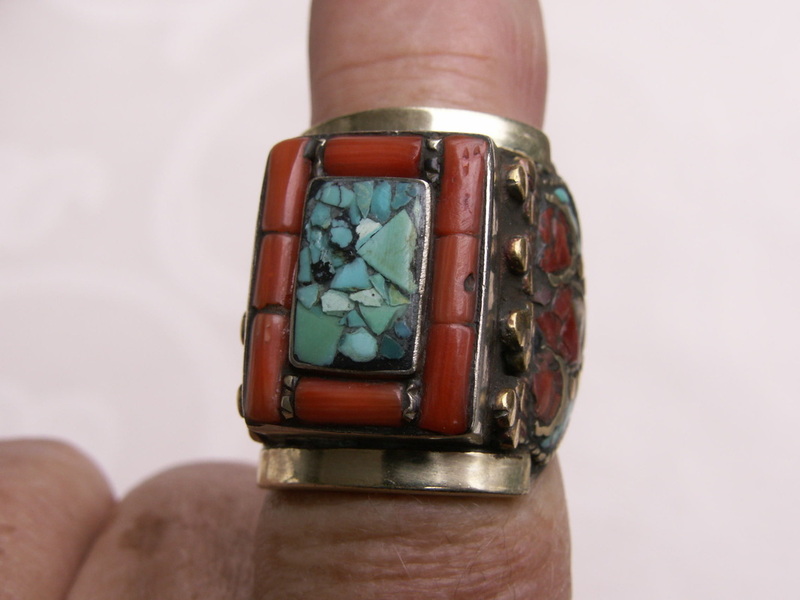 Recently there has been a revival in the manufacture of Kiffa beads for the trade, the new beads are also beautiful but they do not come close in the extreme detail and superb execution of the old beads. 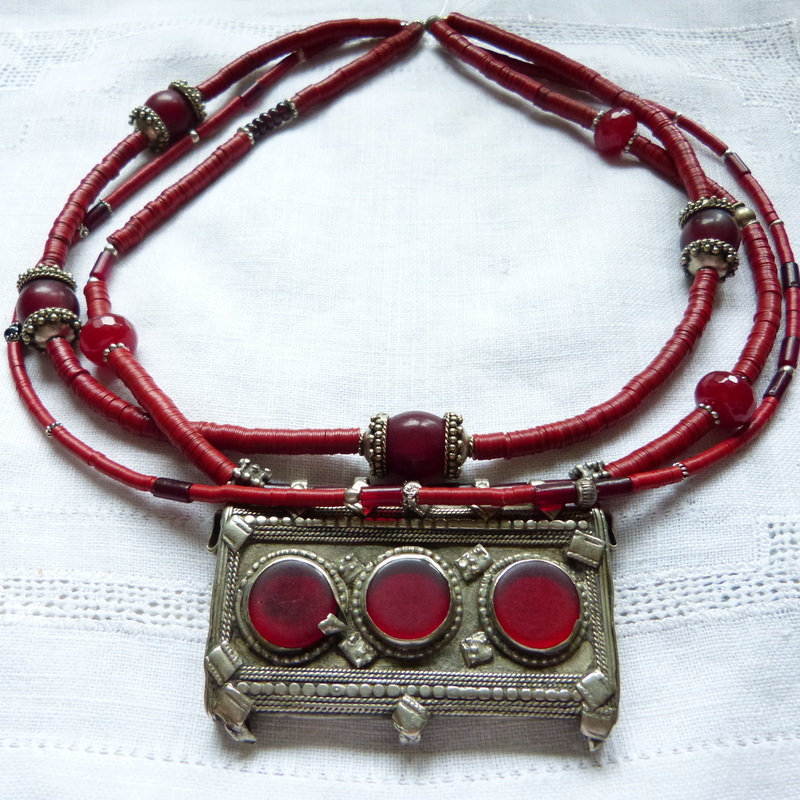 A lovely 19th century 22 ct Moghul pendant from Jaipur with rubies and tiny pearls is strung on a necklace with cultured pearls , faceted rubies and tiny vermeil spacers. 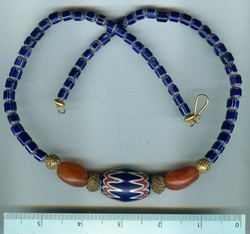 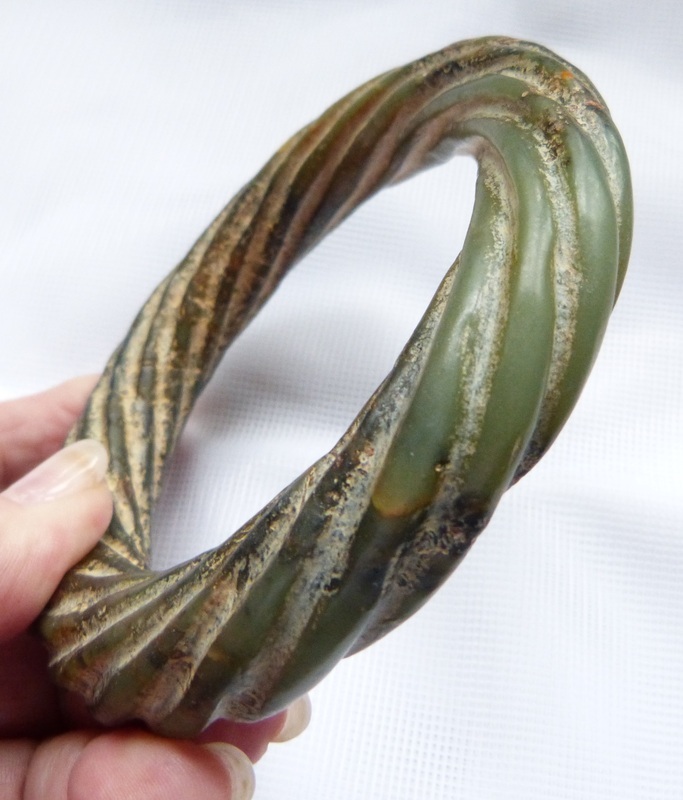 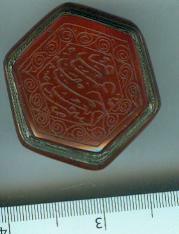 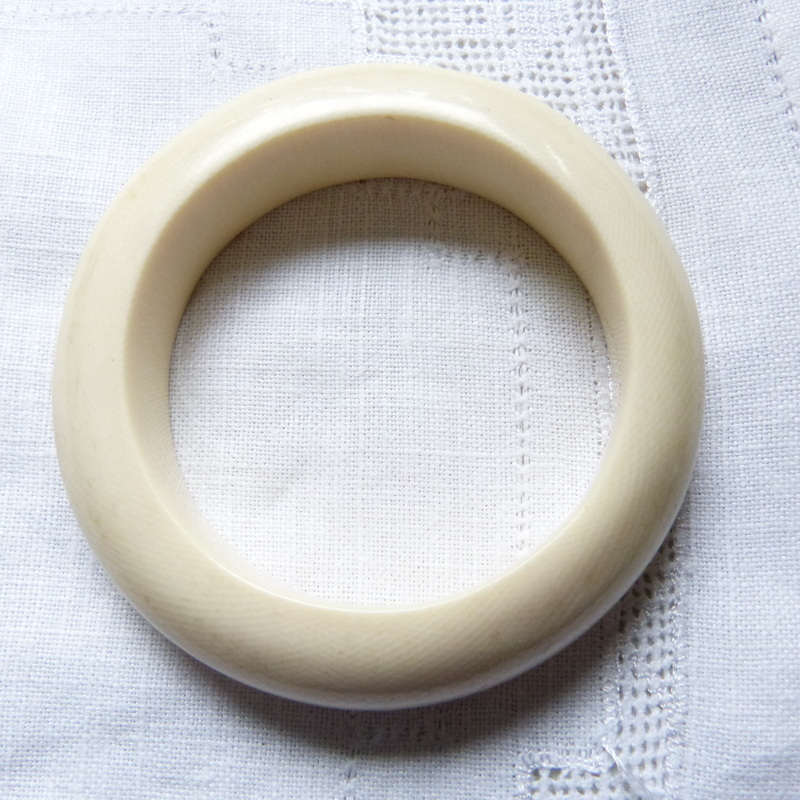 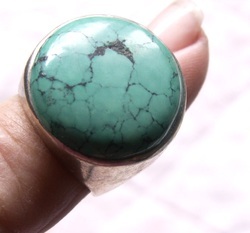 Length 40 cm, pendant 30 x 30 mm. 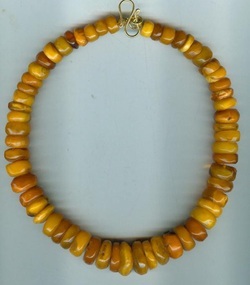 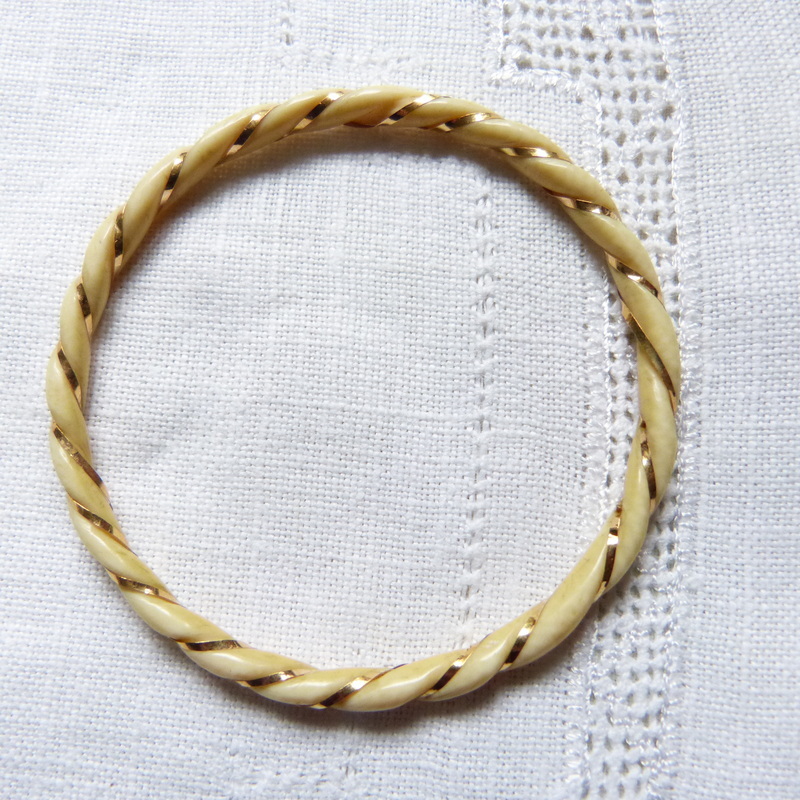 18 ct gold end beads, Bali vermeil clasp. 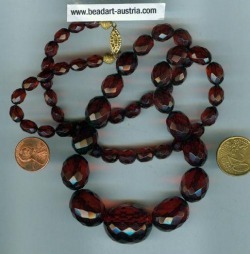 See also earring page - 18 ct gold earrings with rubies for sale there! 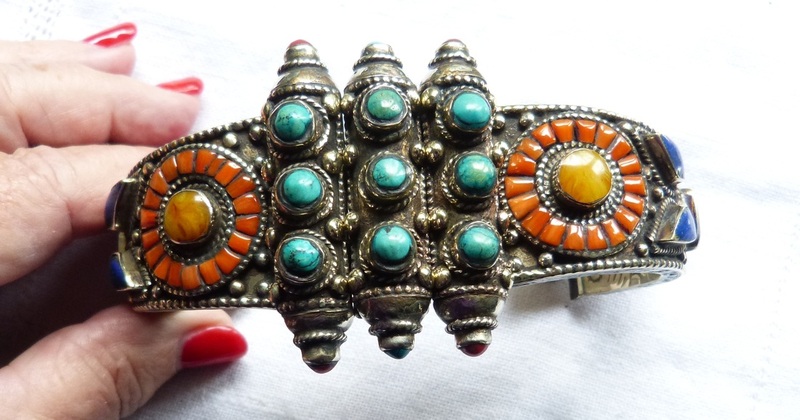 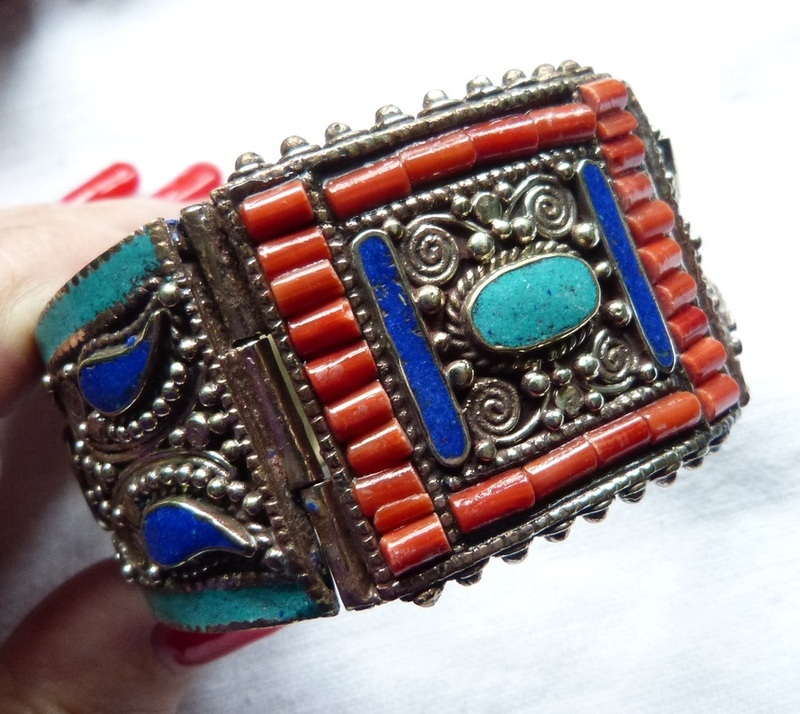 NL632 - Beautiful raw Baltic amber, turquoise, Baoulé "gold"
An old exquisite brass or gilded silver brooch from China (marked China on the back) has an old brass chain fixed to the pin. 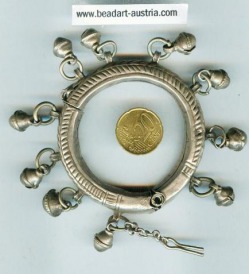 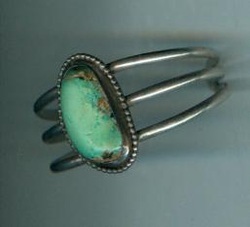 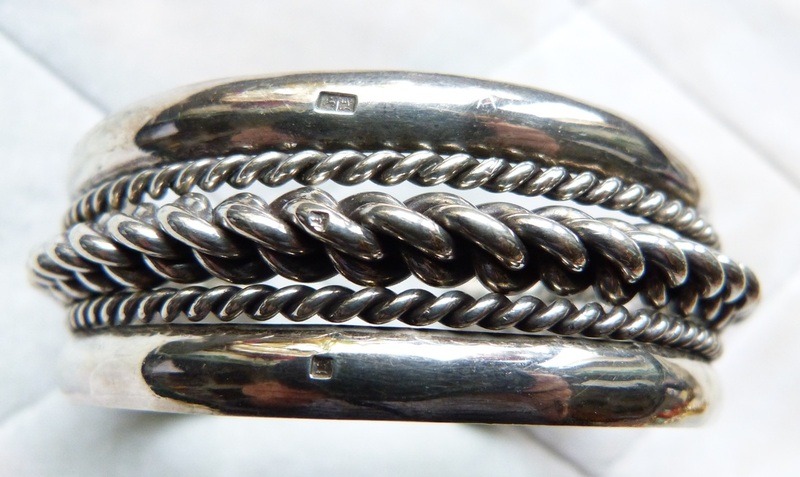 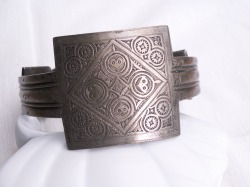 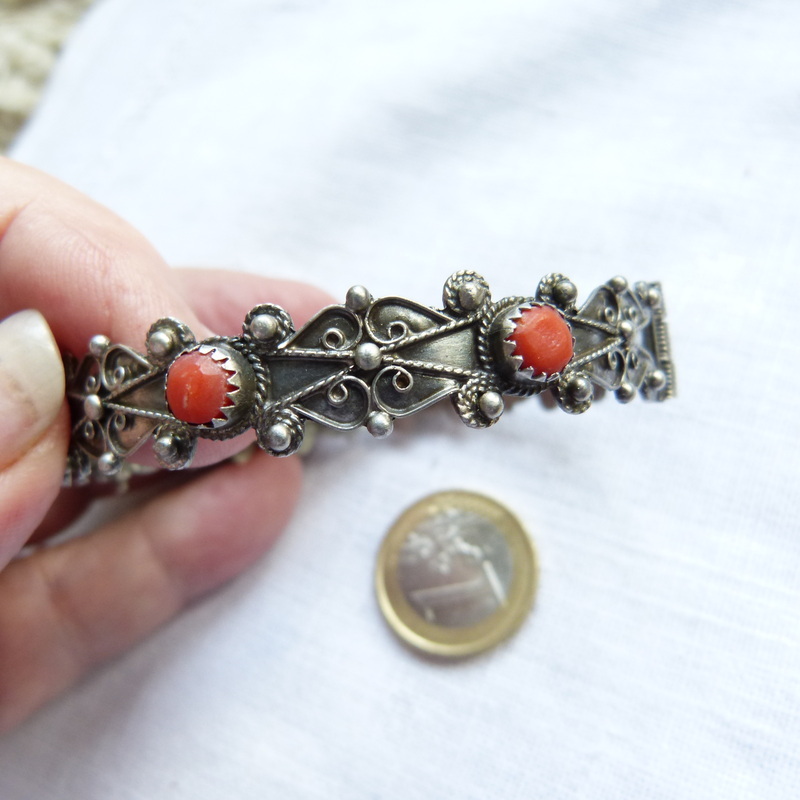 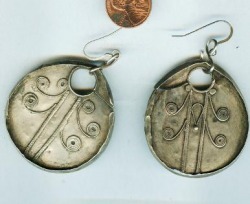 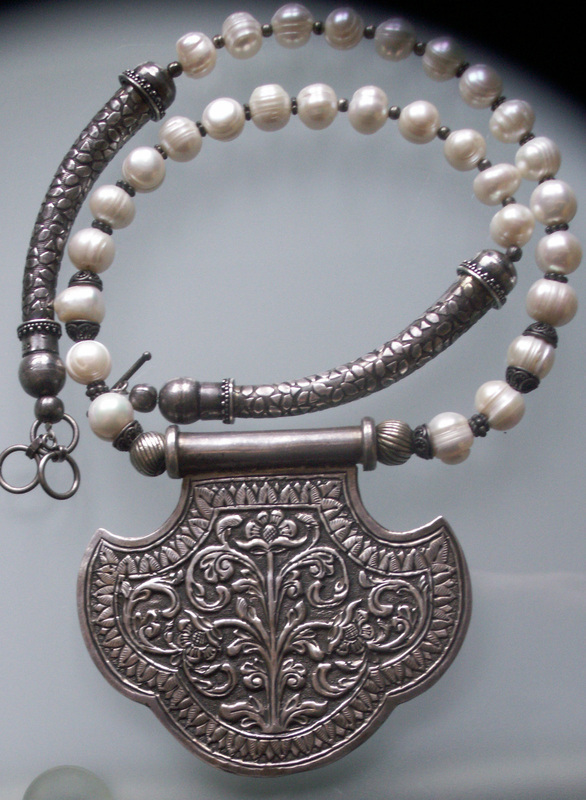 The brooch can be worn as pendant with the chain, or as brooch (the chain can be removed. 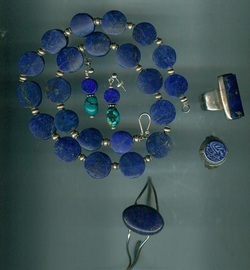 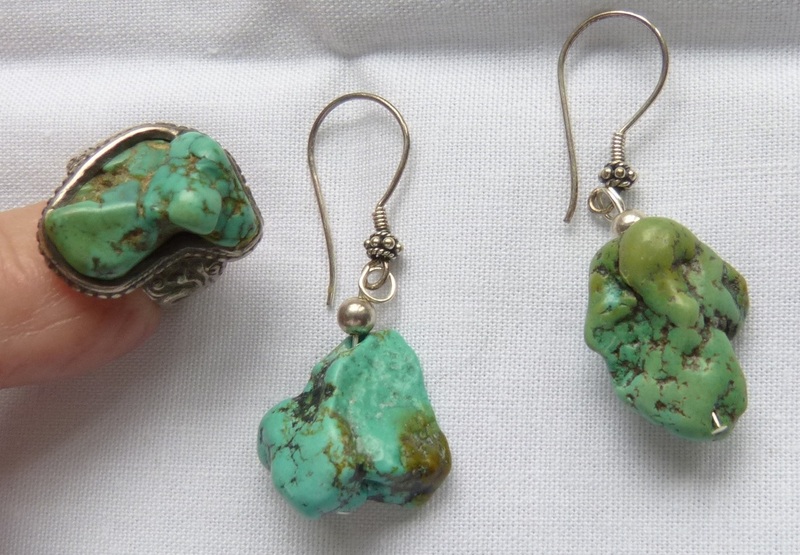 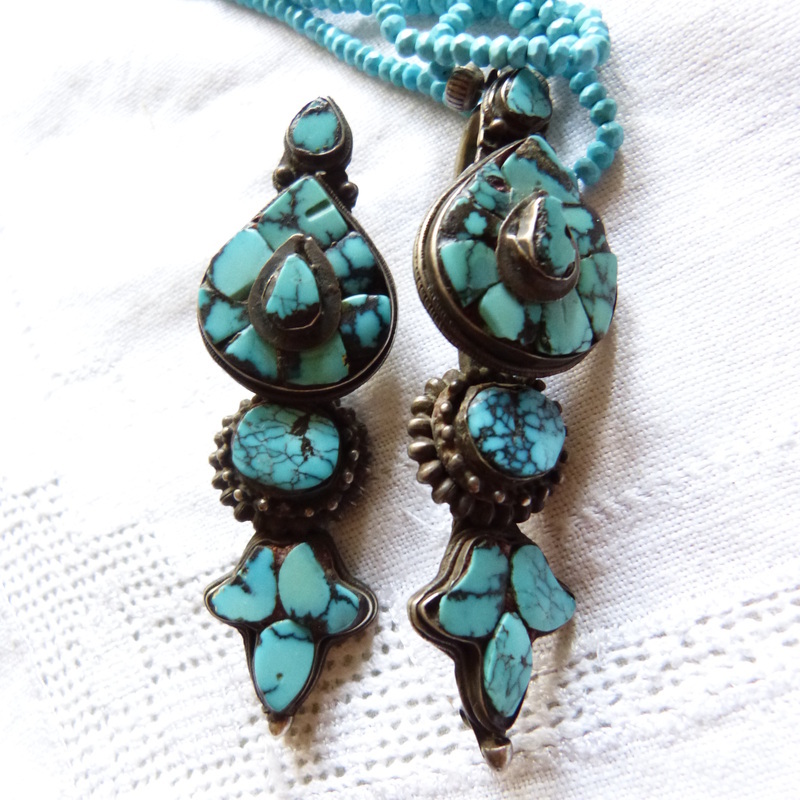 the four turquoise dangles are original the two lapis dangles have been added to replace missing parts! 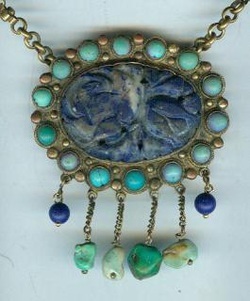 Brooch 57 x 70 mm, chain 60 cm, could be slipped overhead like a flapper necklace! 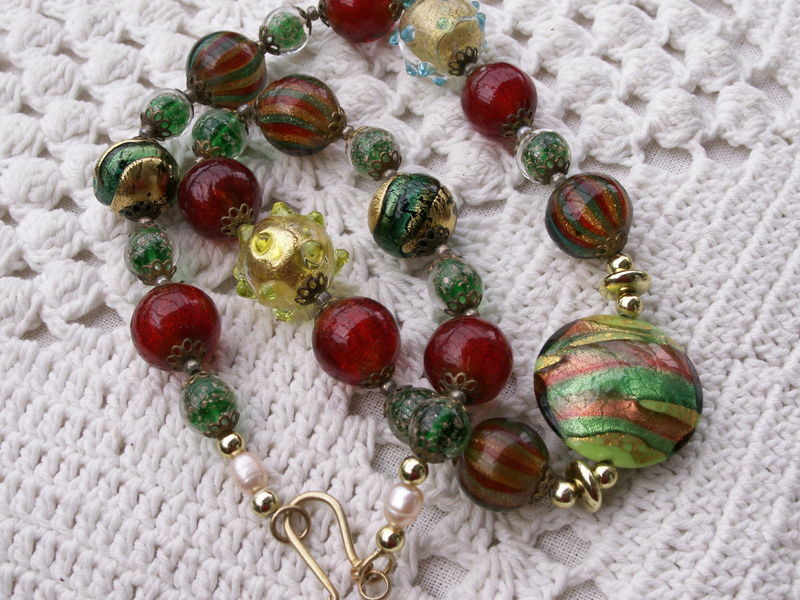 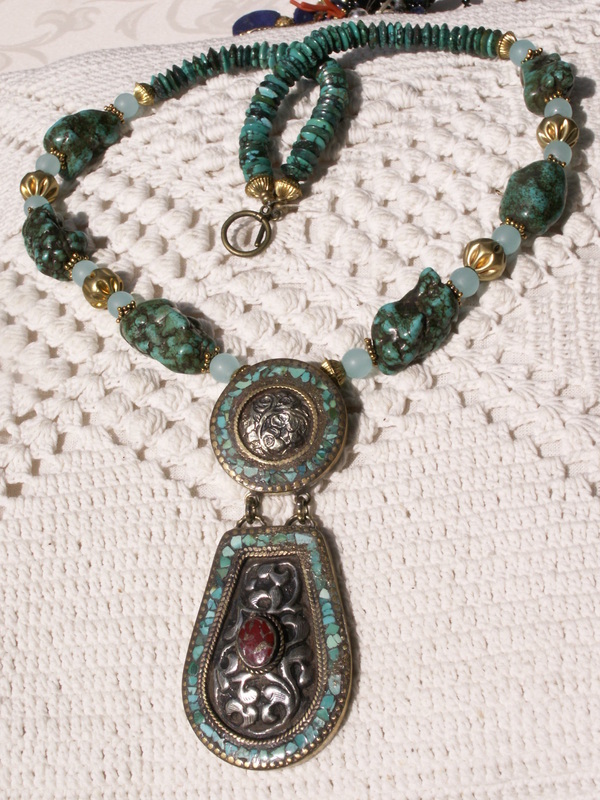 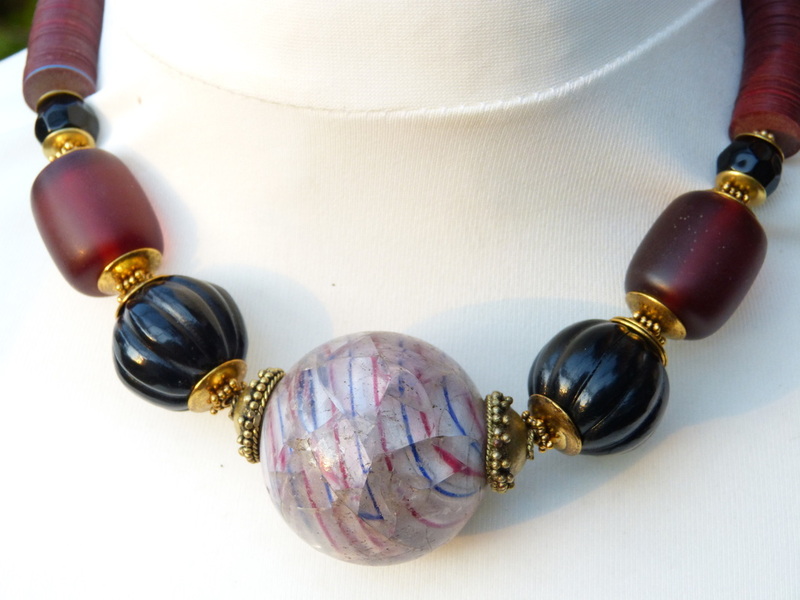 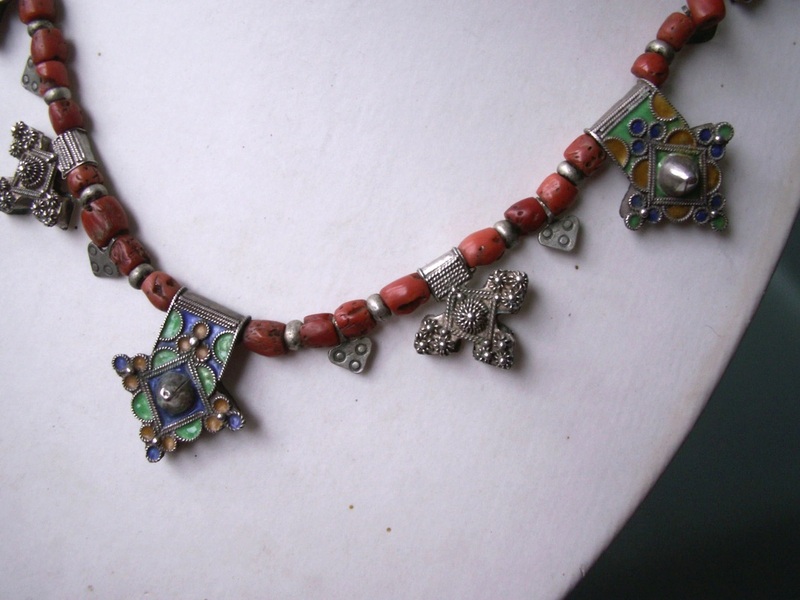 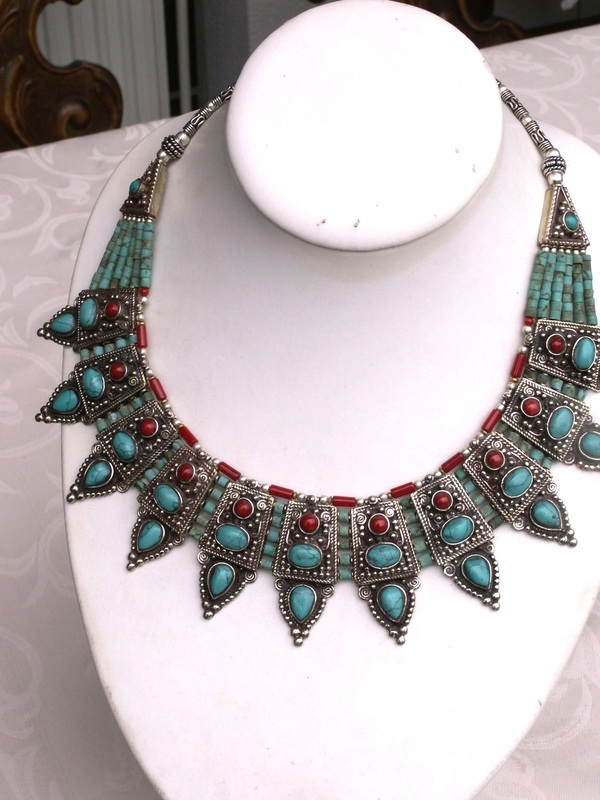 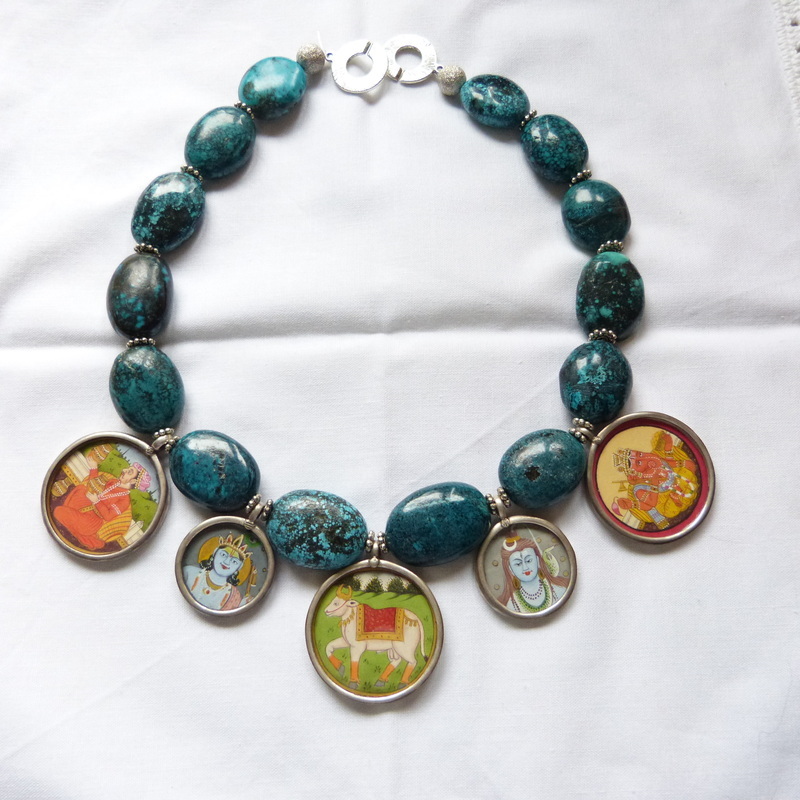 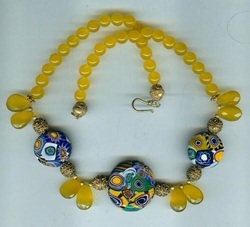 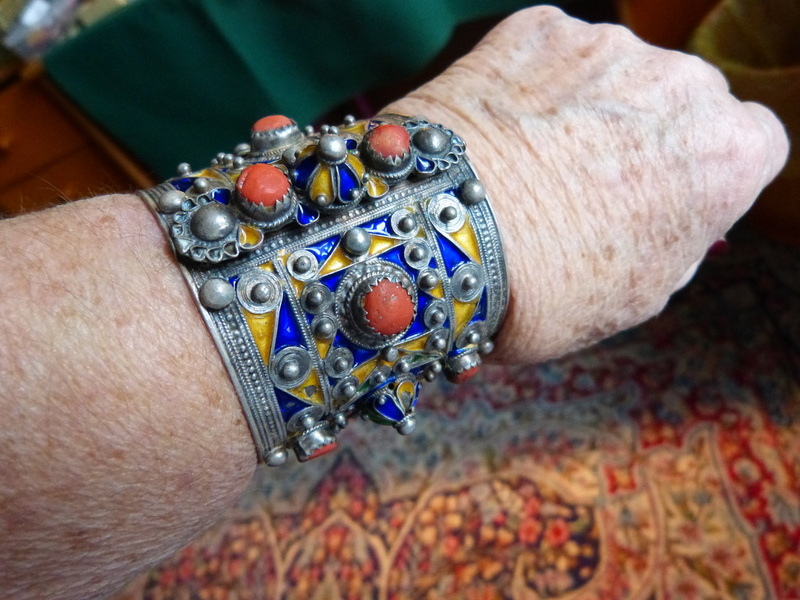 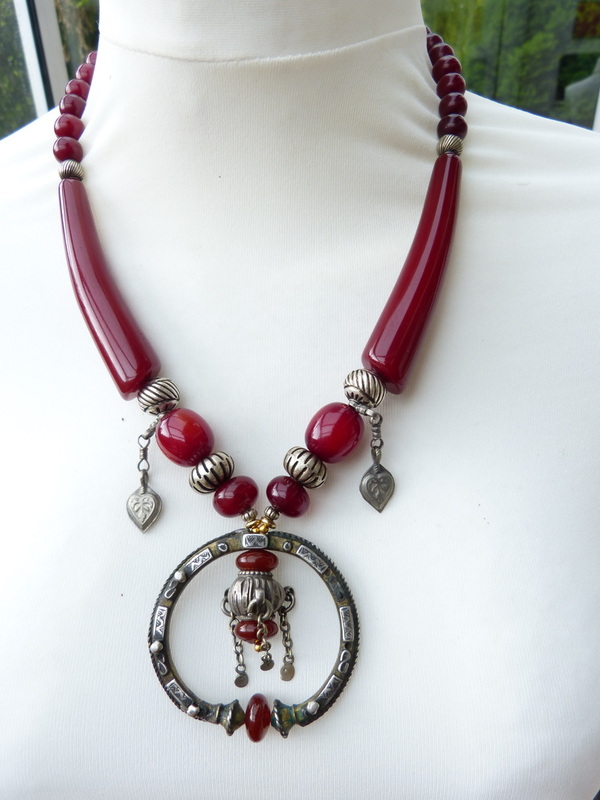 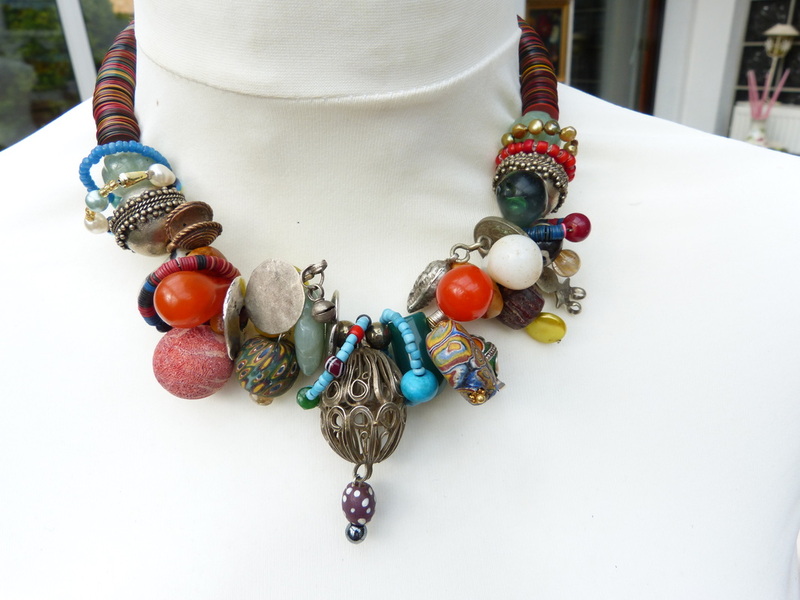 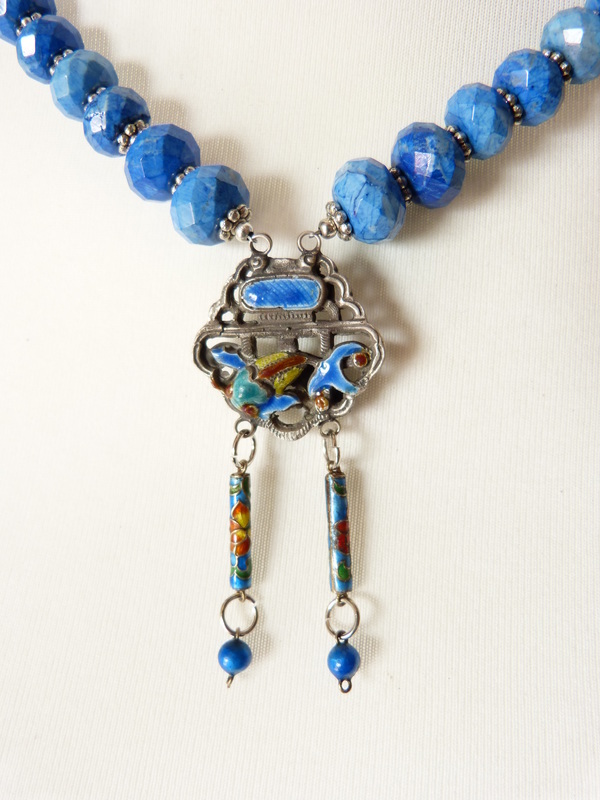 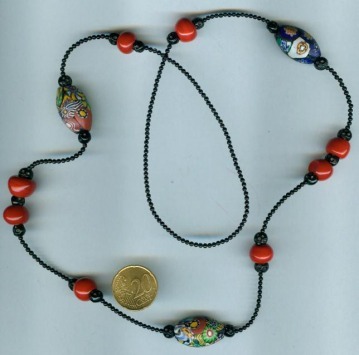 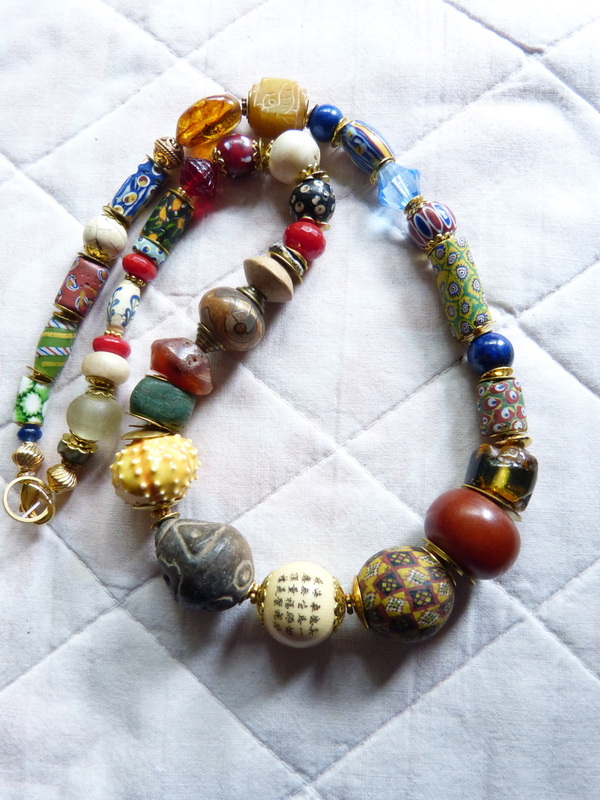 _Exquisite necklace of very rare Venetian millefiori beads and red faceted jasper. 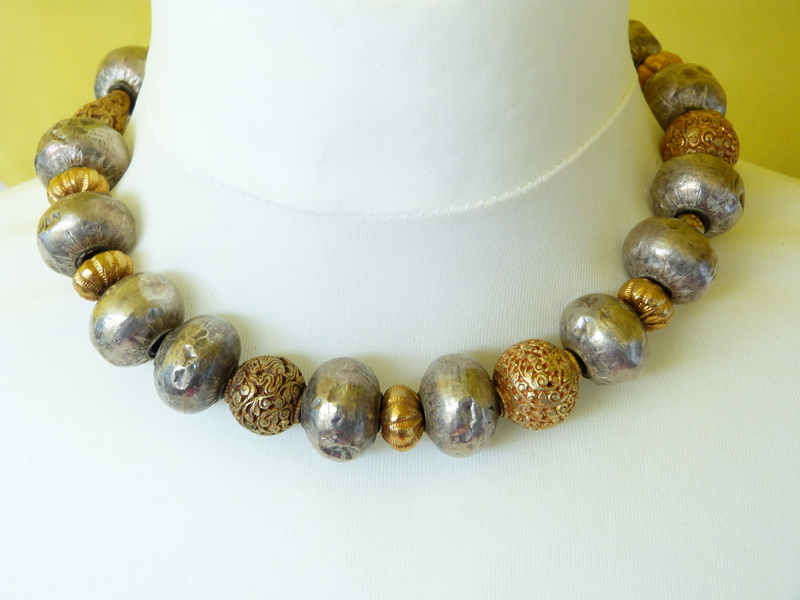 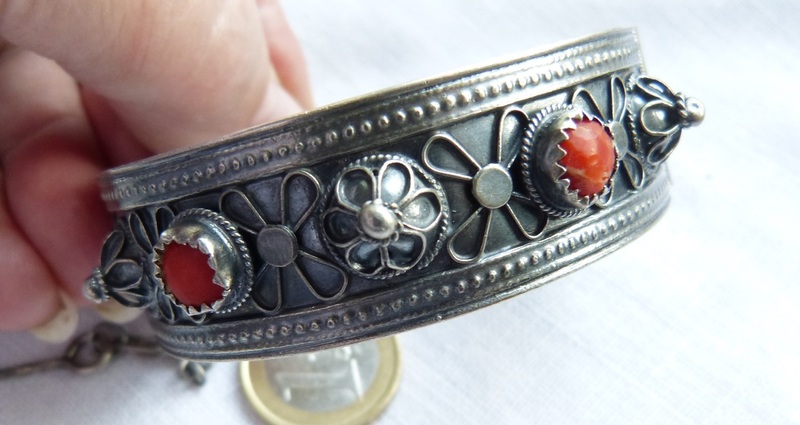 spacers sterling silver round beads and Tibet silver daisy spacers. 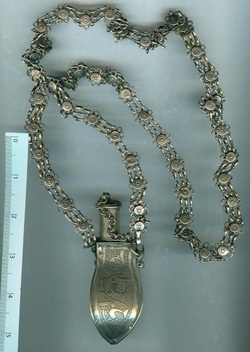 Length 45 cm .